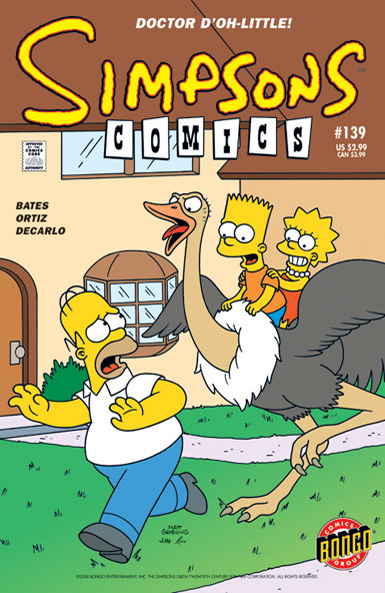 Simpsons Comics is a comic book series from United States, based on the animated TV show The Simpsons, published by Matt Groening's Bongo Comics group. 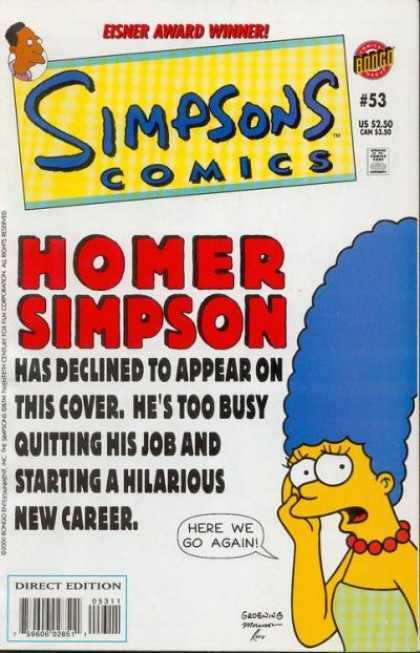 It ended on October 2018. 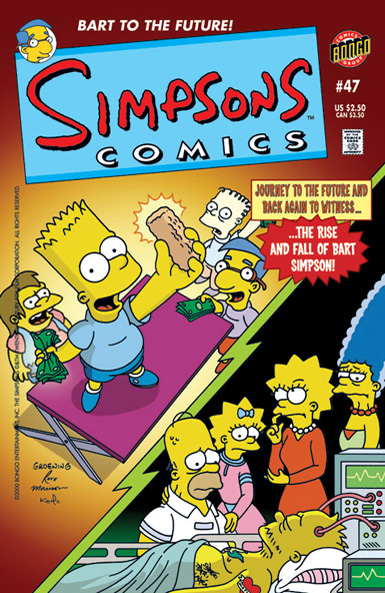 The first issue was published in November 1993. 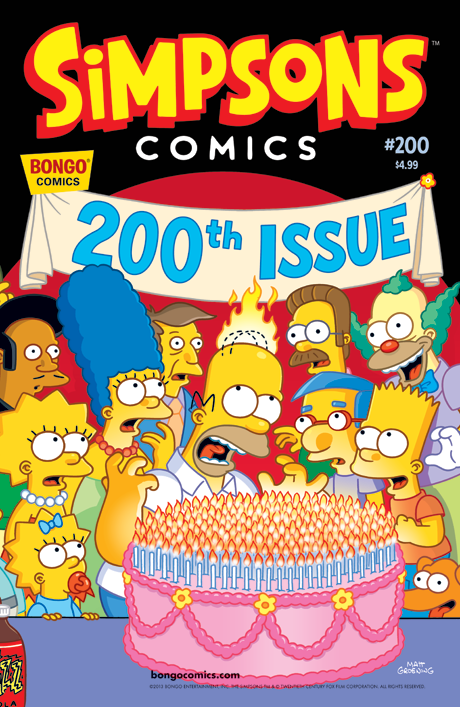 Since then over two hundred issues have been released, with the 100th issue mainly the comic book equivalent of a clip show. 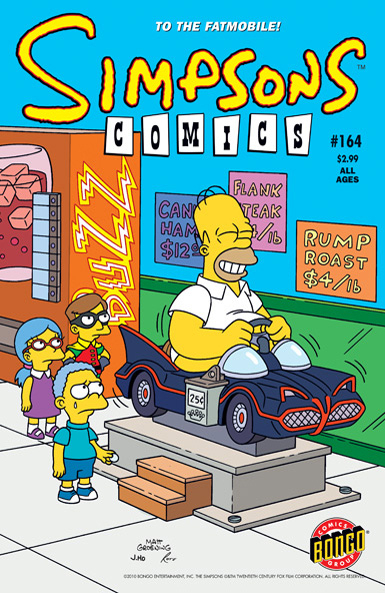 Each issue features a "Junk Mail" section where readers can send in letters and artwork, however it was temporarily discontinued from issues #114-#186. 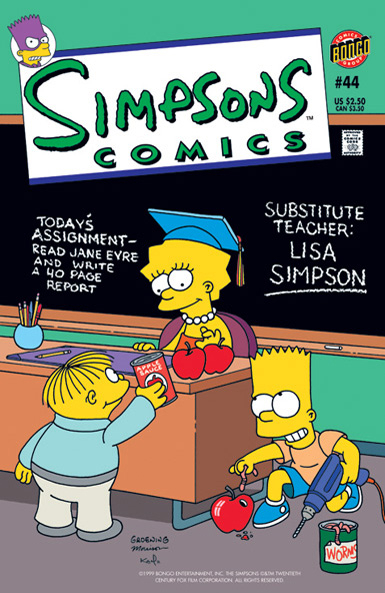 In Australia the comics are mostly identical to the US versions and have been released since 1993. 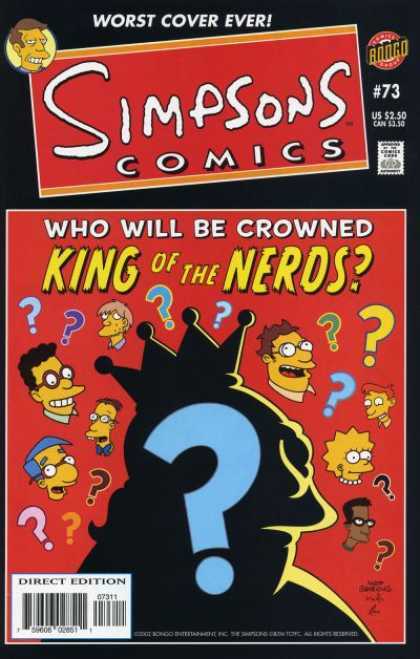 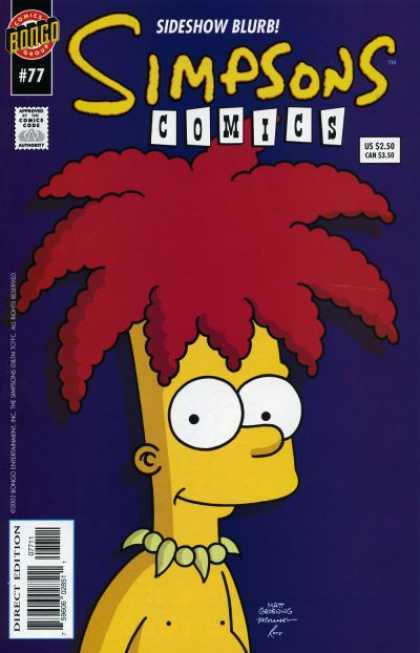 Since February 1997, the comic has had a monthly United Kingdom edition. 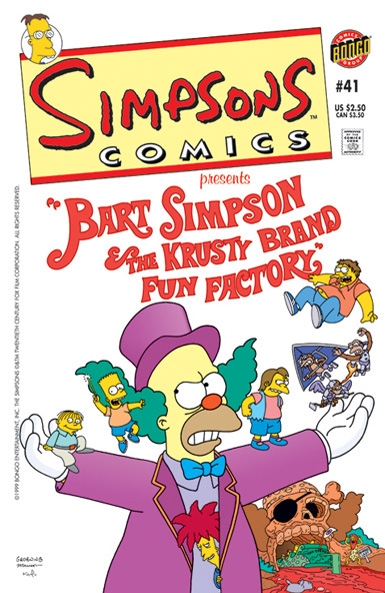 This mainly reprints the strips from the U.S. edition but with a number of differences such as slightly different cover designs. 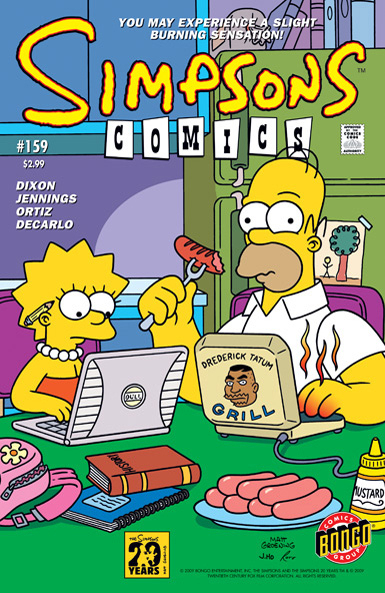 Junk Mail has been featured in every UK issue (with the exception of issue #1). 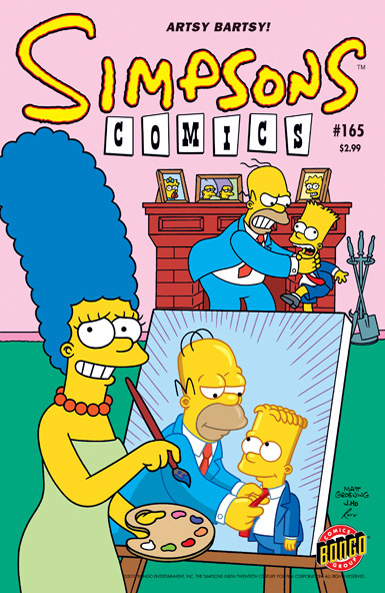 Also formerly published was Simpsons Classics, which reprinted strips from earlier issues of Simpsons Comics. 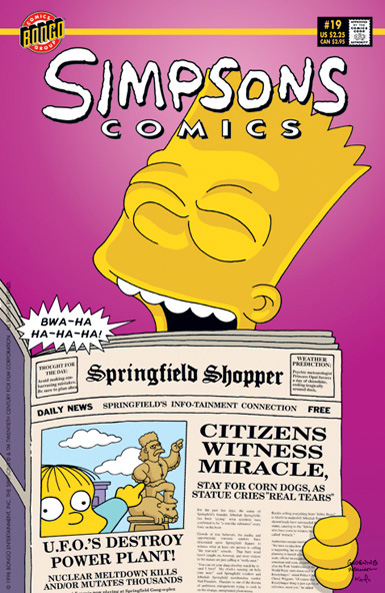 The stories have, however, been reprinted in trade paperbacks by Harper Perennial since 1995. 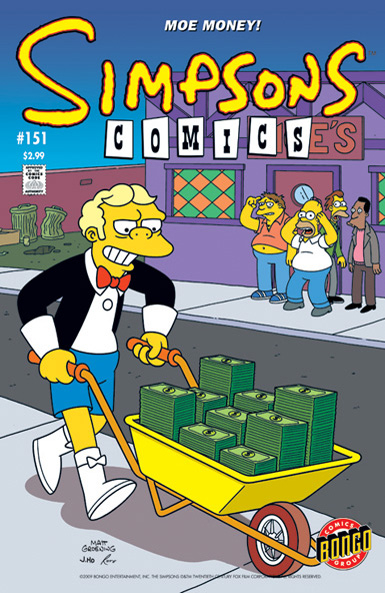 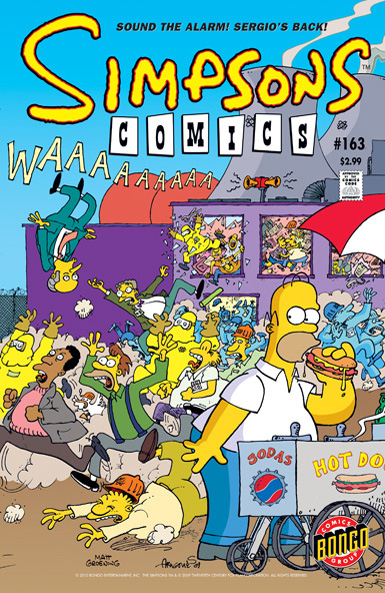 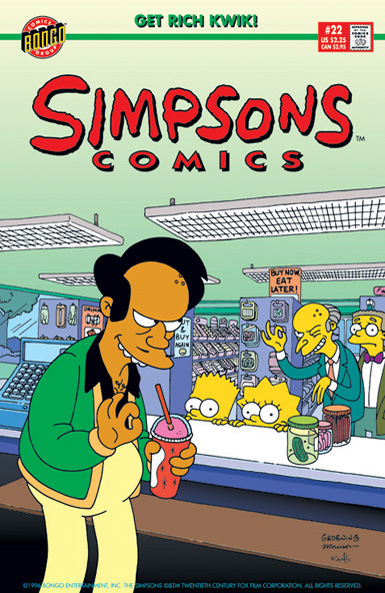 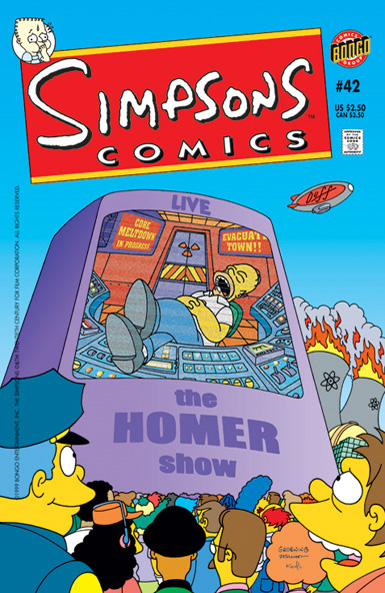 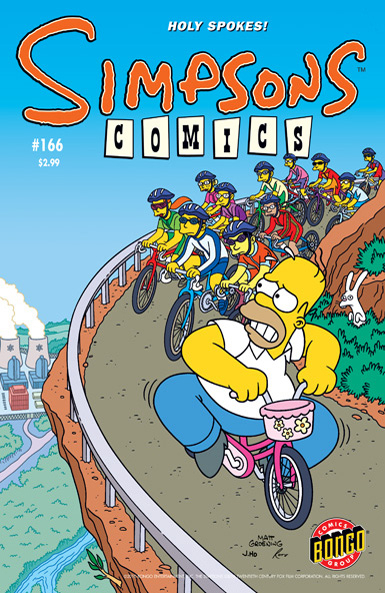 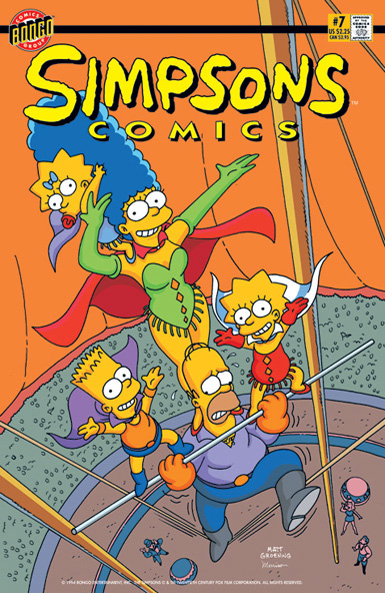 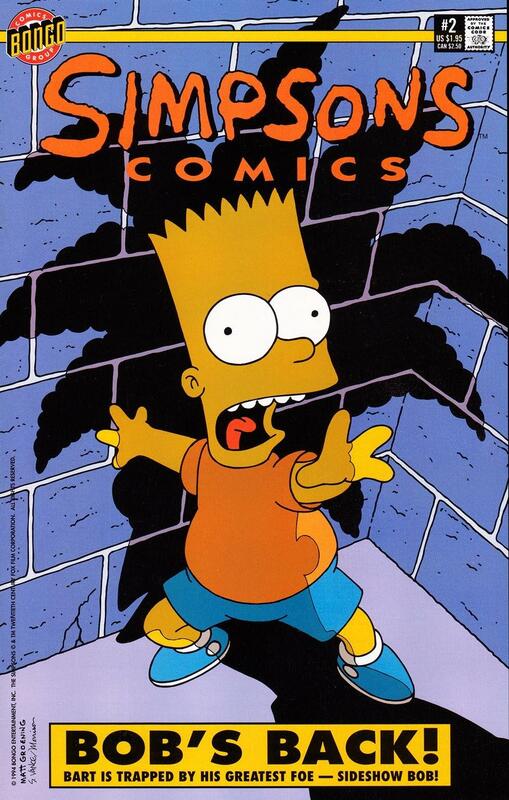 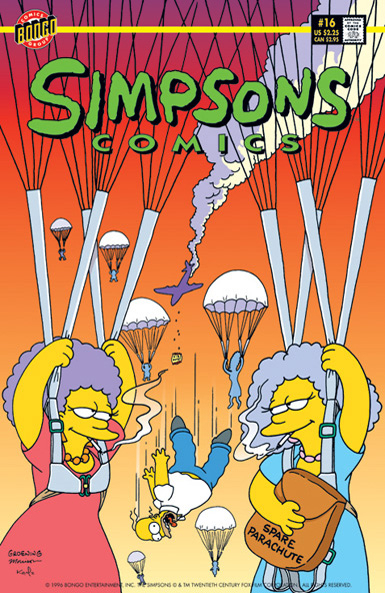 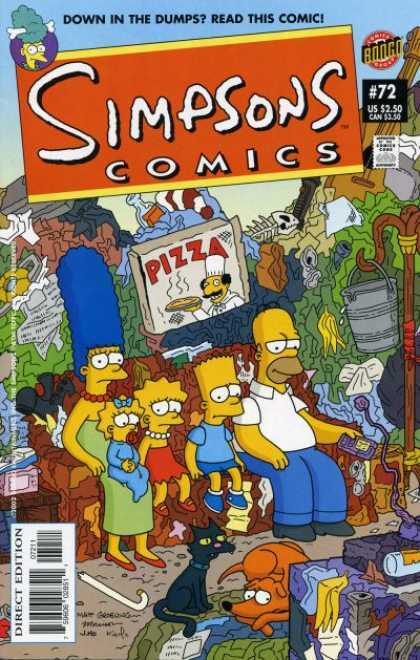 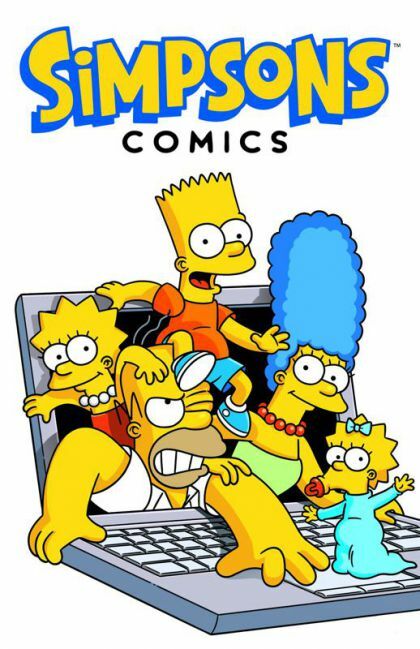 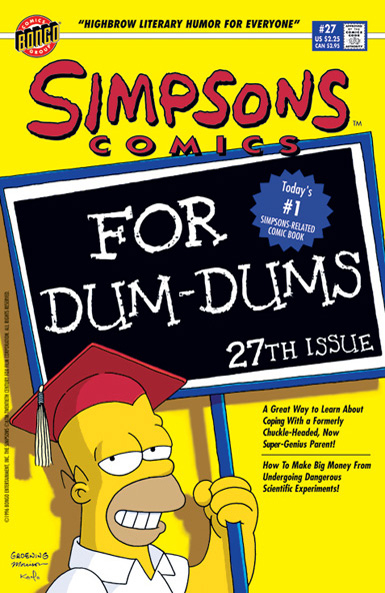 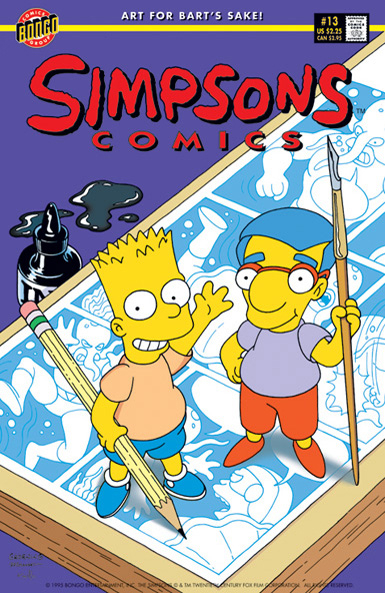 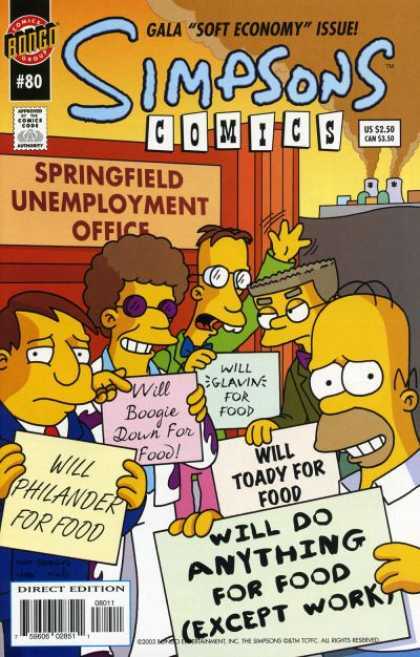 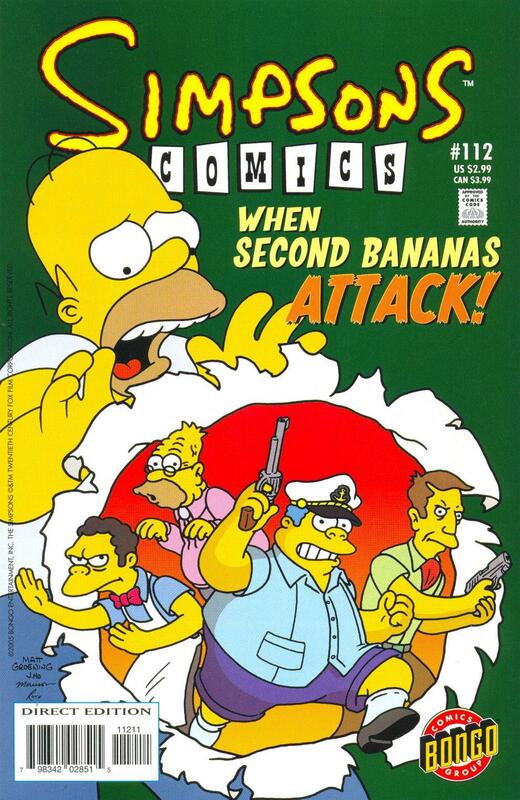 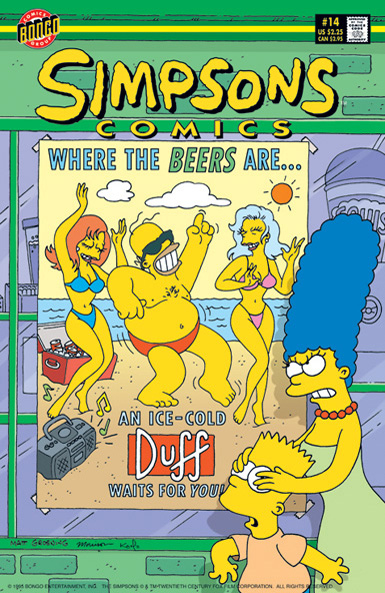 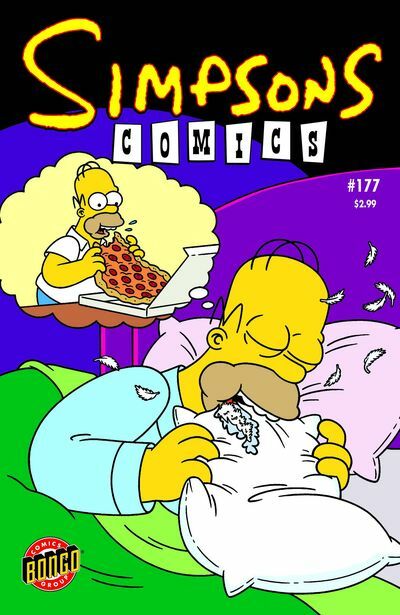 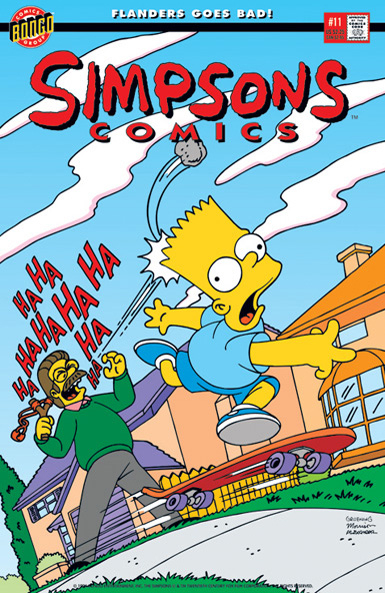 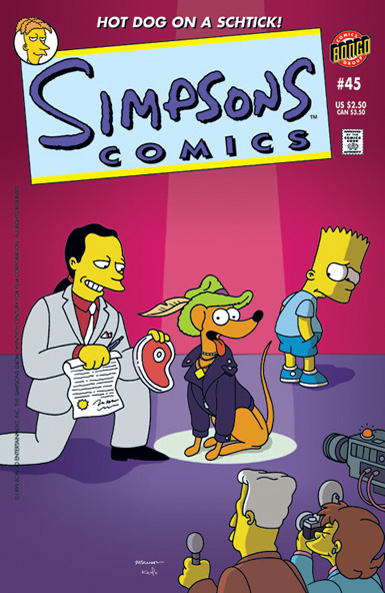 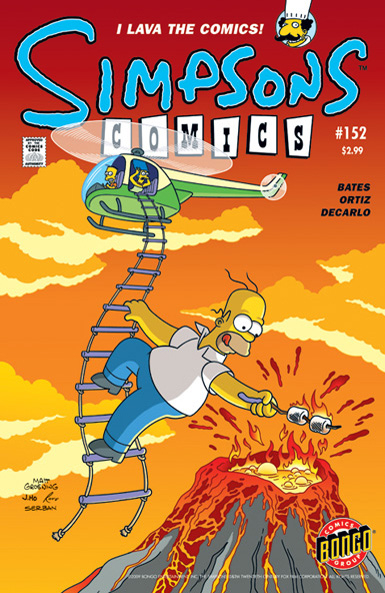 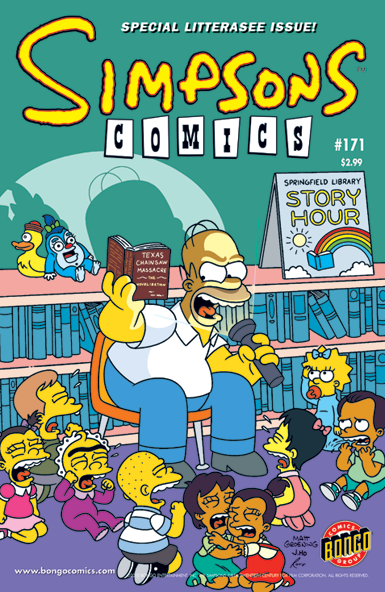 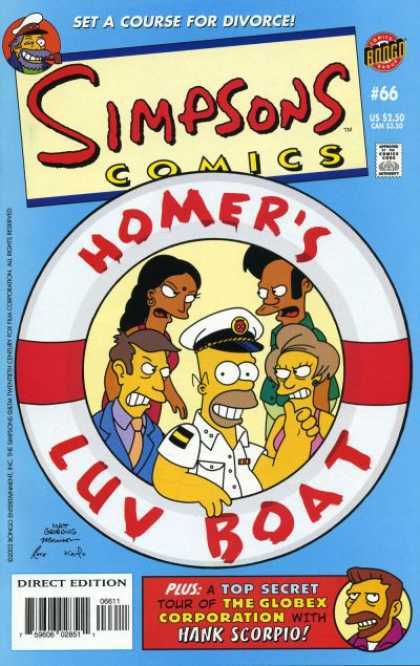 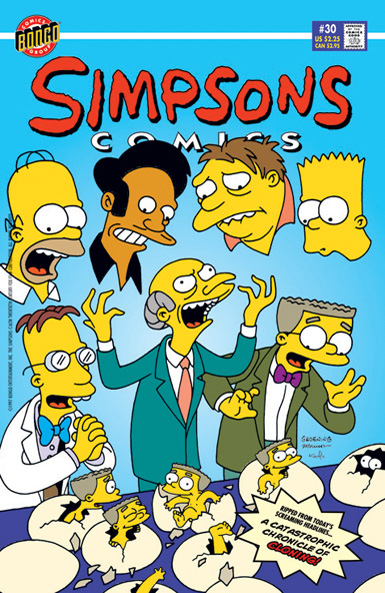 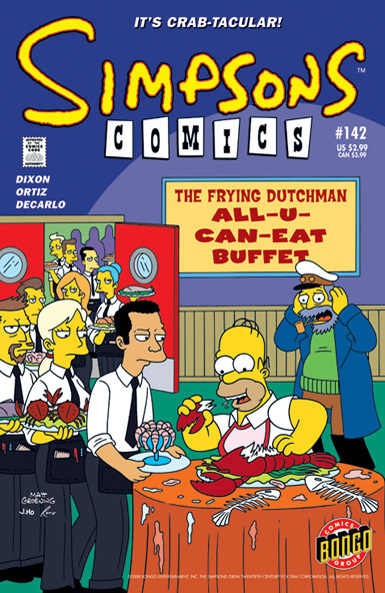 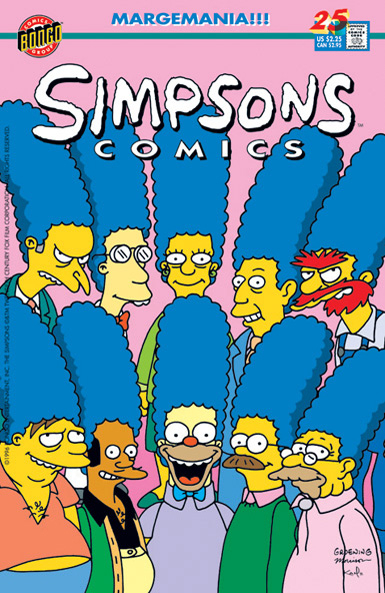 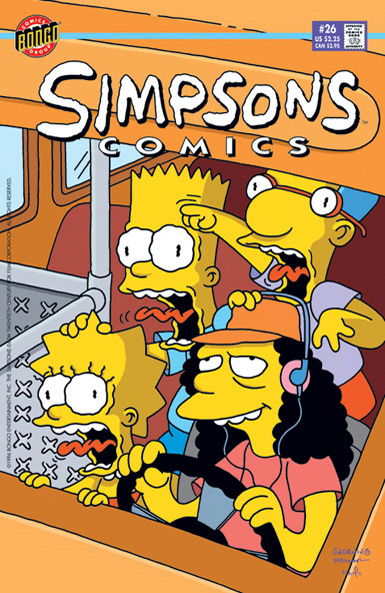 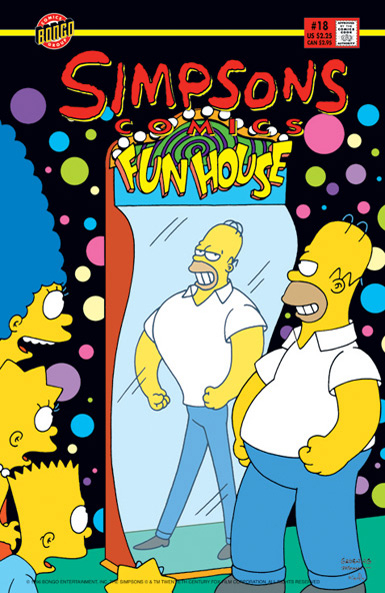 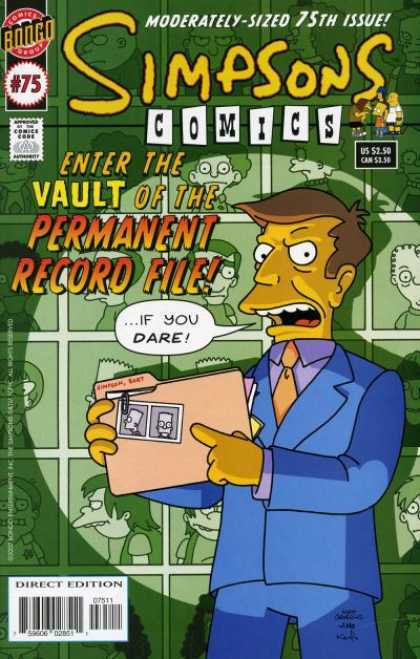 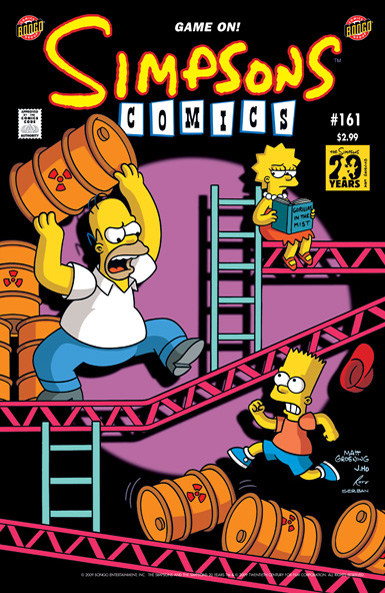 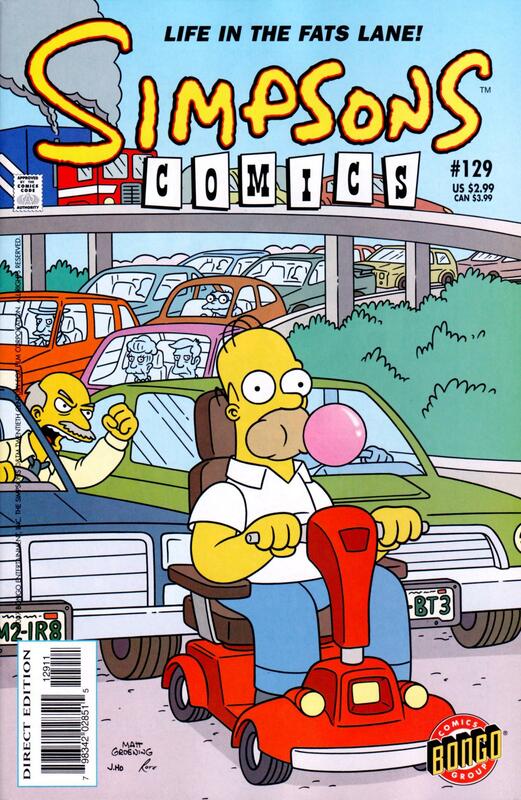 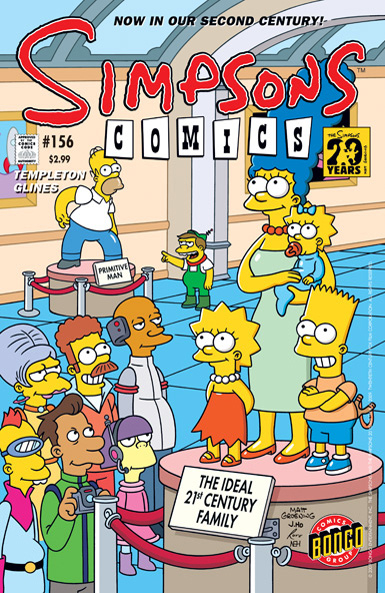 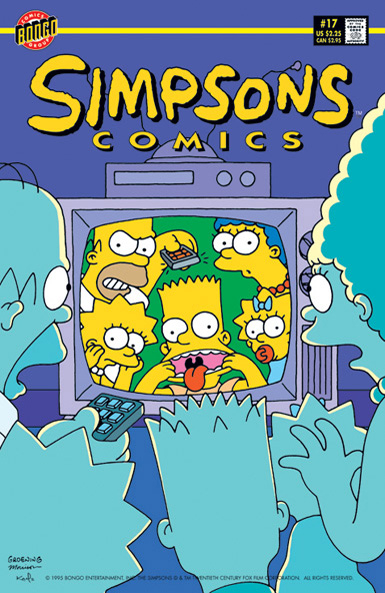 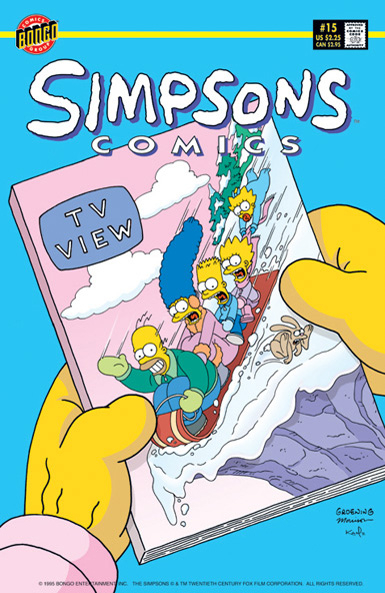 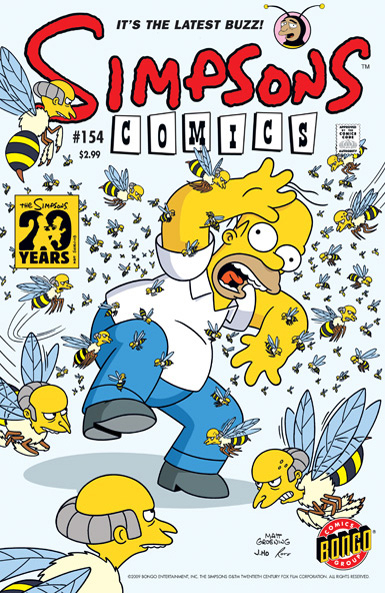 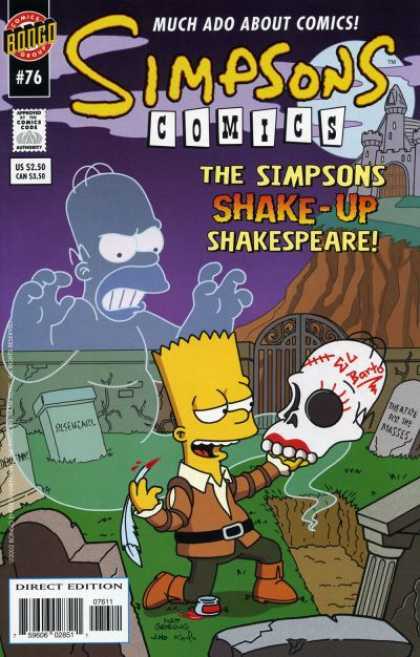 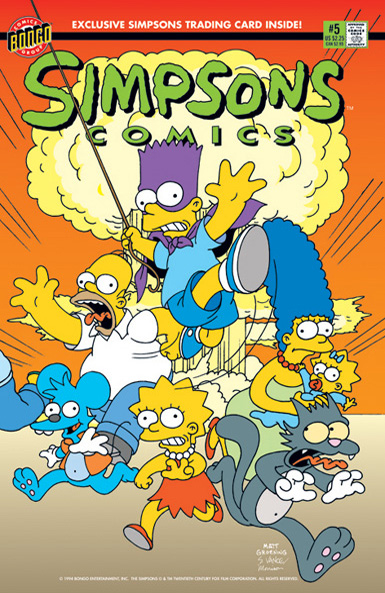 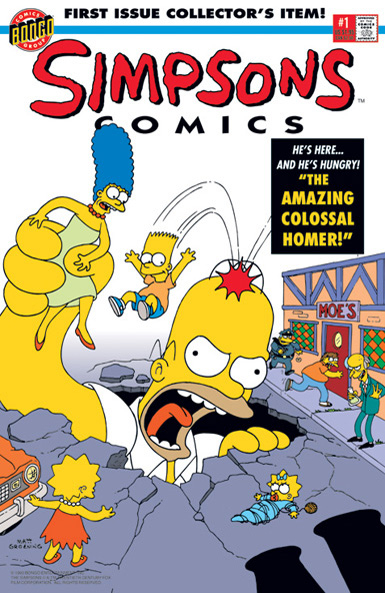 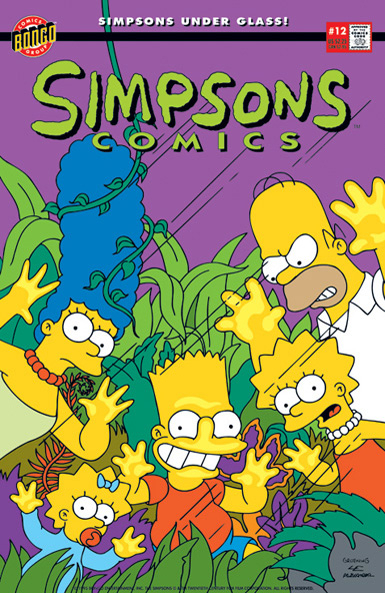 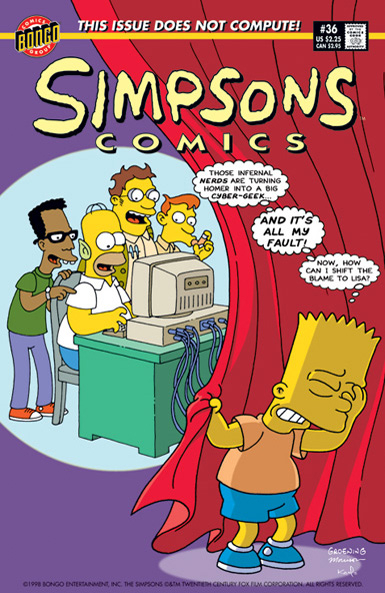 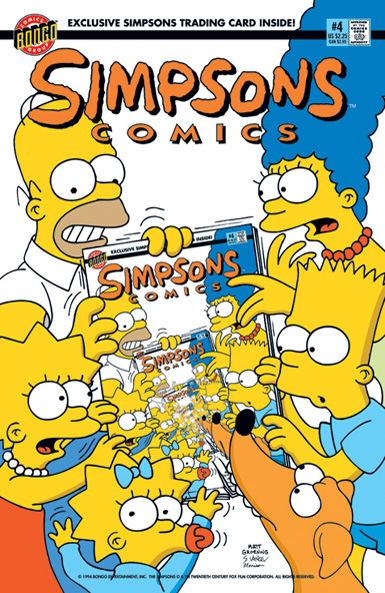 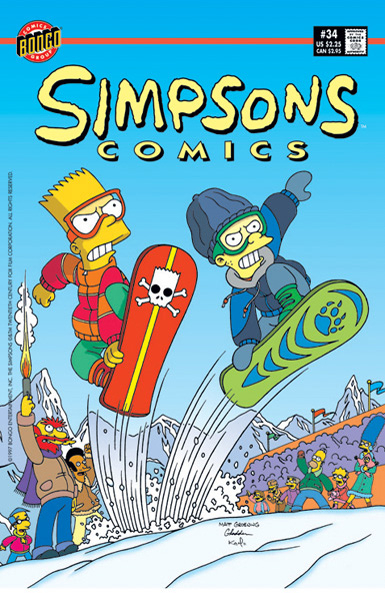 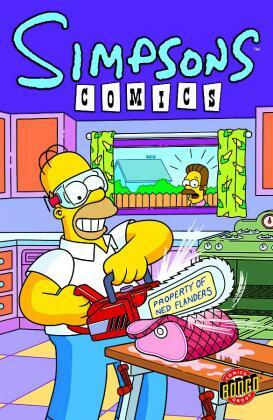 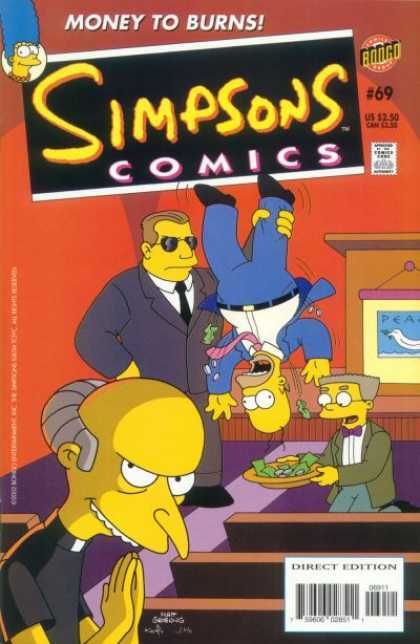 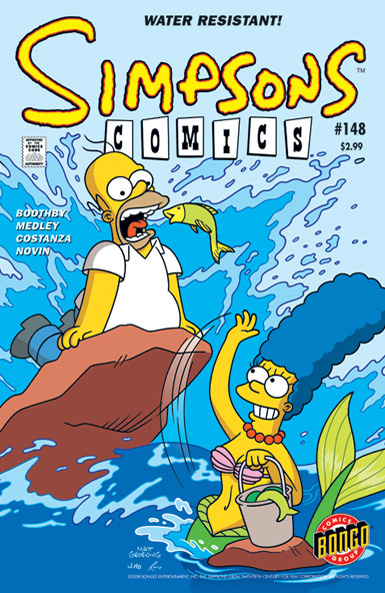 From 1994 to 1999, excerpts from Simpsons Comics were printed in Disney Adventures, although Disney had no ownership of the franchise until 2019, as part of the buyout of 21st Century Fox. 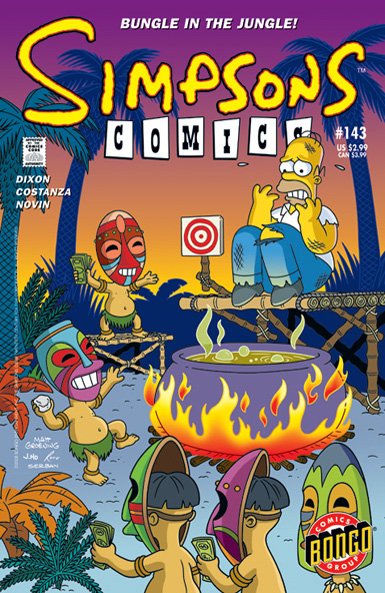 In the Latin edition, the magazines first published by the Mexican Grupo editorial vid, started in the same order in February, 1996. 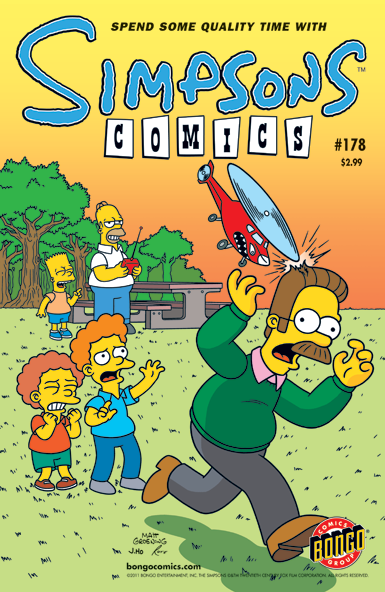 Angry Dad comic strips regularly feature in the Australian addition. 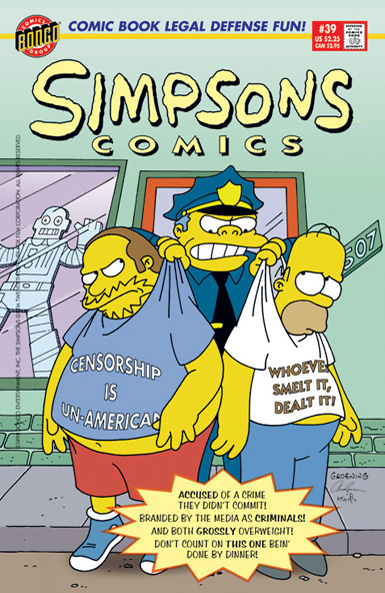 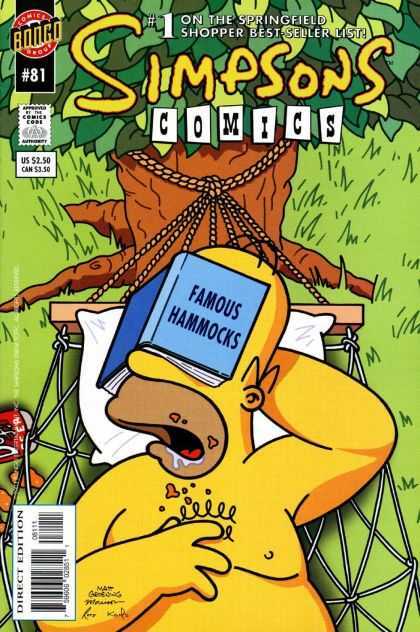 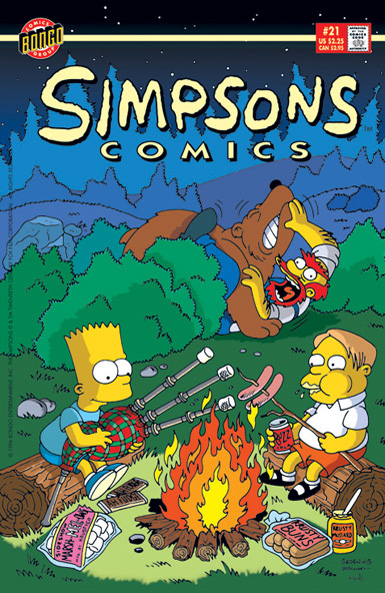 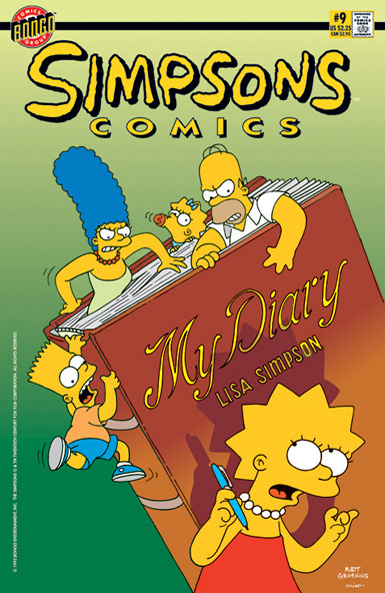 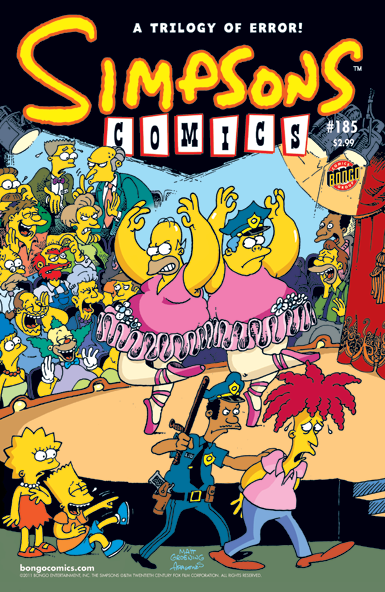 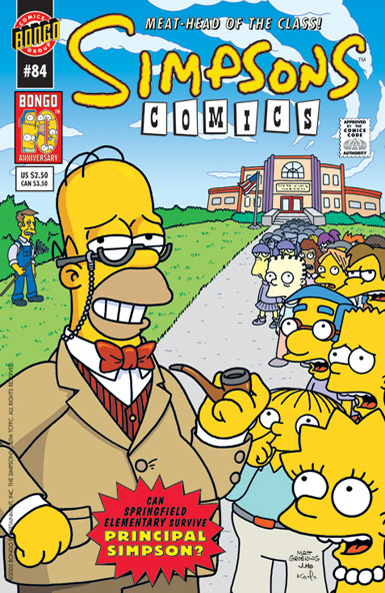 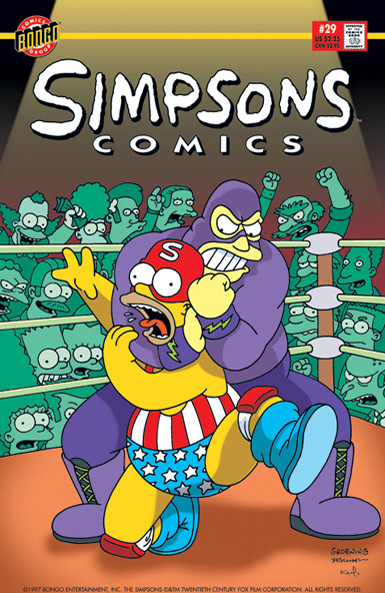 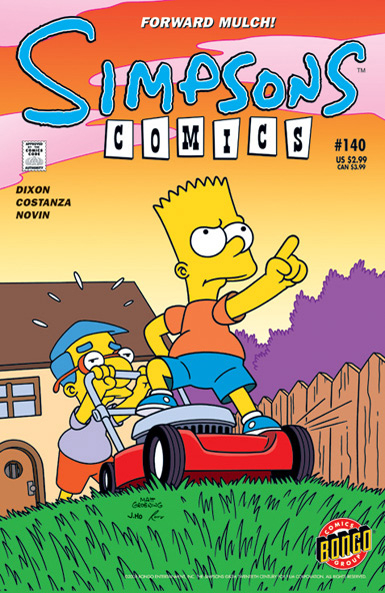 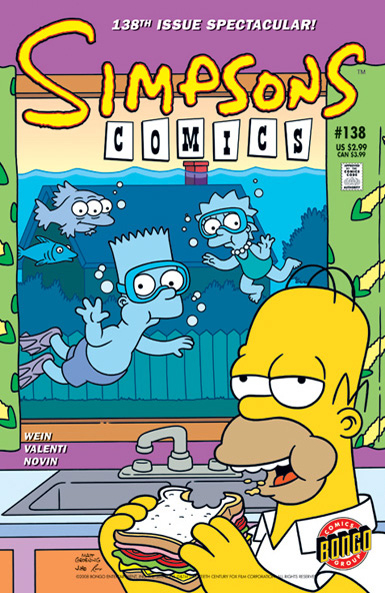 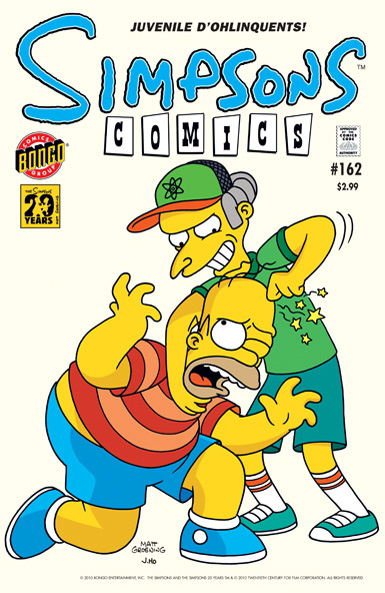 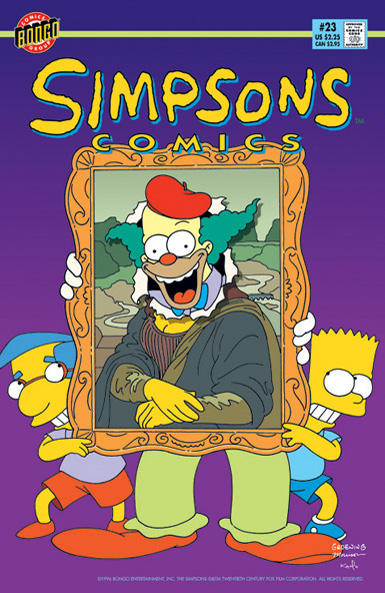 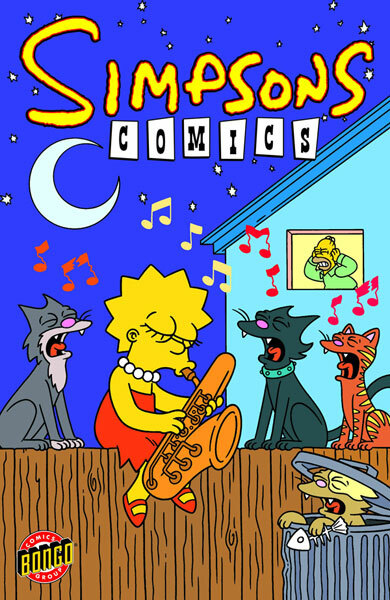 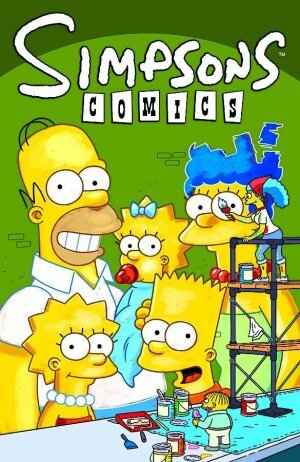 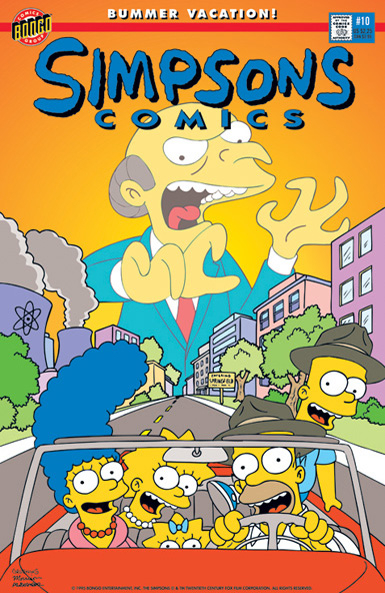 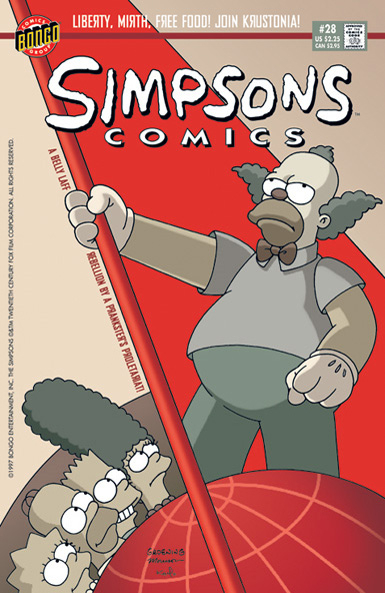 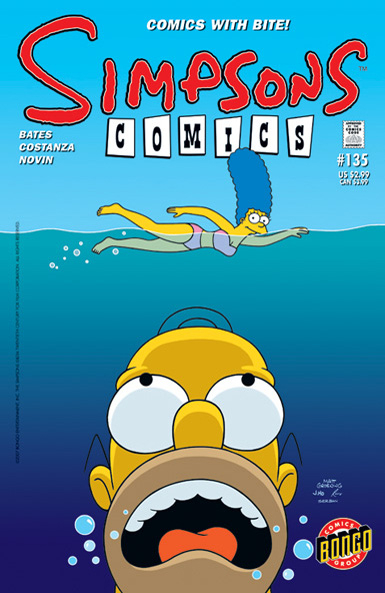 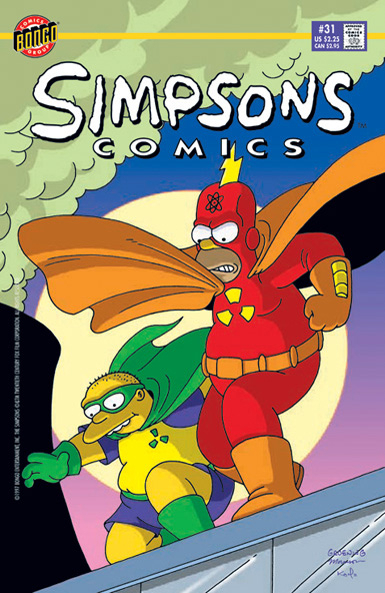 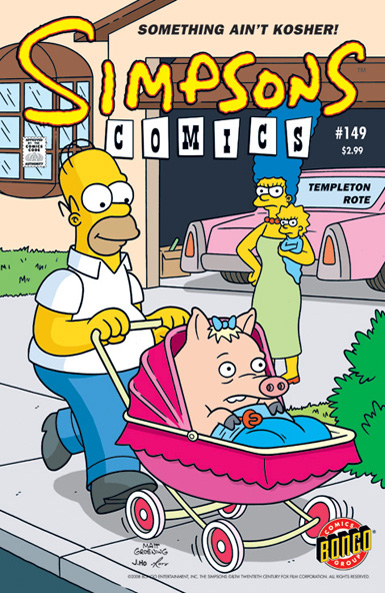 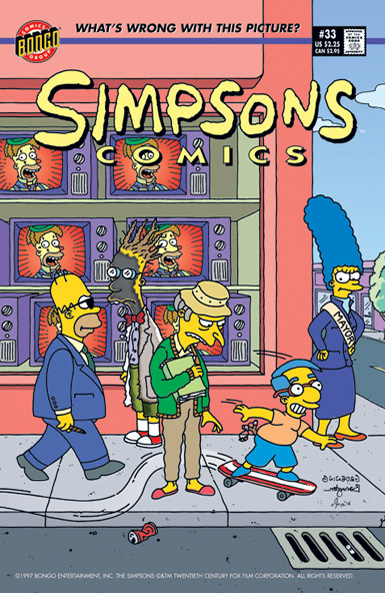 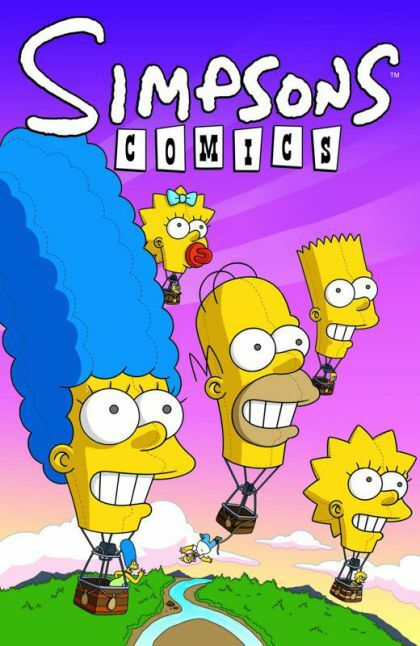 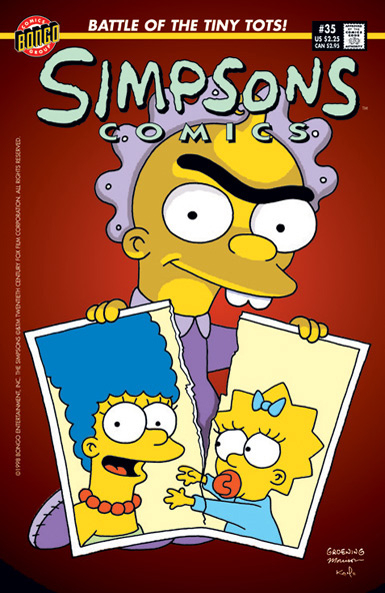 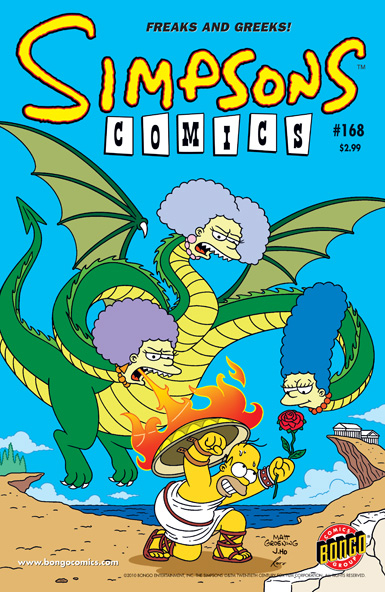 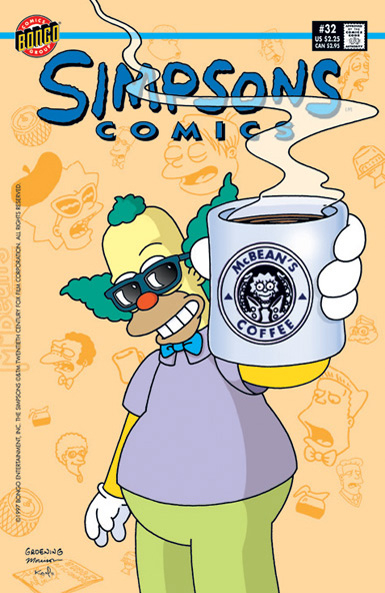 As of November 2007, Simpsons Comics are published in Serbia by Večernje novosti. 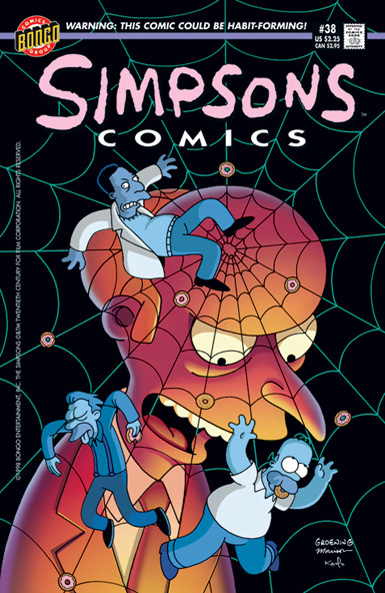 In January 2012, the logo and design changed. 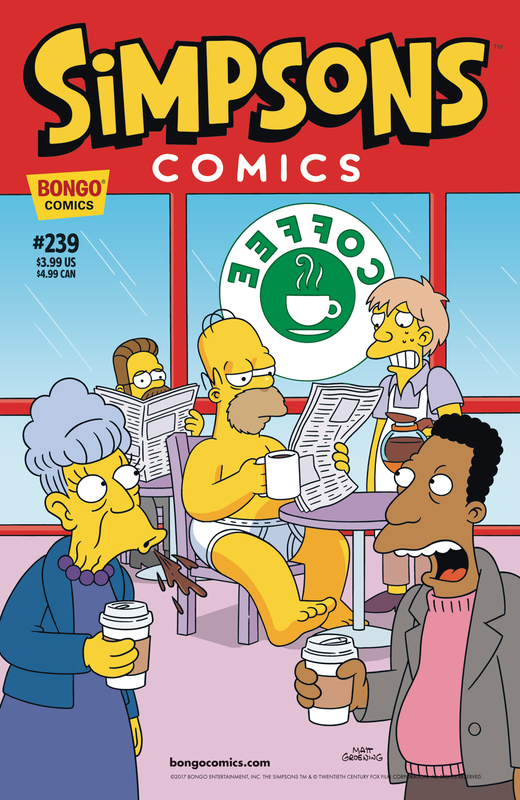 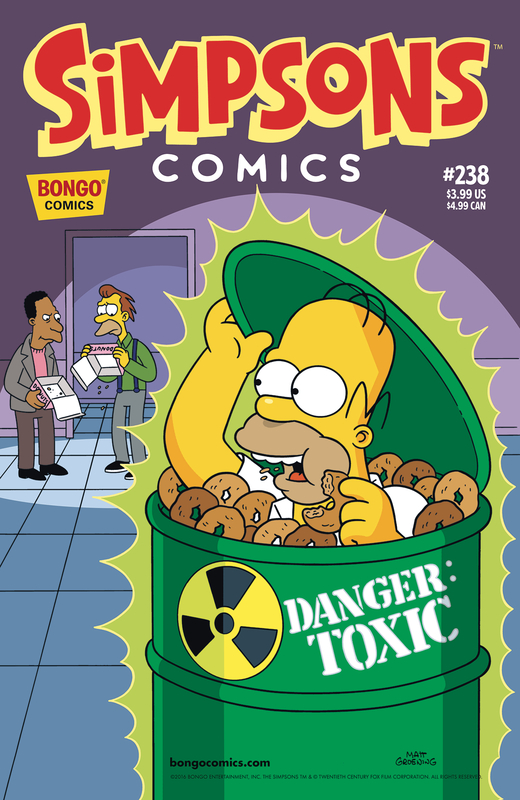 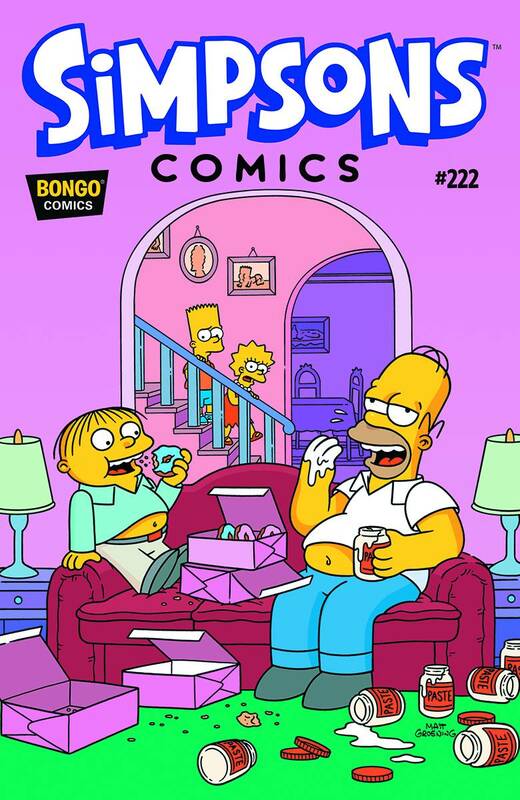 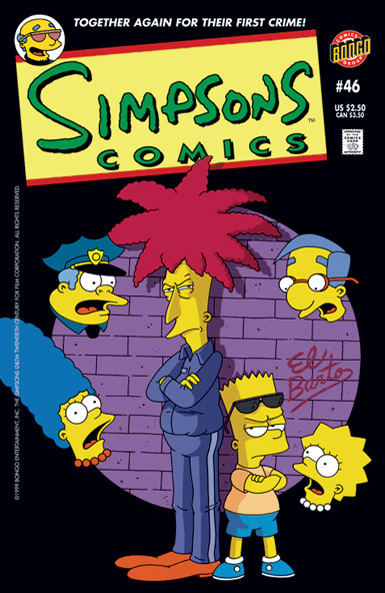 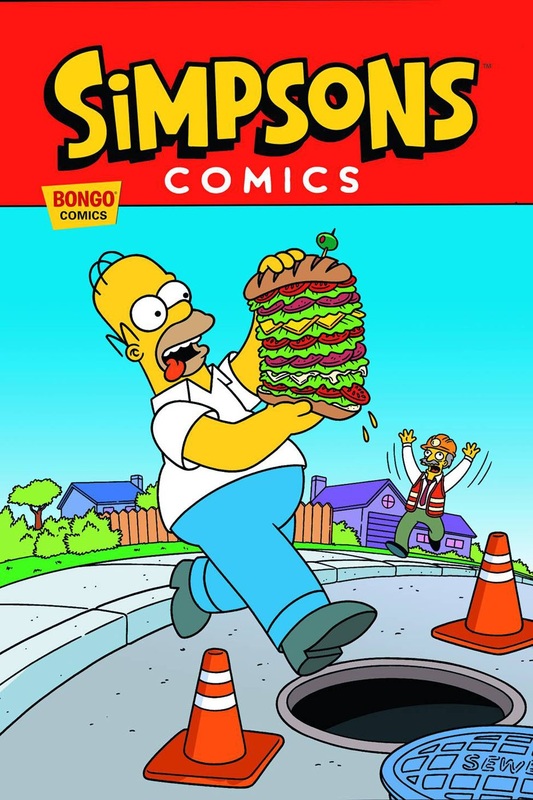 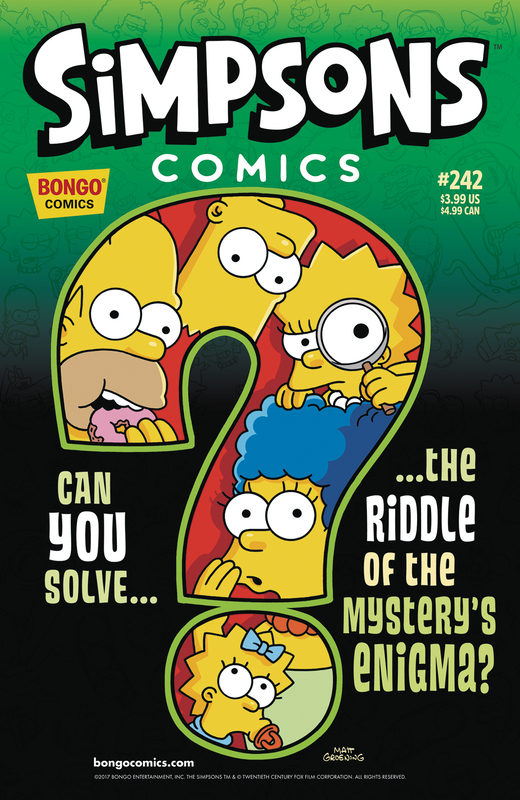 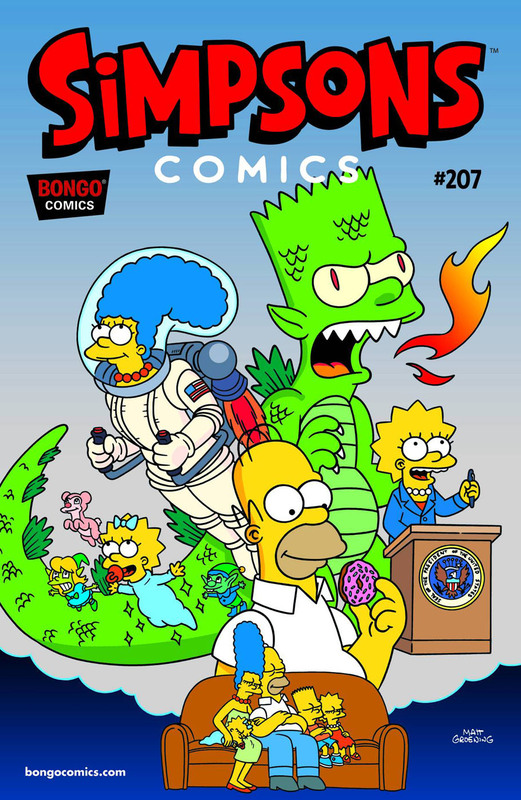 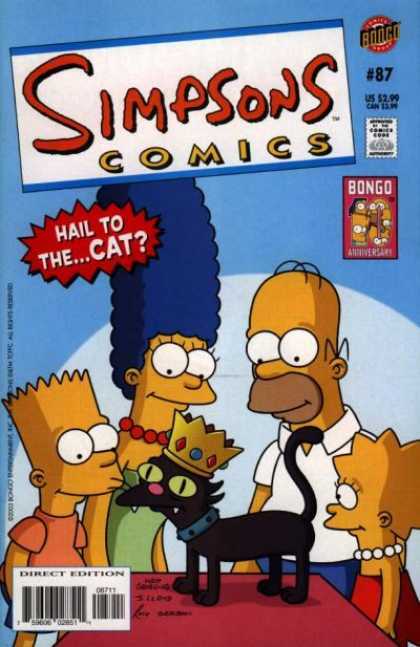 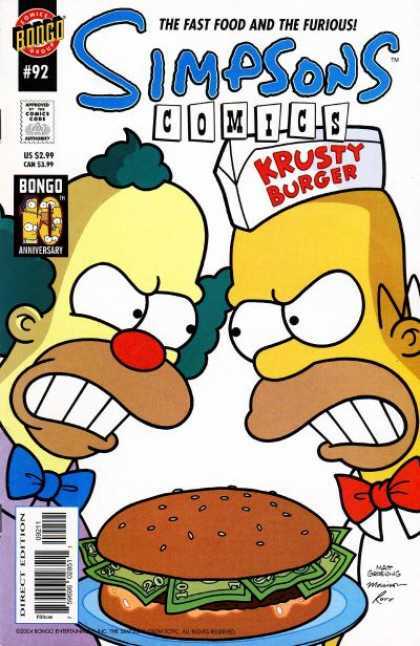 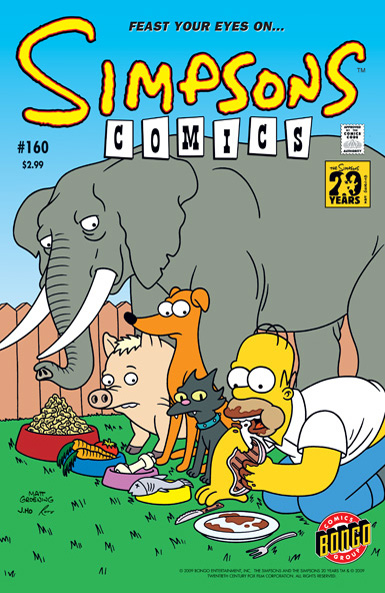 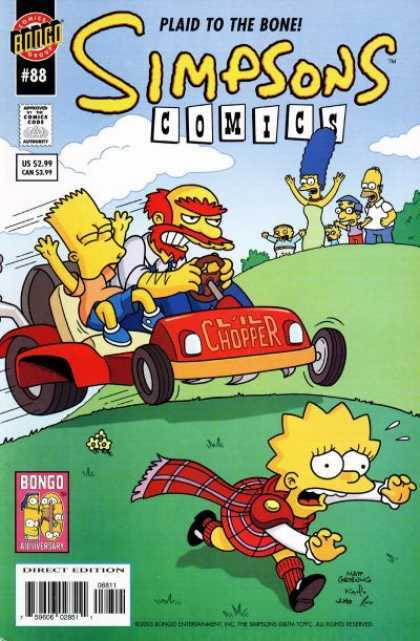 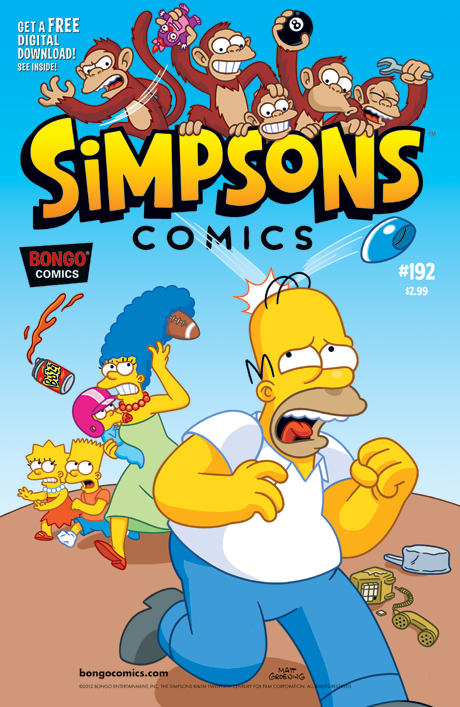 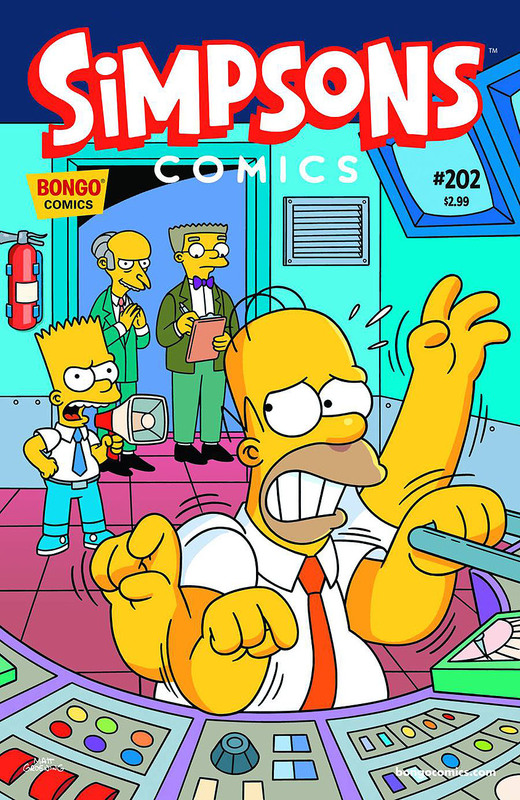 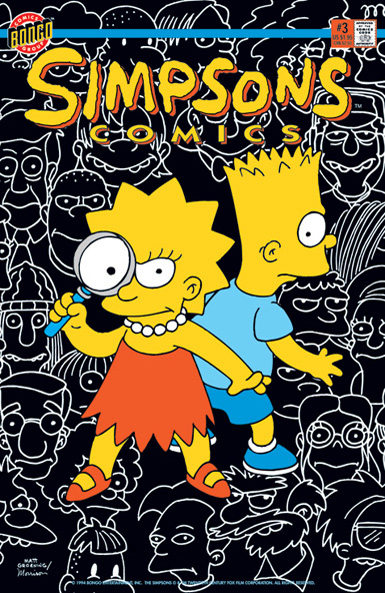 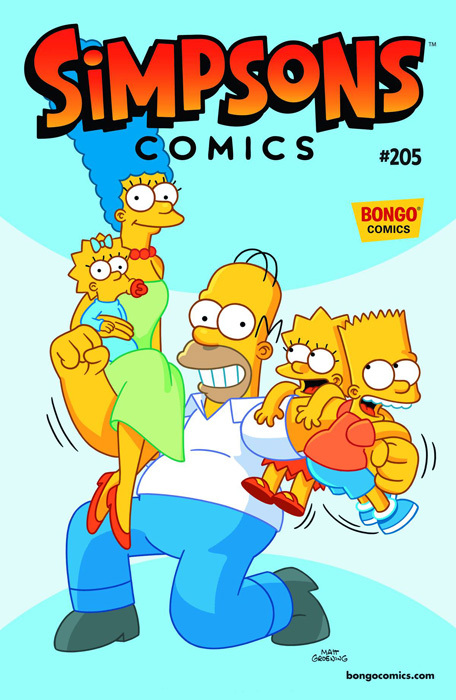 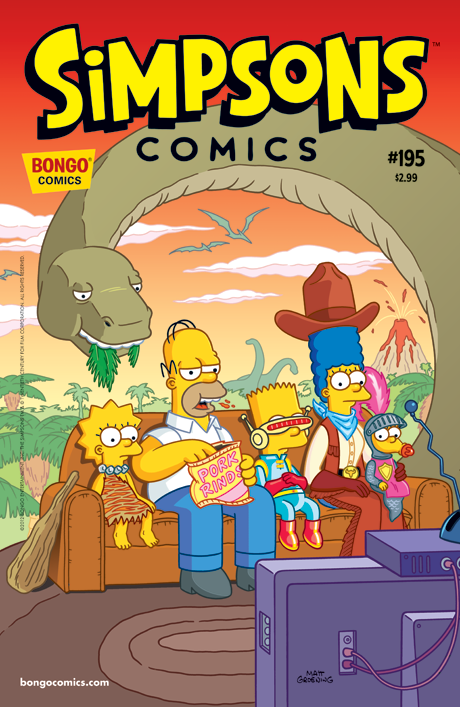 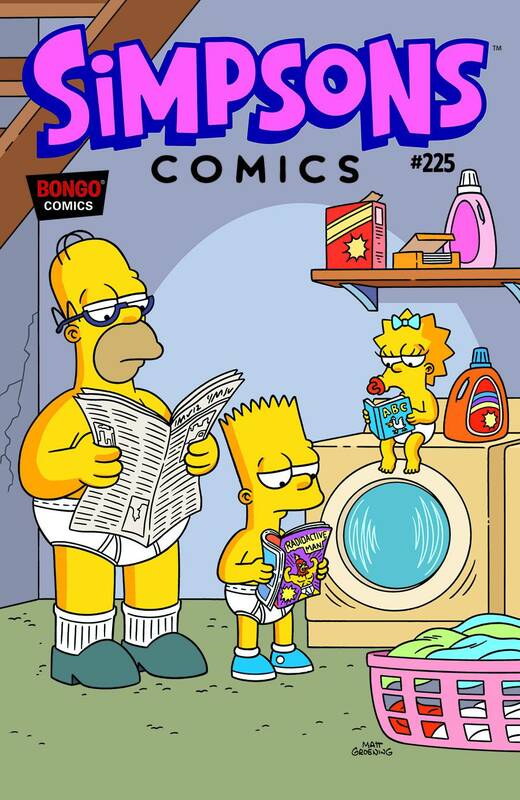 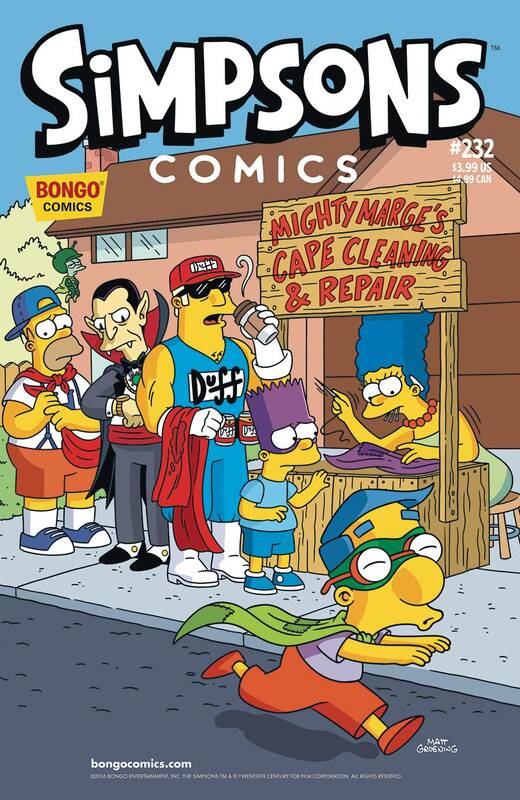 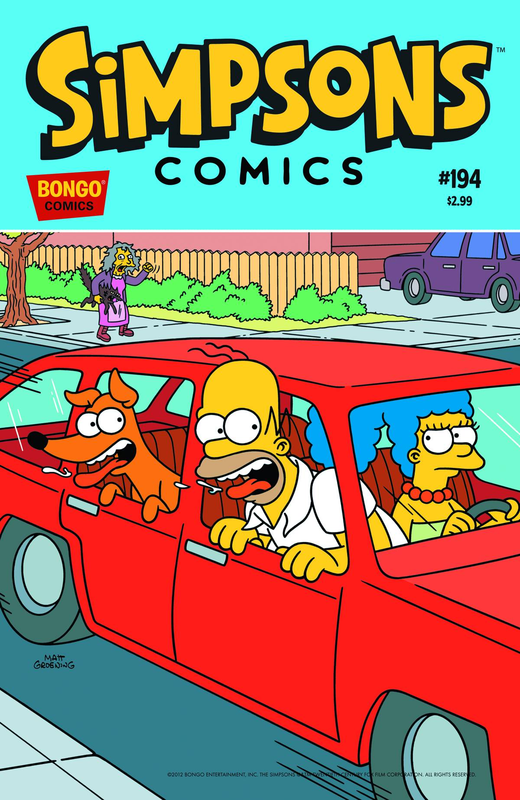 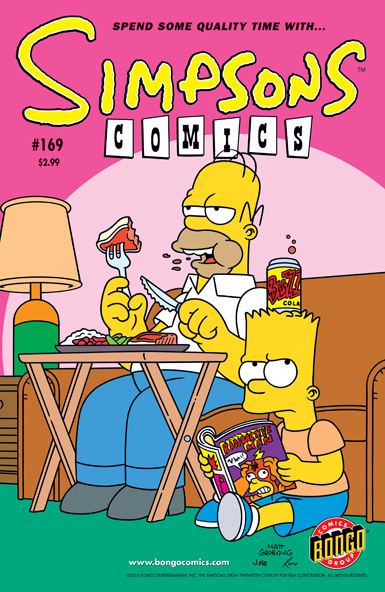 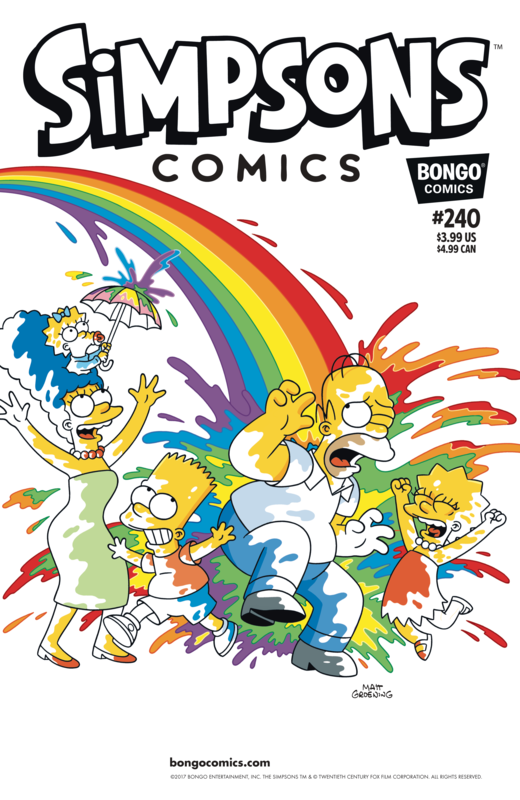 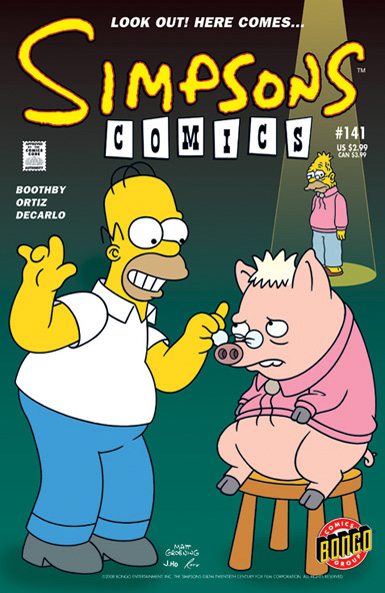 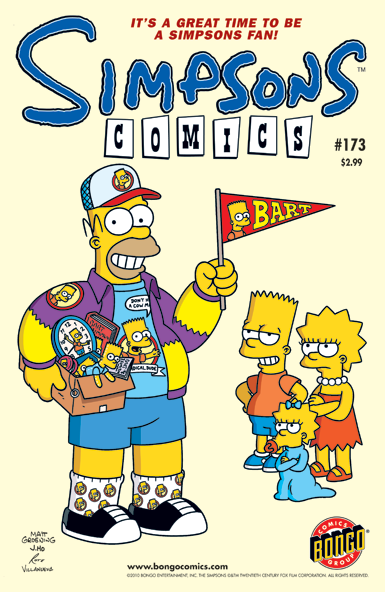 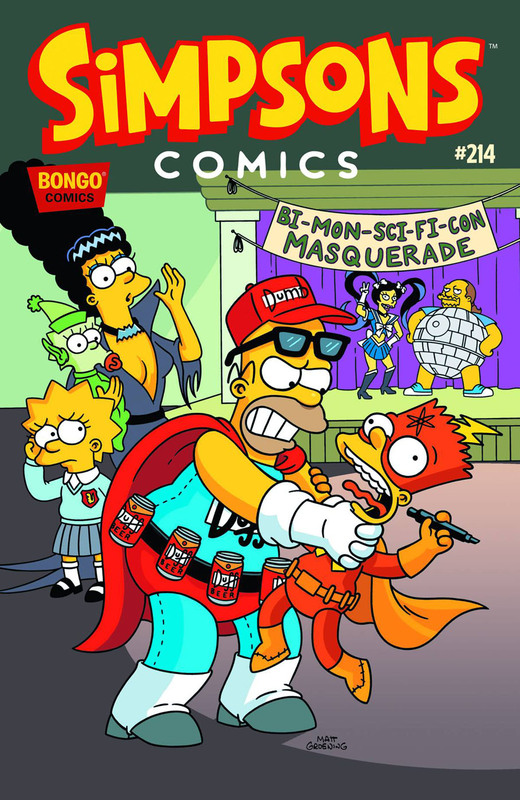 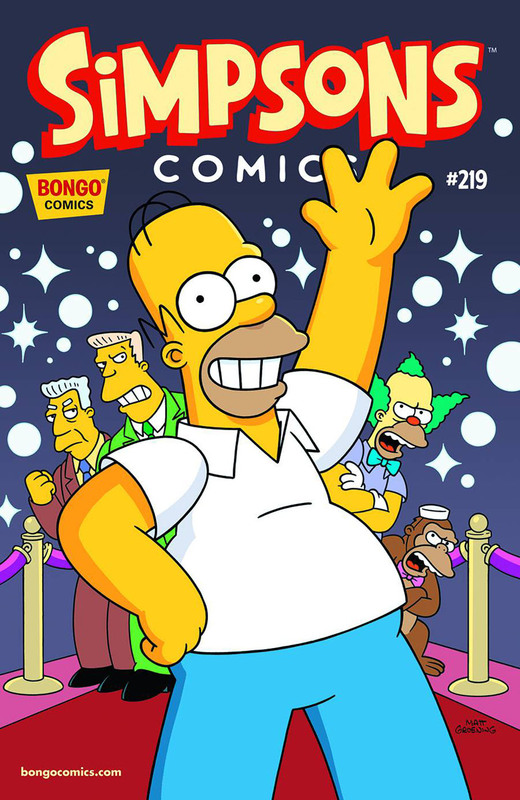 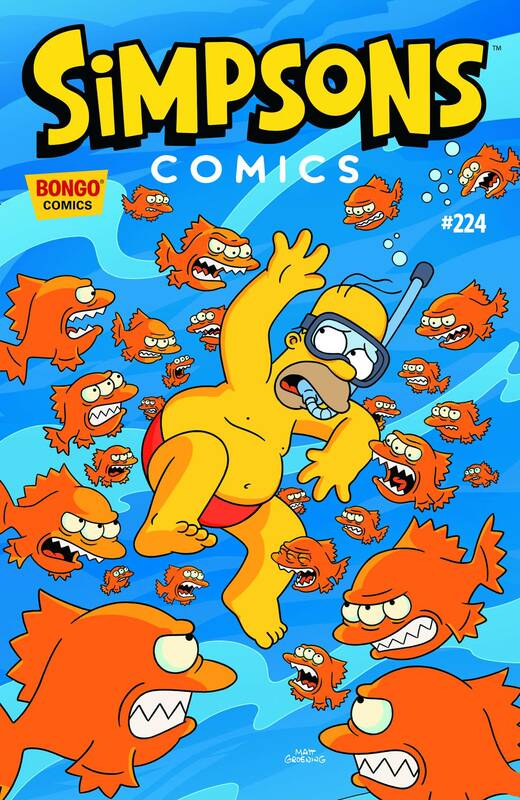 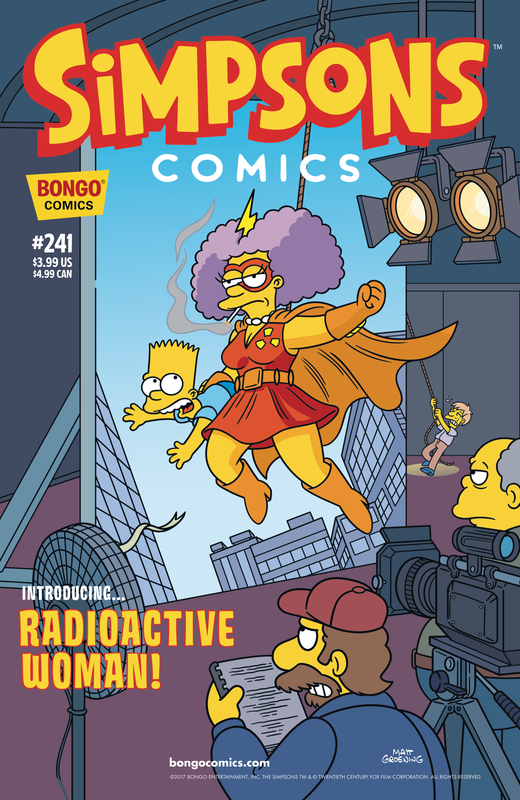 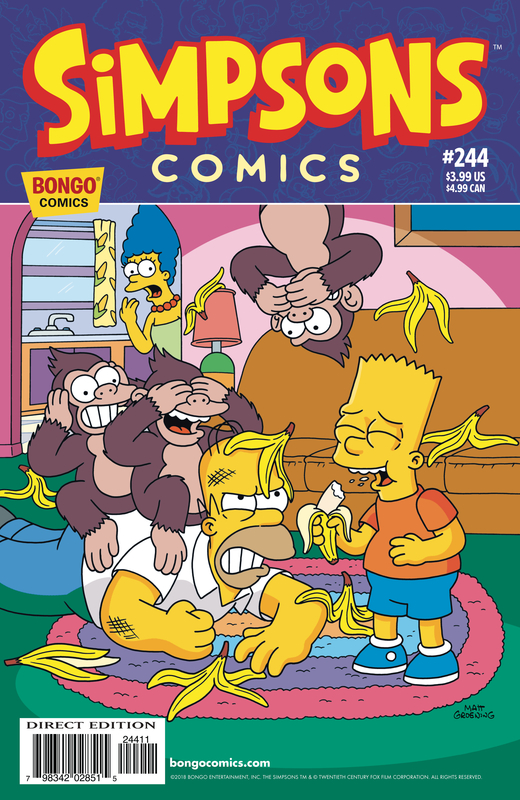 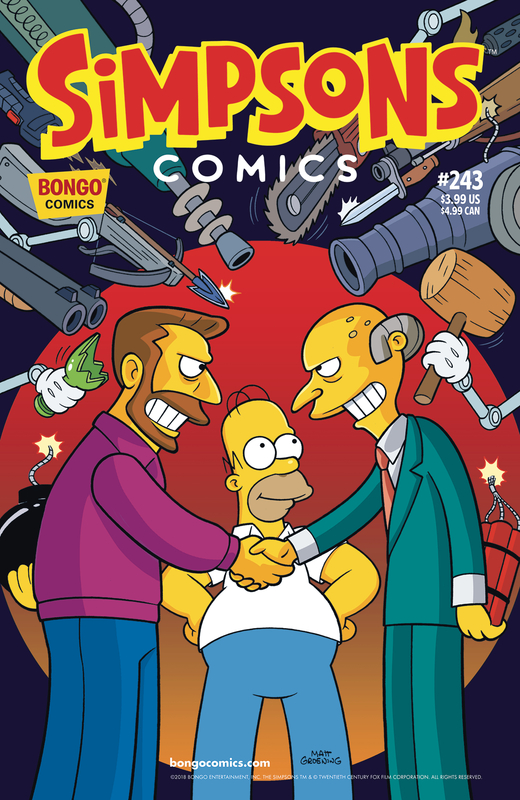 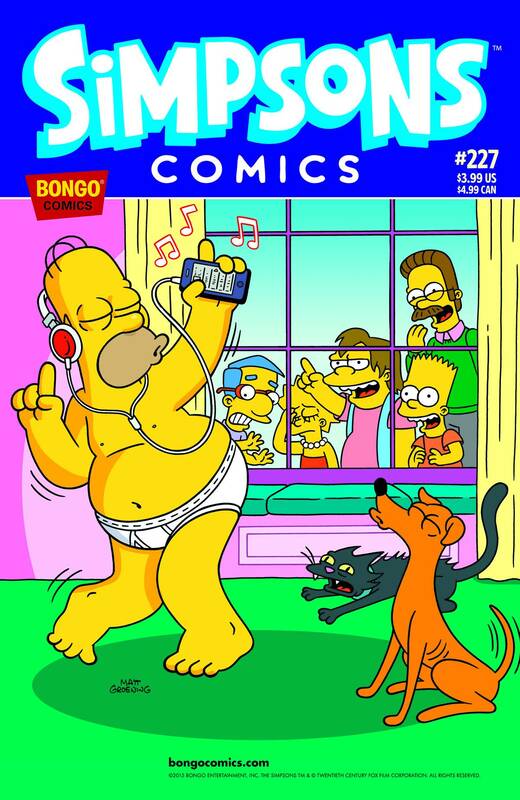 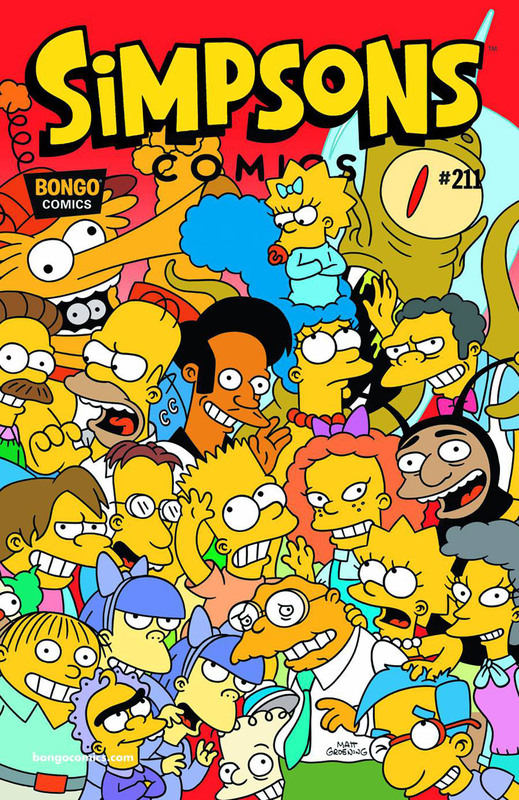 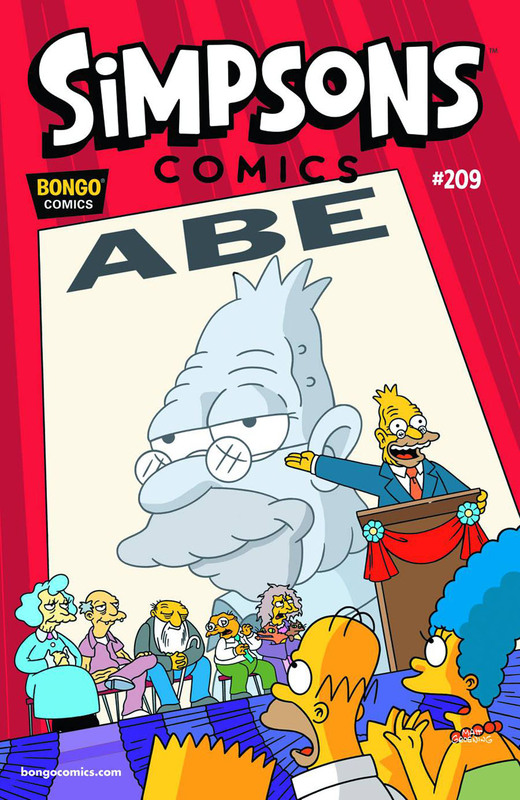 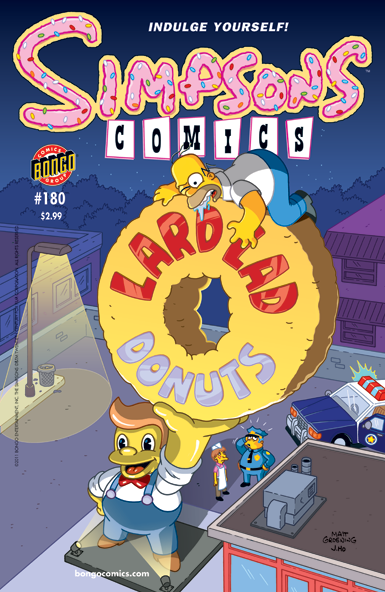 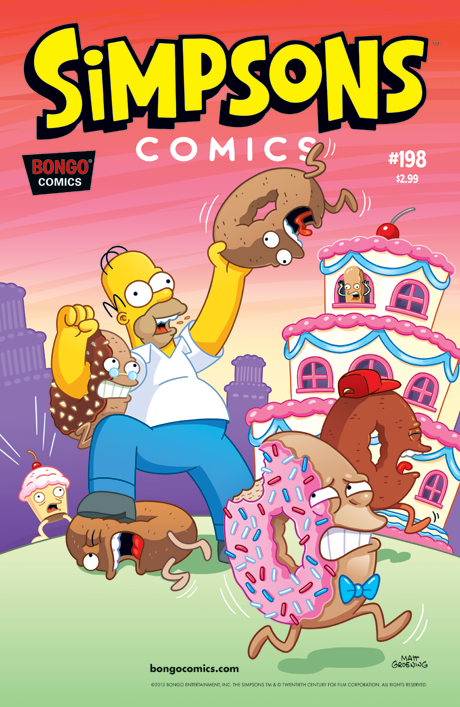 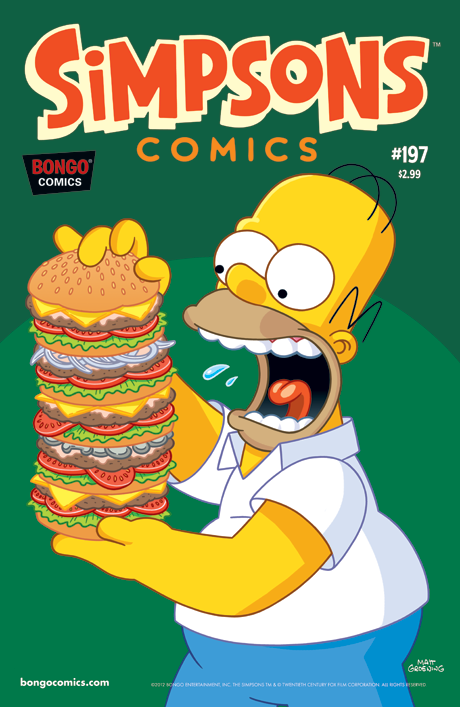 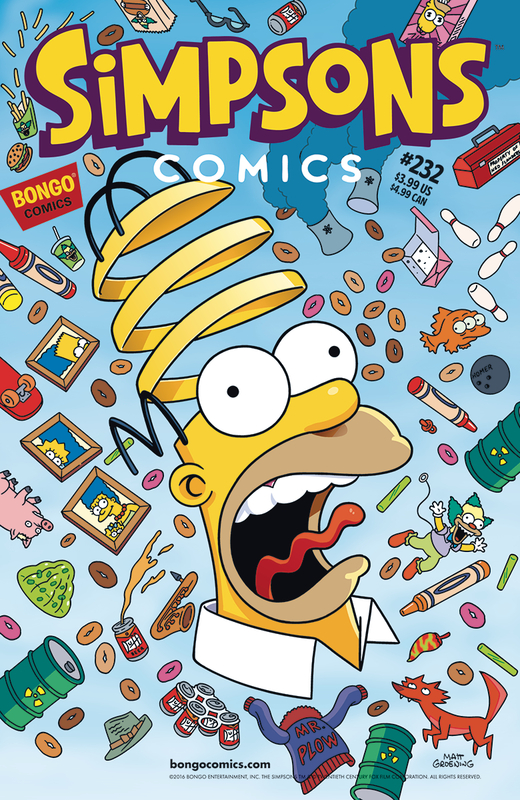 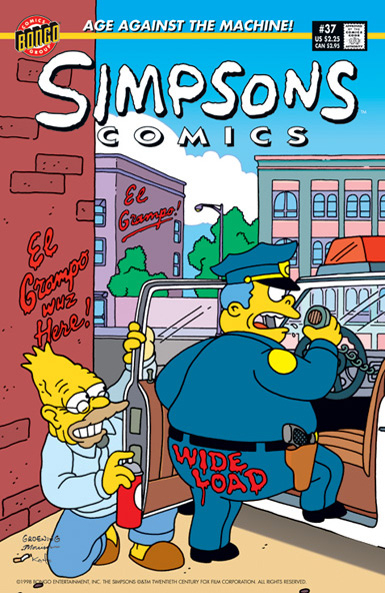 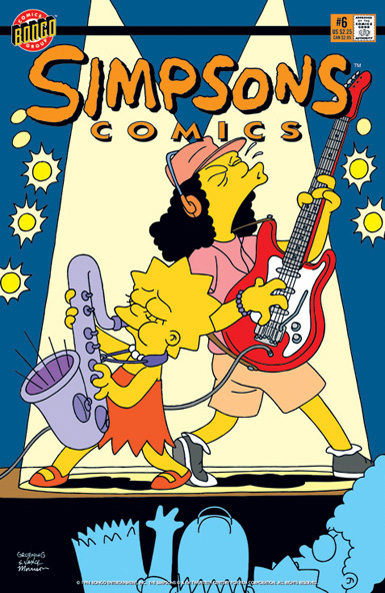 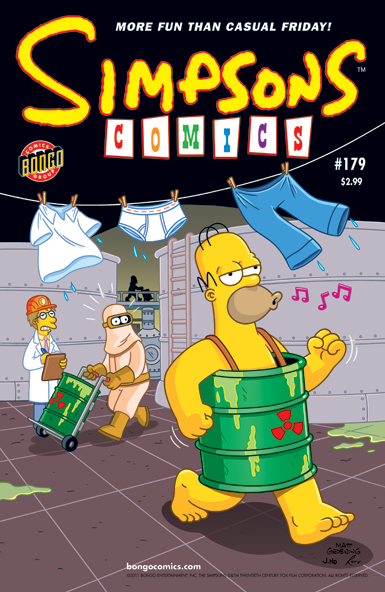 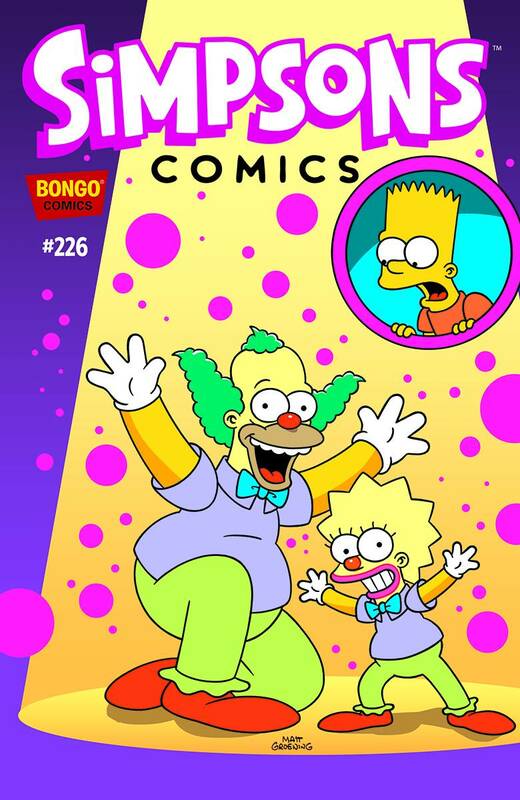 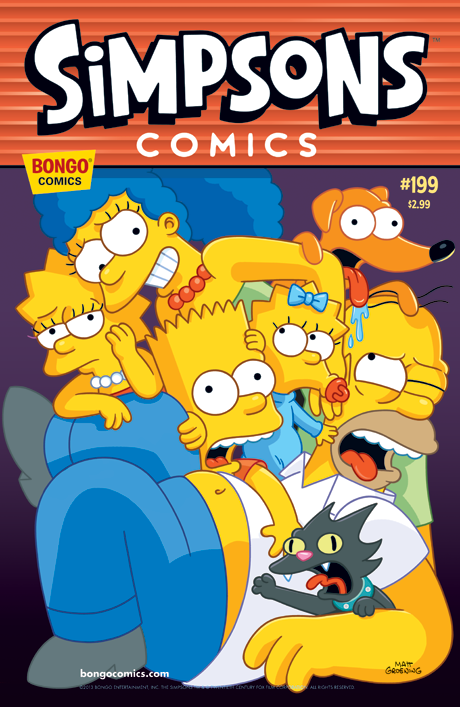 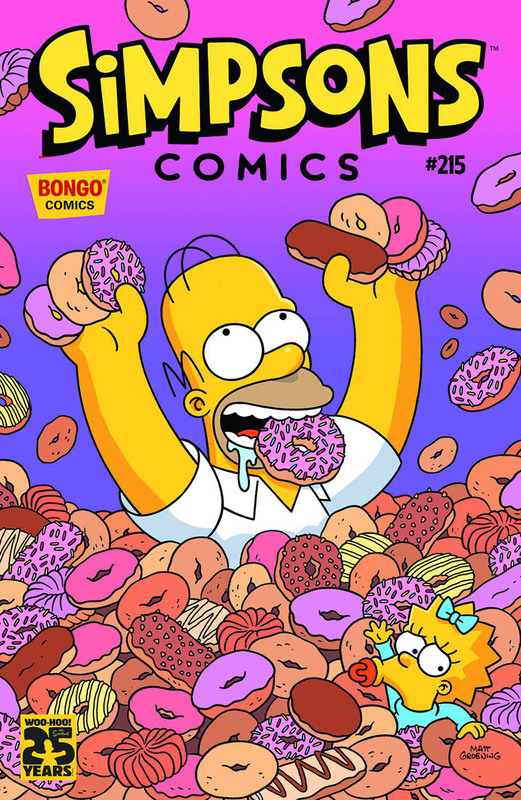 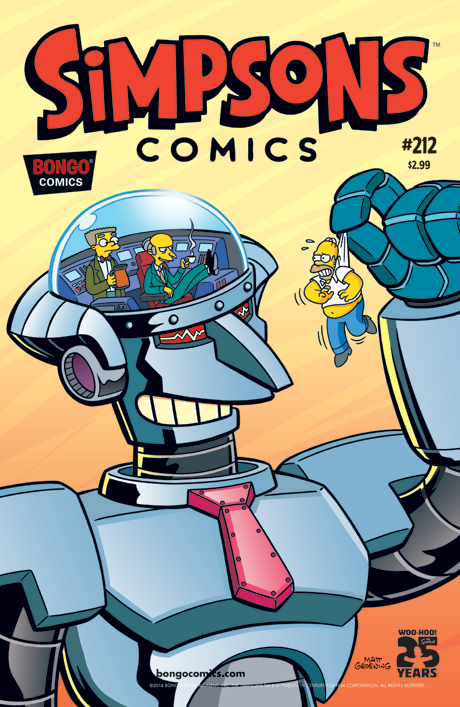 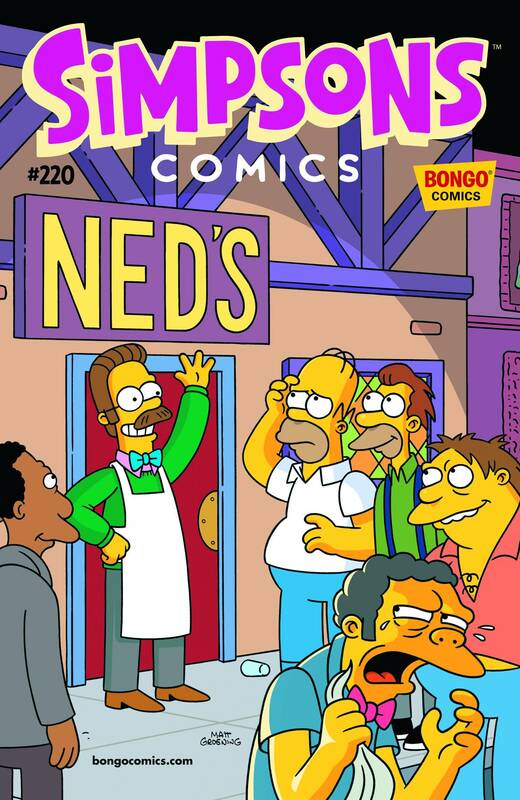 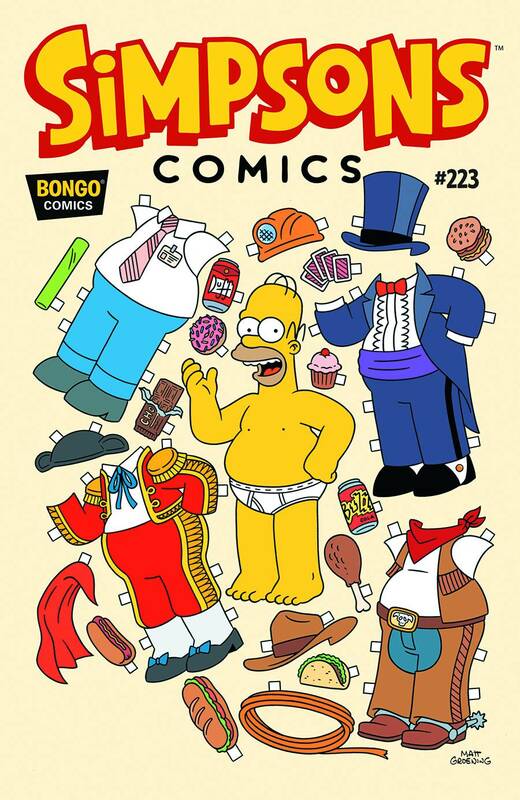 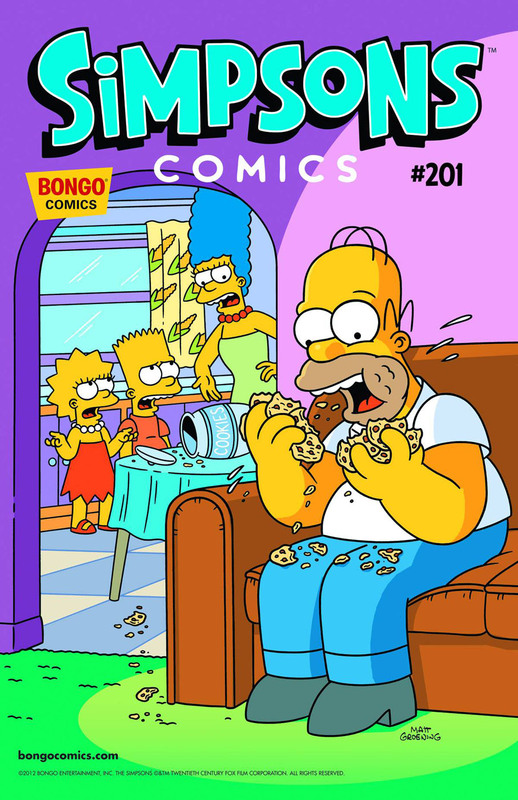 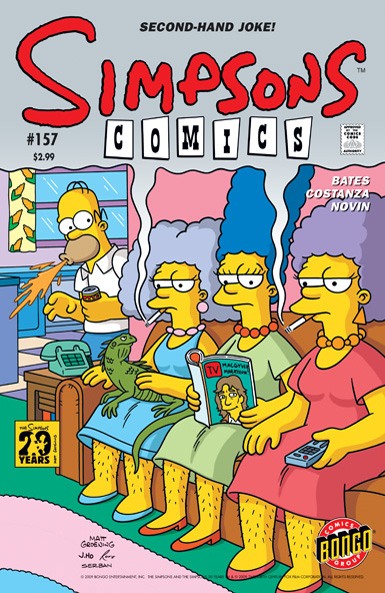 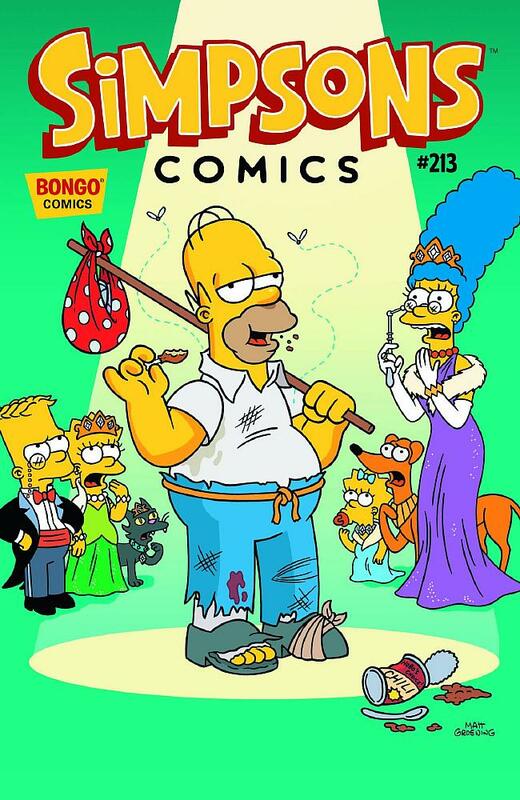 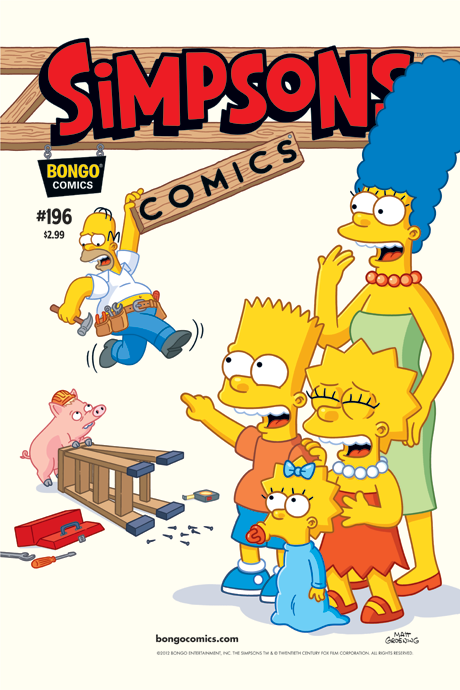 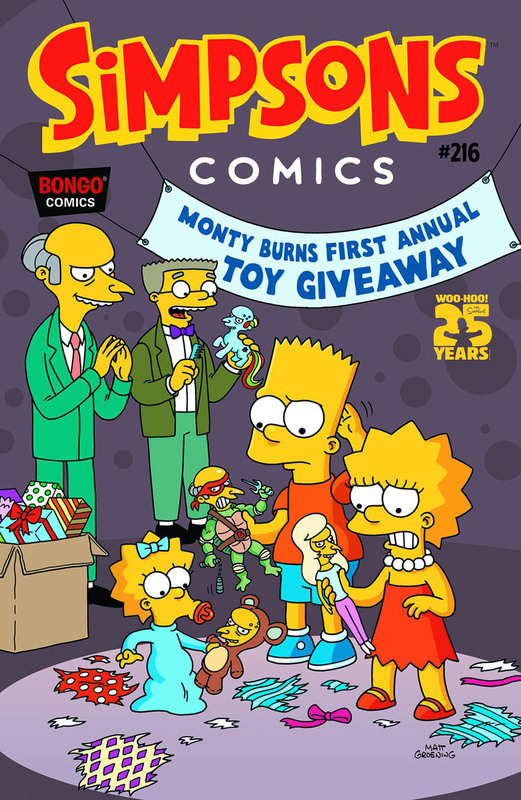 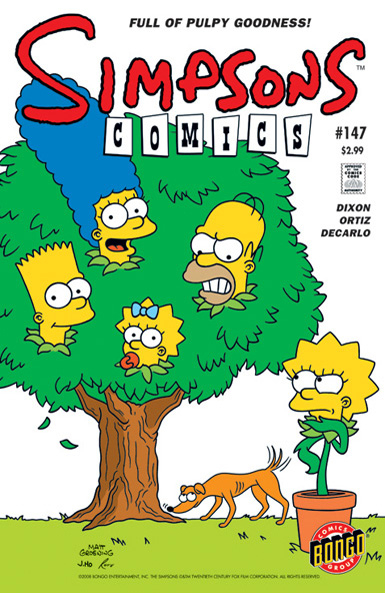 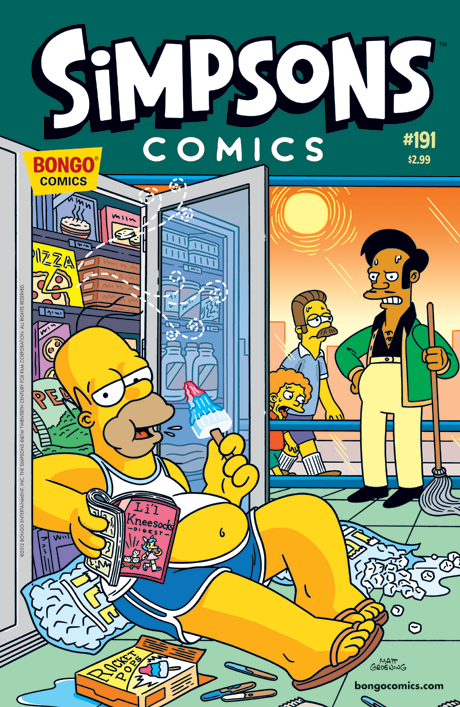 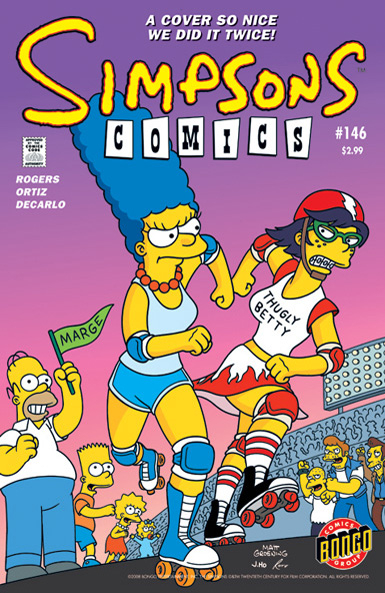 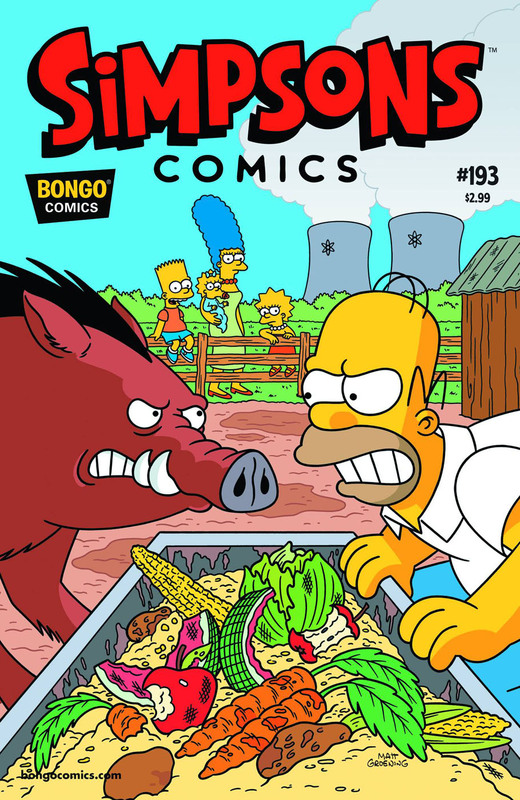 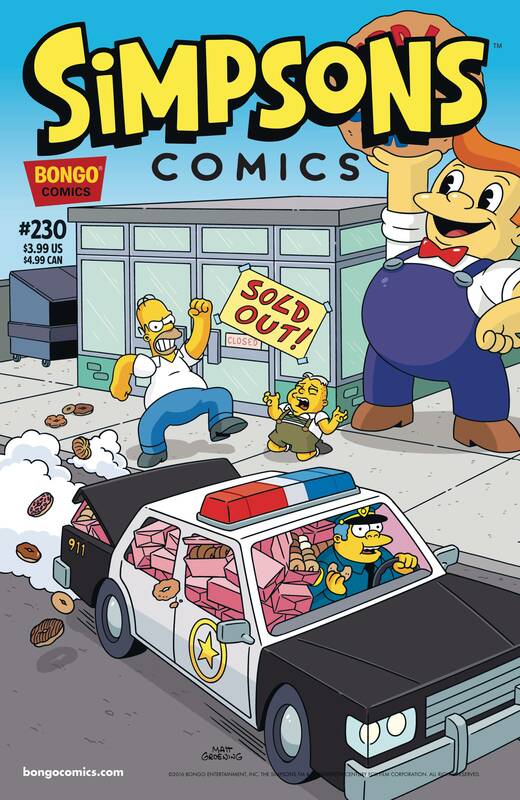 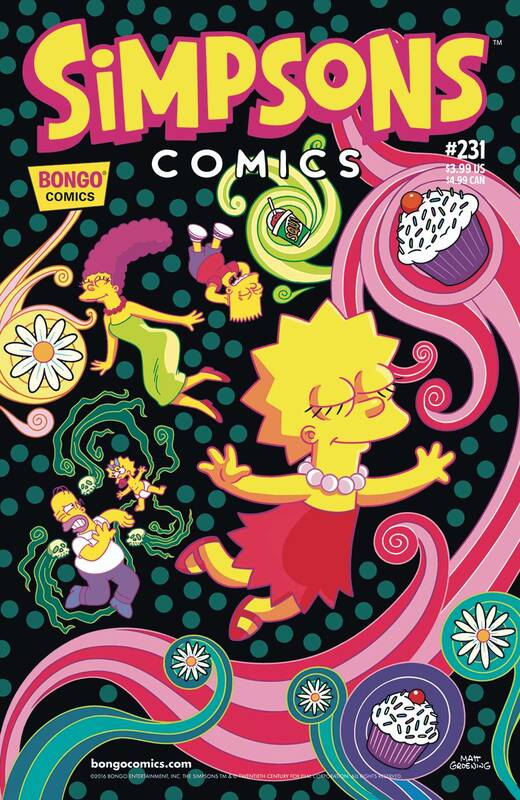 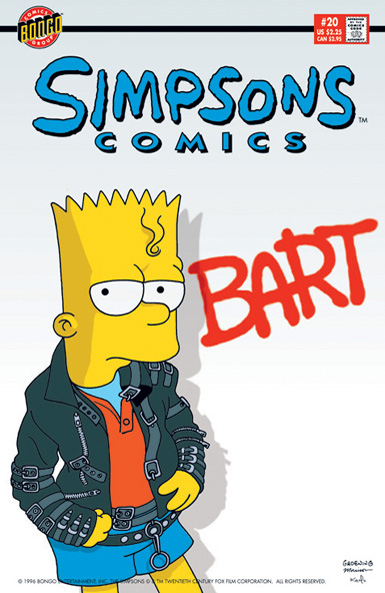 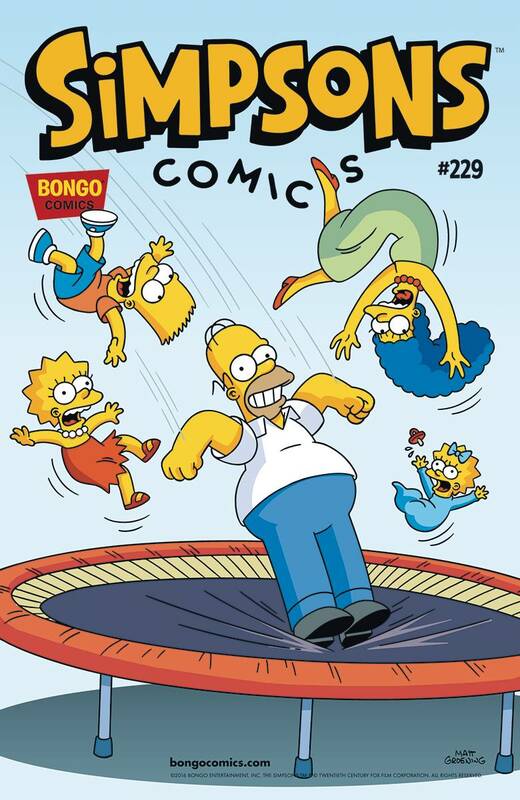 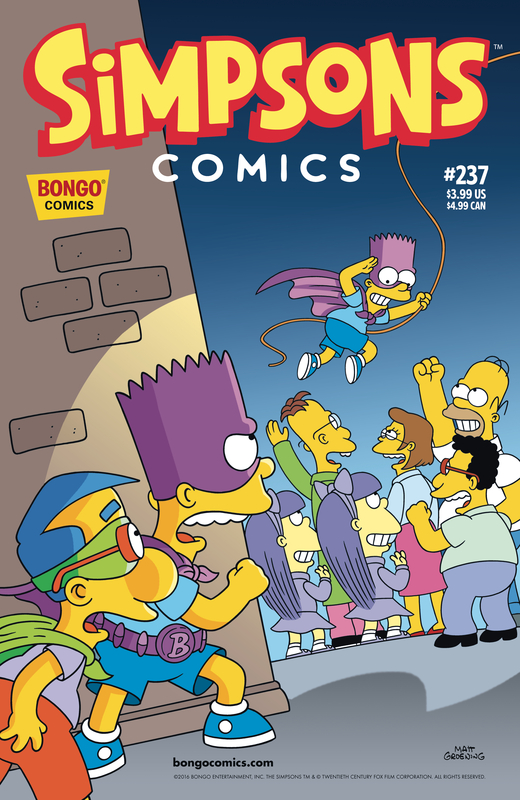 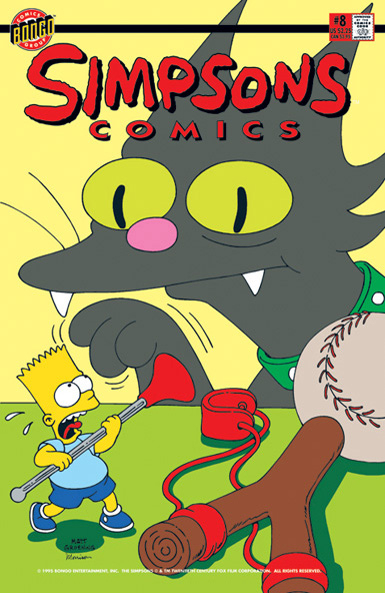 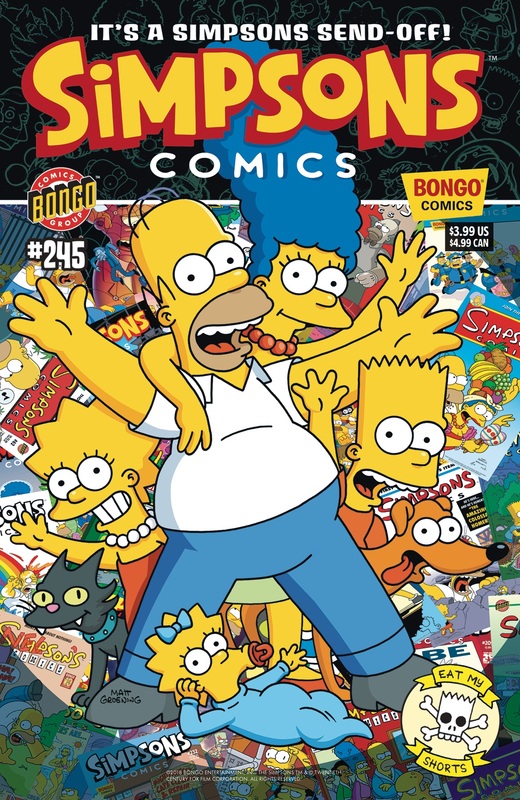 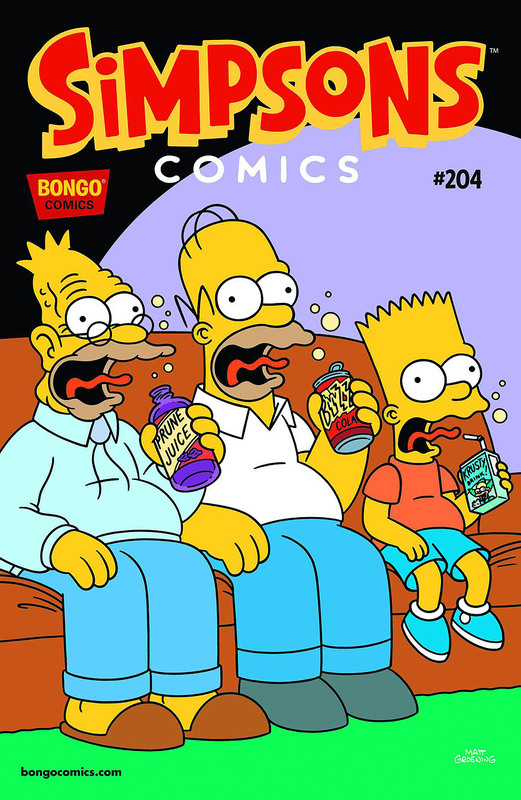 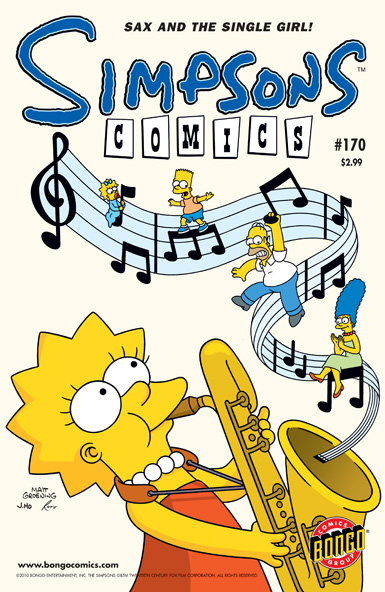 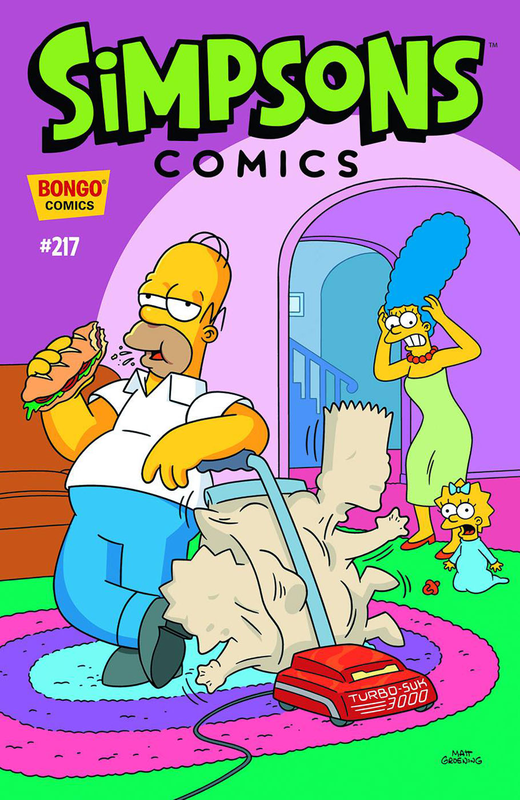 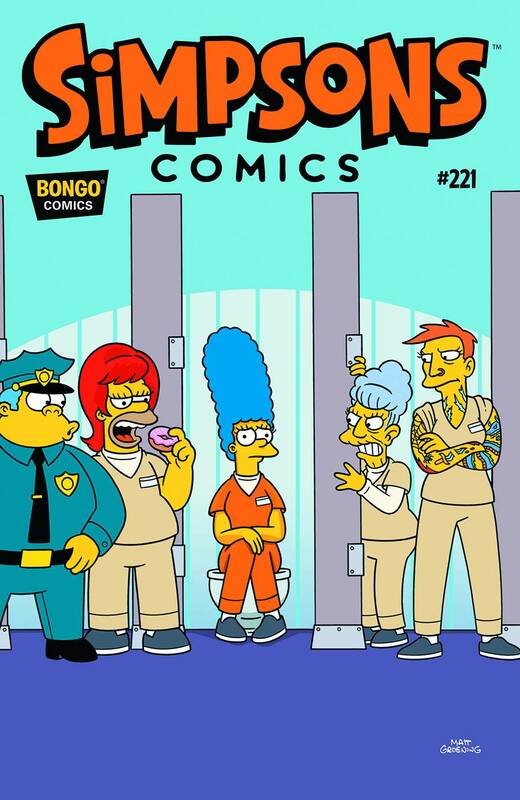 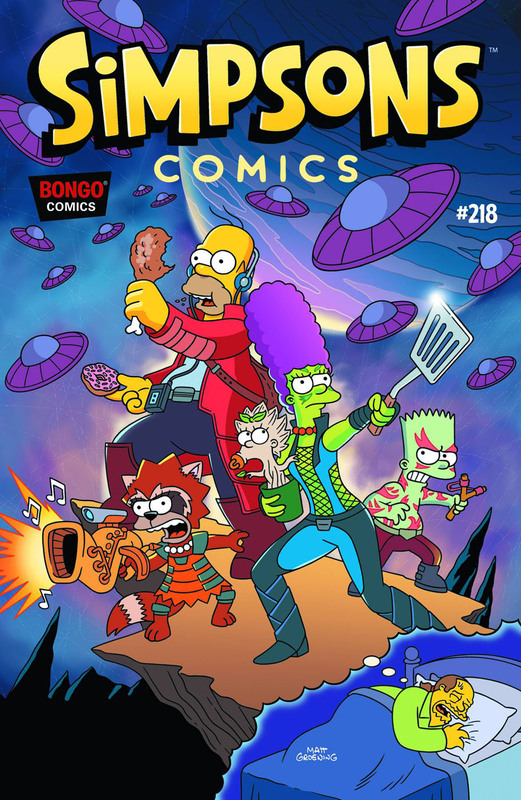 The Bongo Comics' logo and their comics' logos changed, Simpsons Comics being the main reason for that, as they were getting closer to releasing the 200th issue. 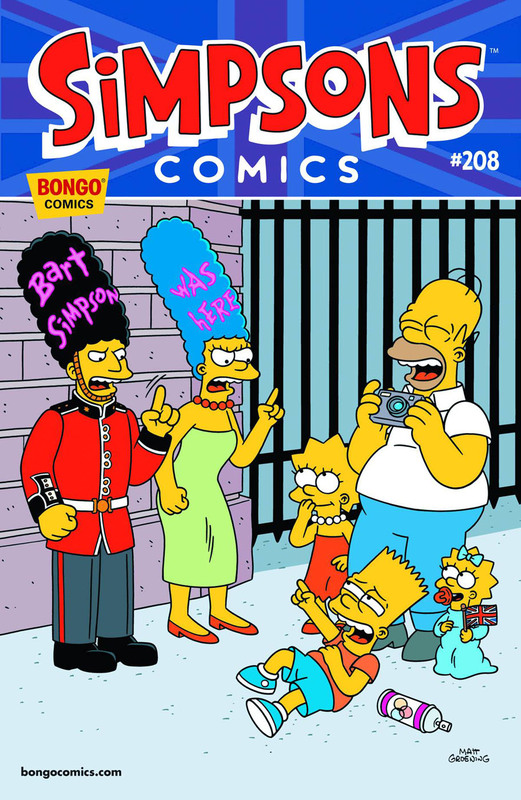 The new design was first used in the United Kingdom. 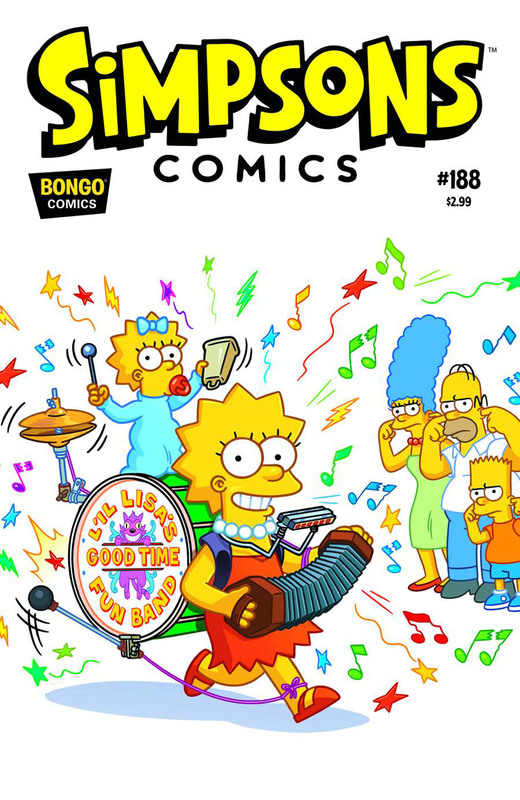 This redesign also brought back the letters page, as well as adding a few new things, such as the Bongo Bonus Stamps. 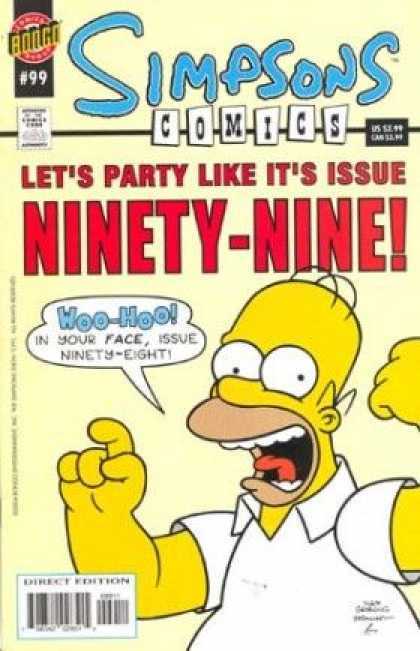 From June 2012 is the comic is giving out nine times every year. 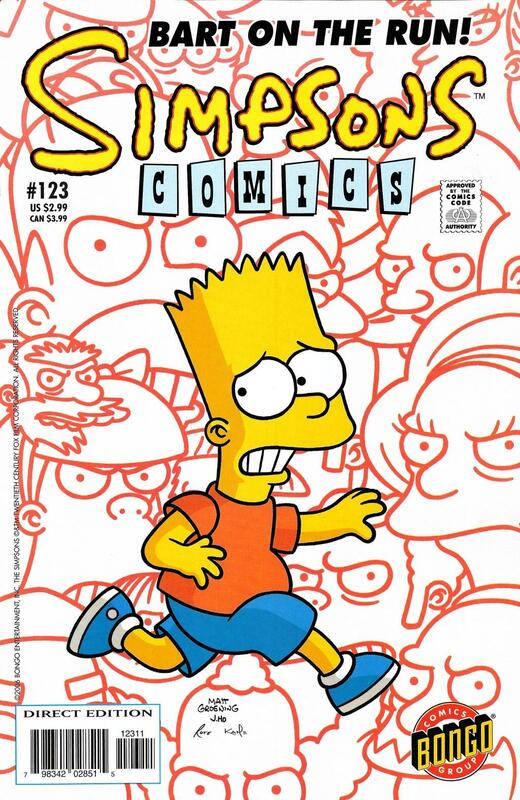 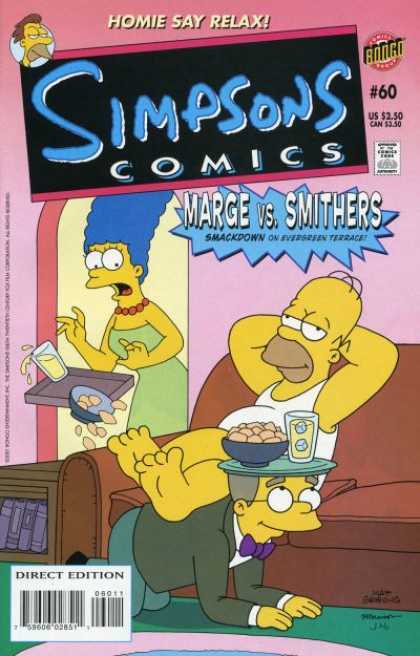 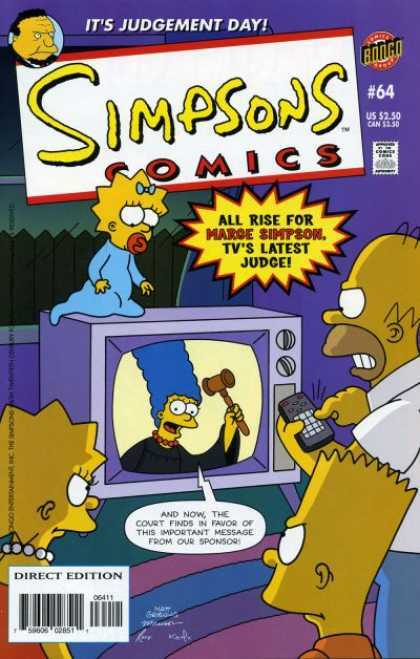 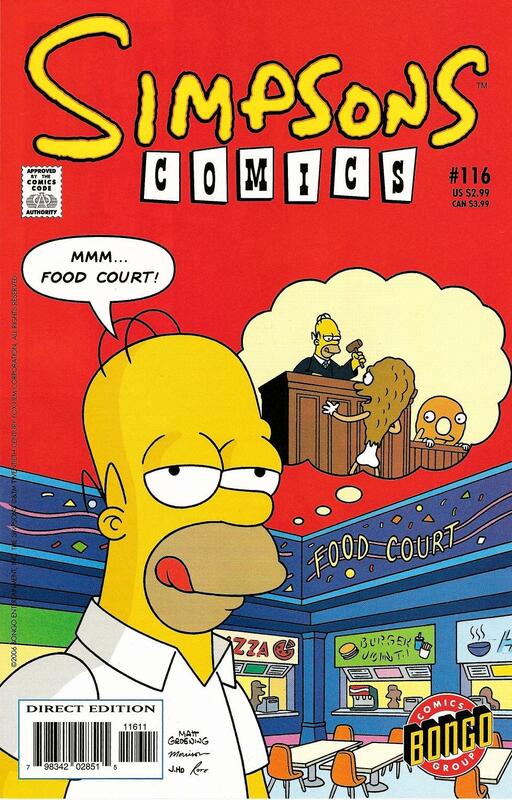 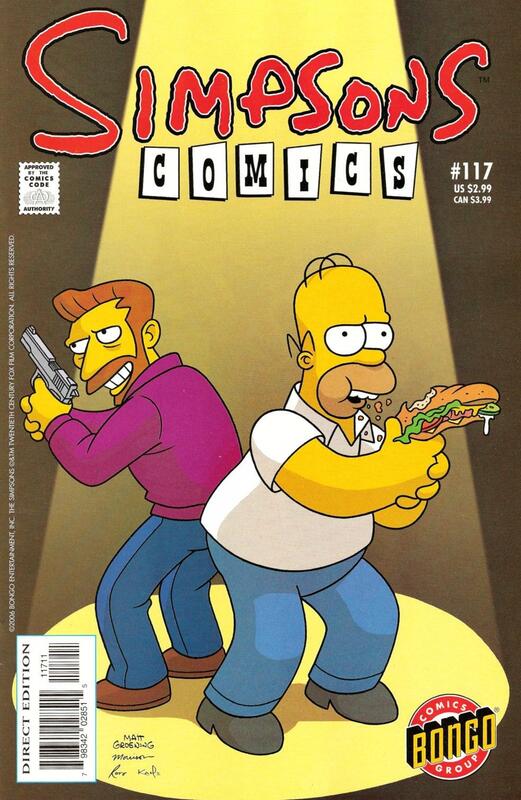 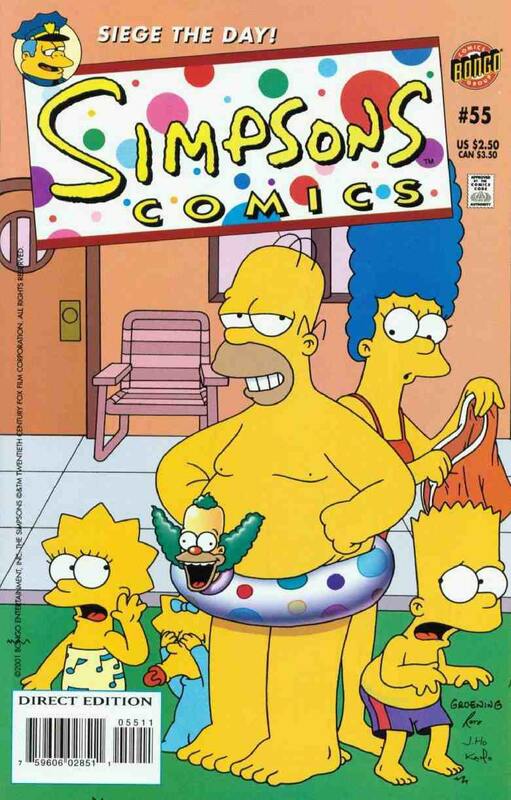 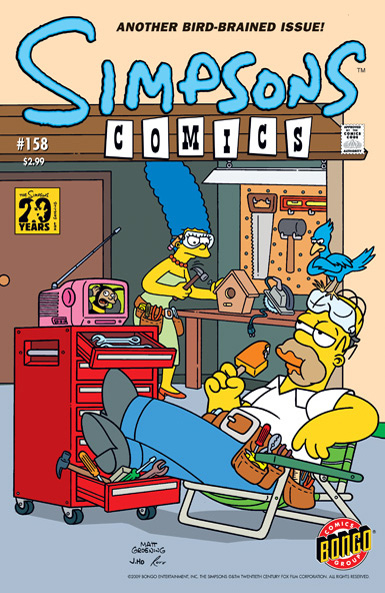 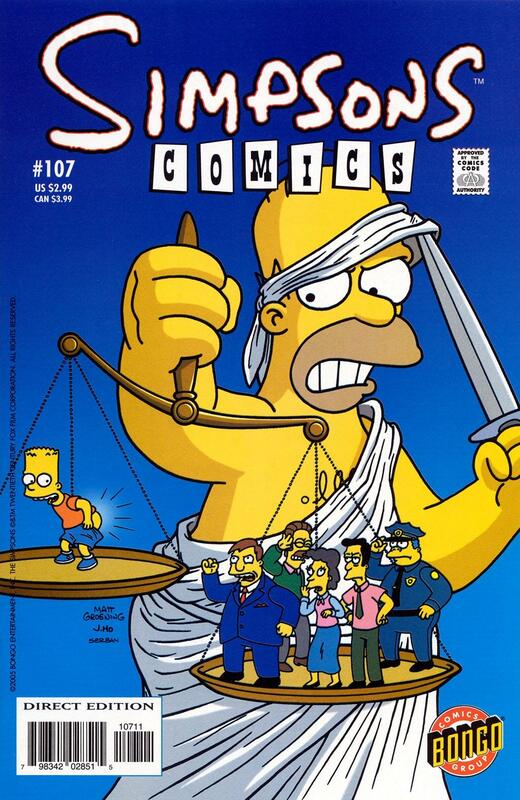 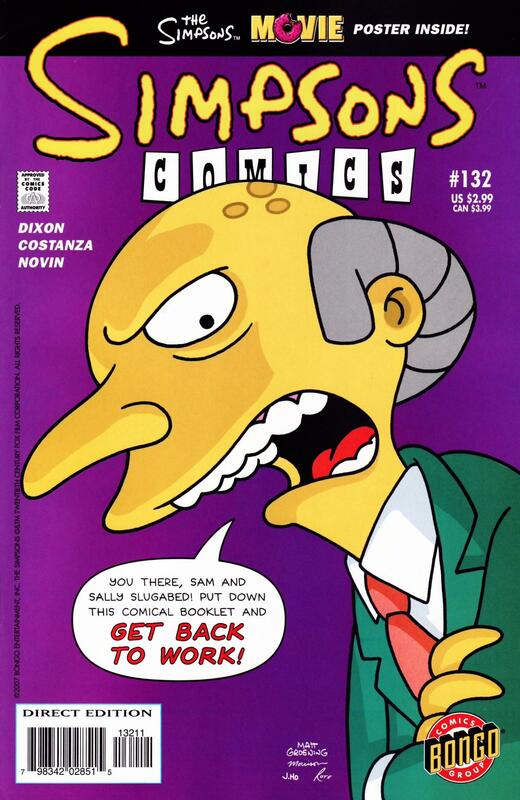 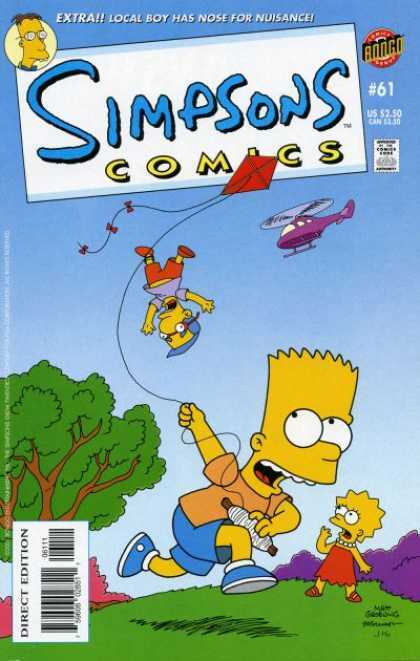 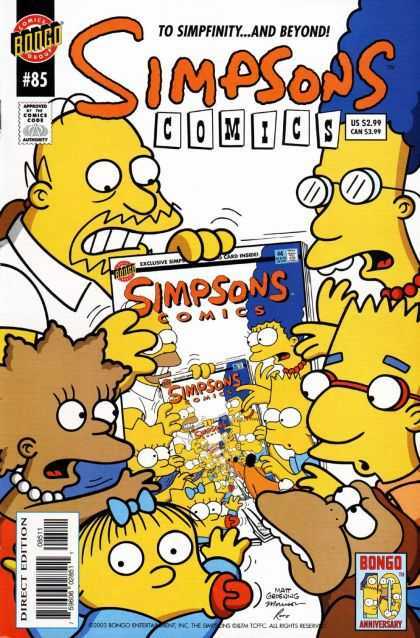 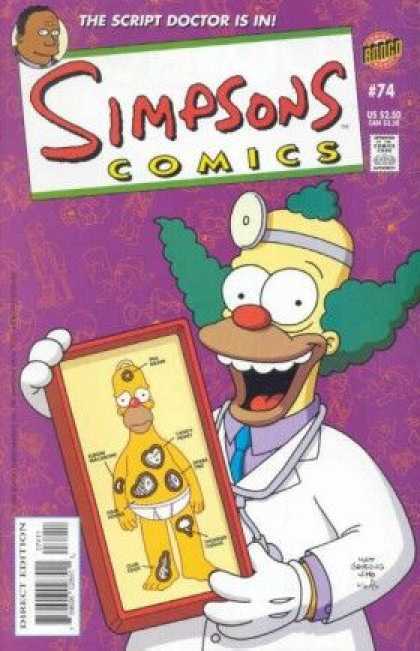 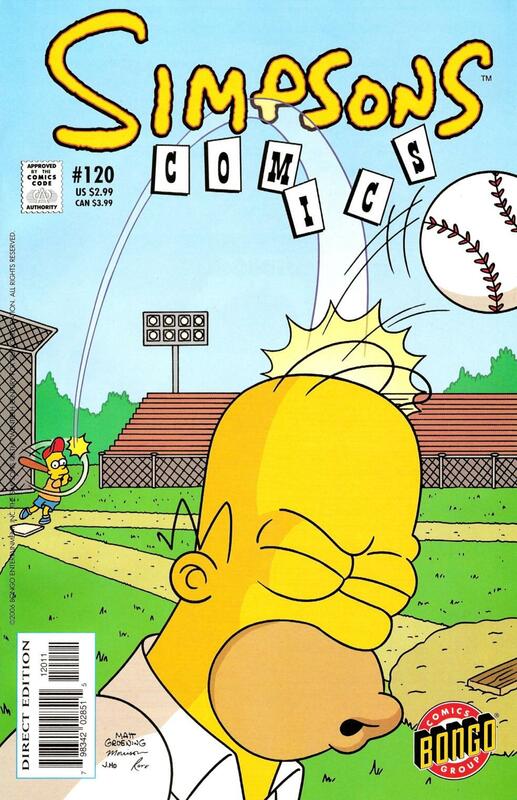 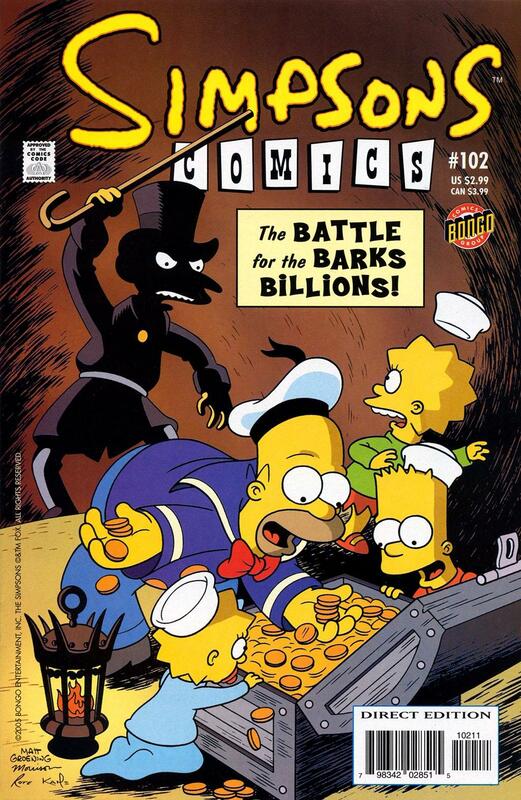 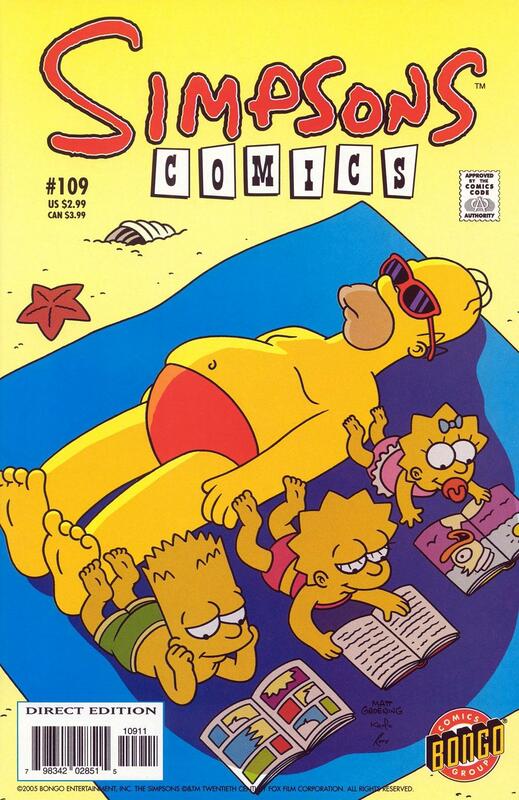 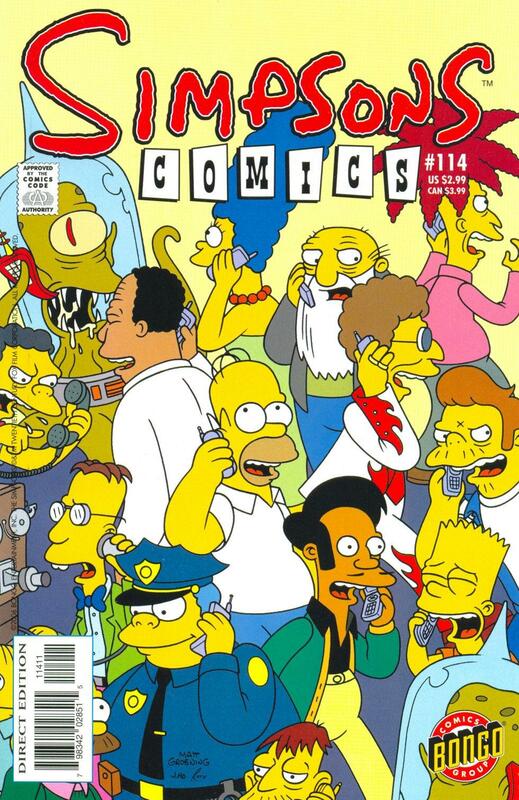 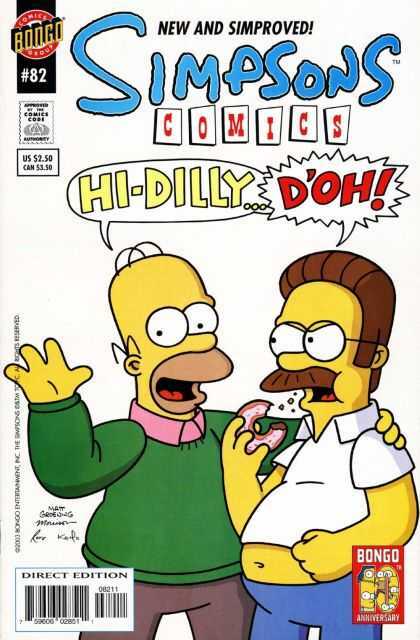 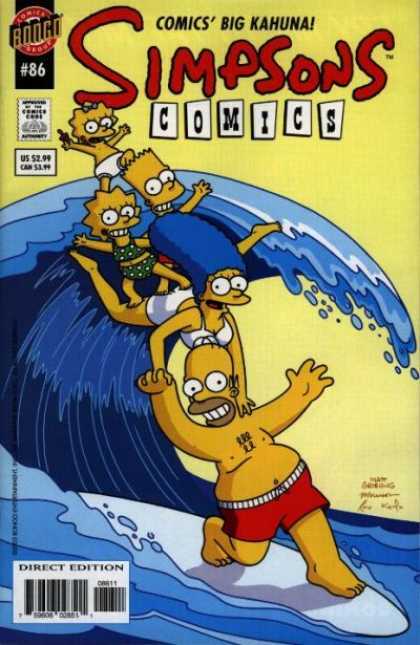 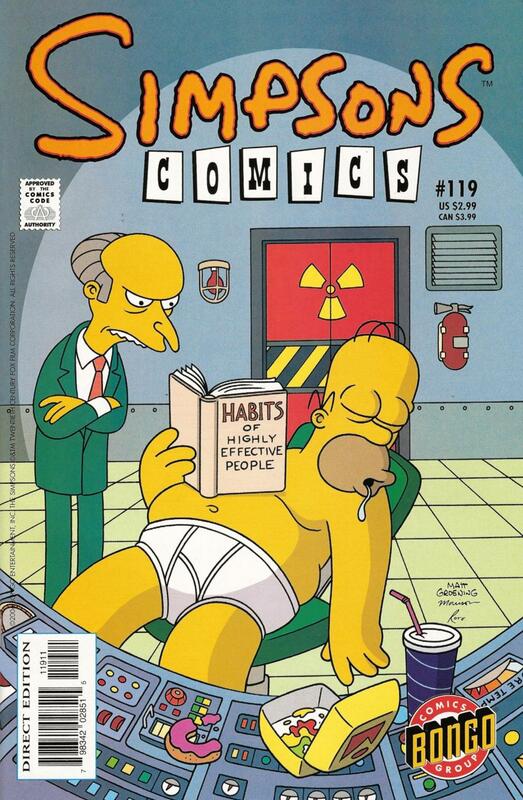 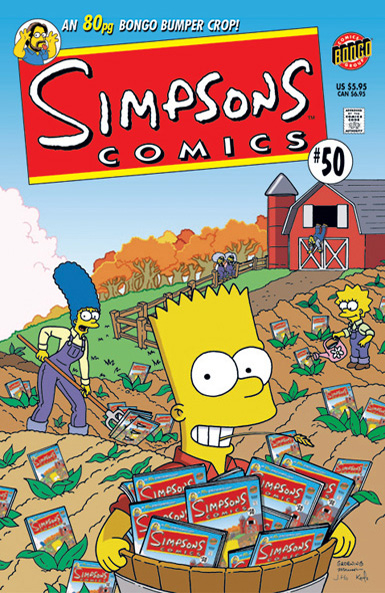 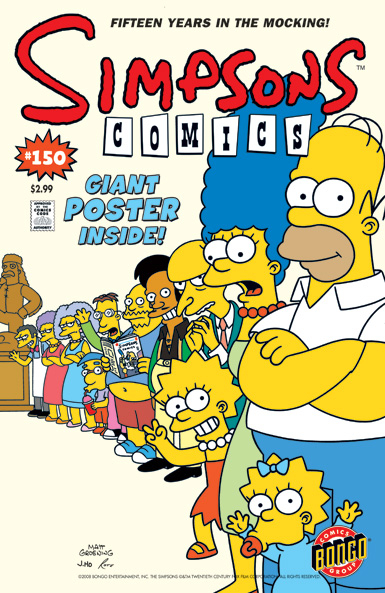 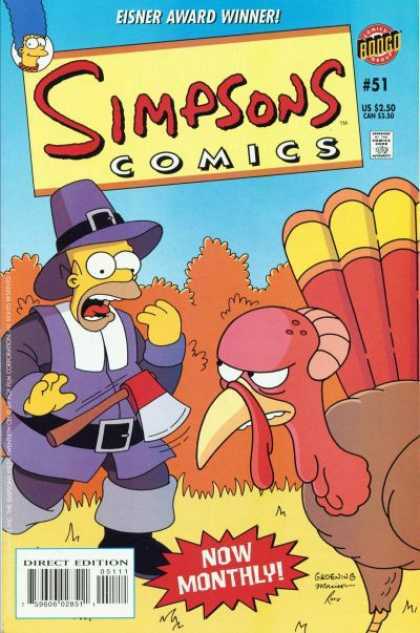 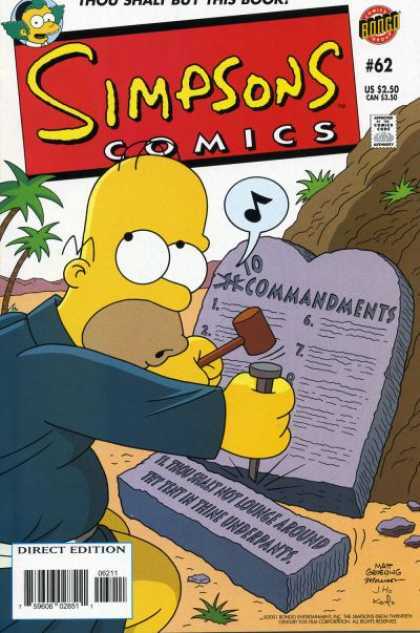 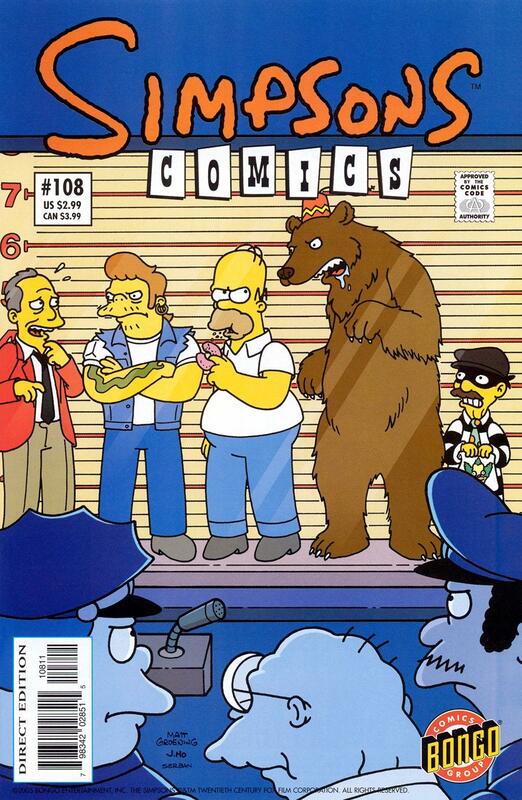 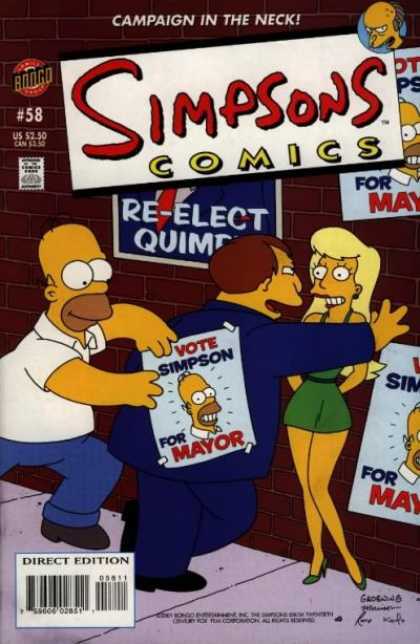 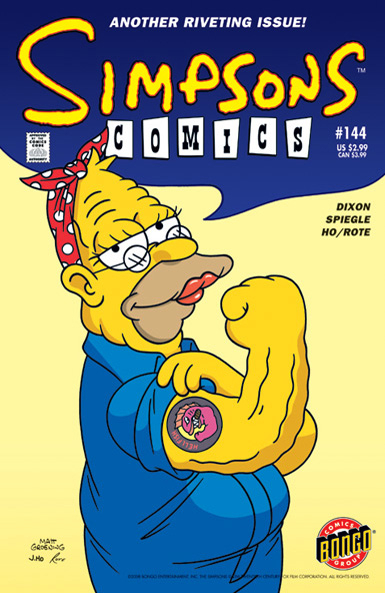 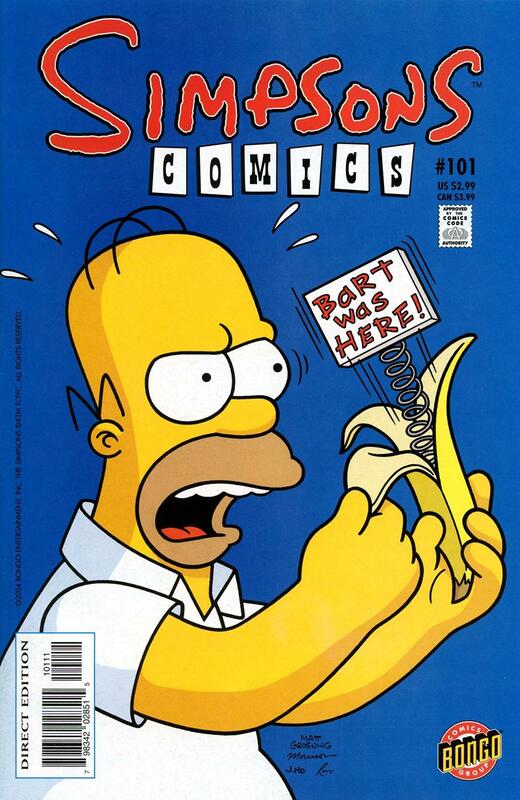 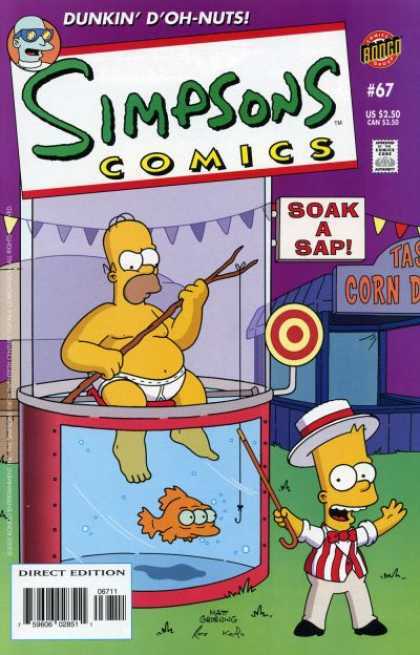 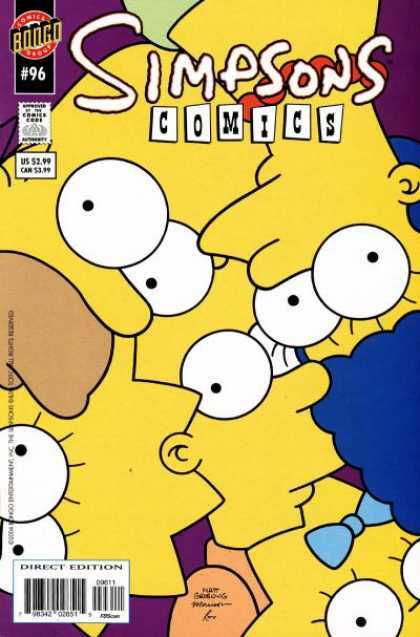 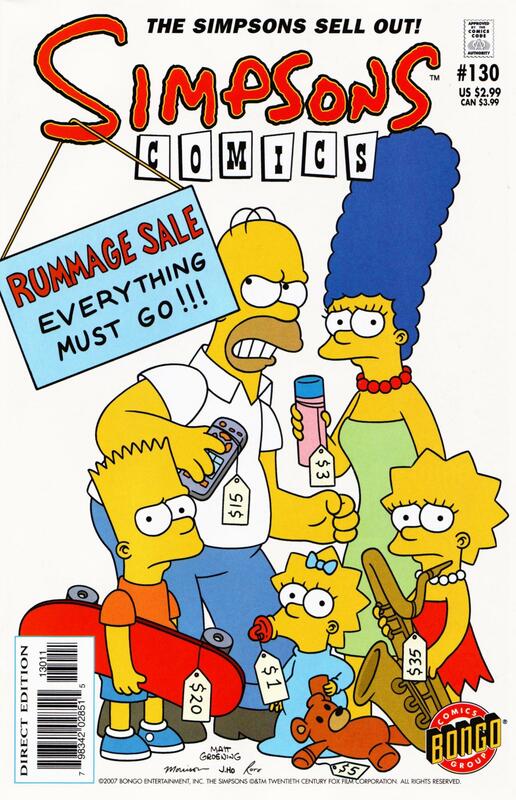 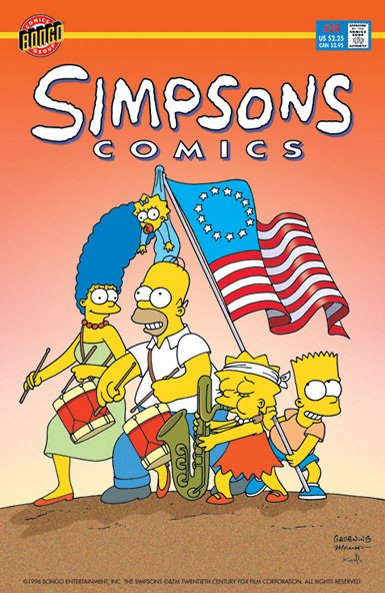 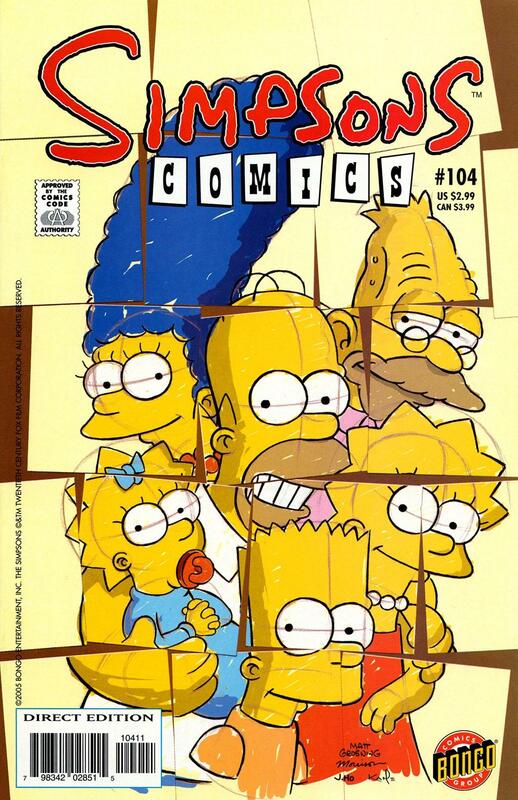 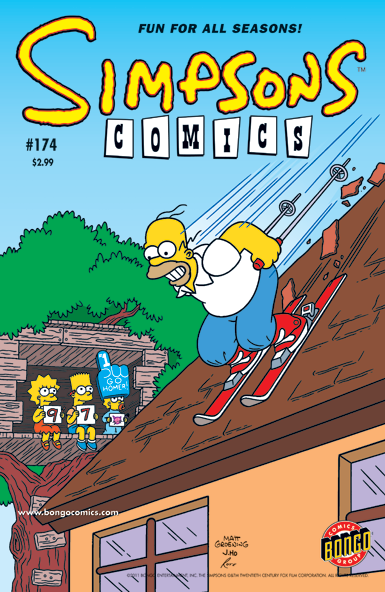 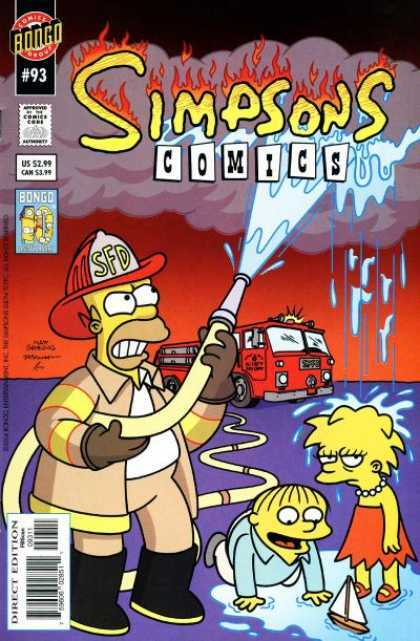 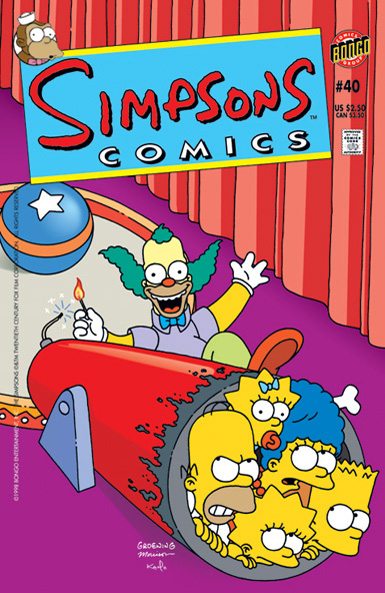 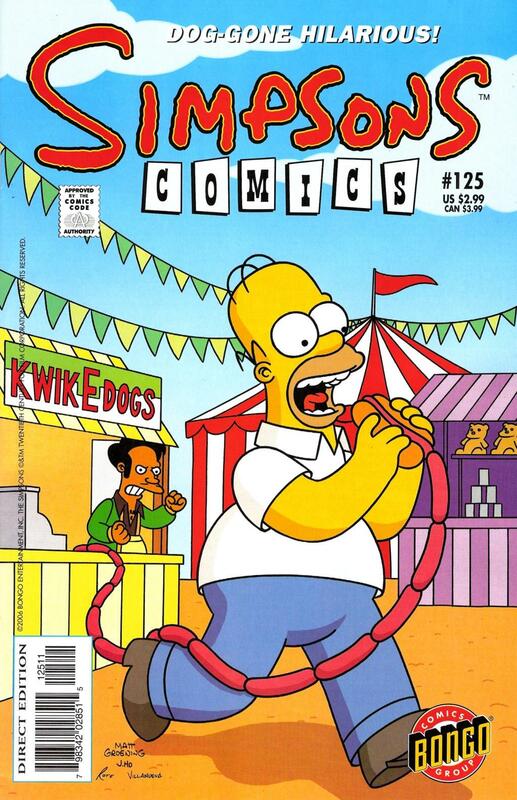 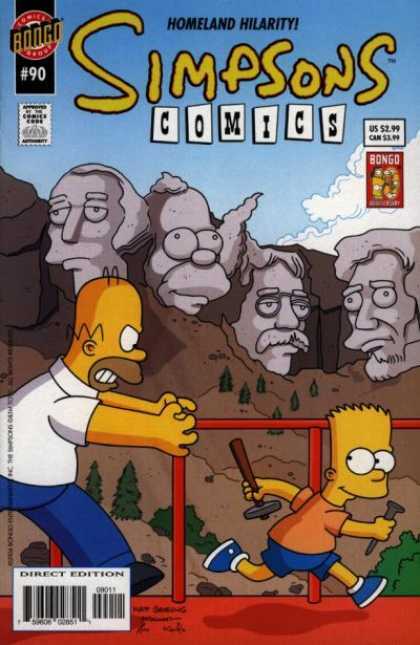 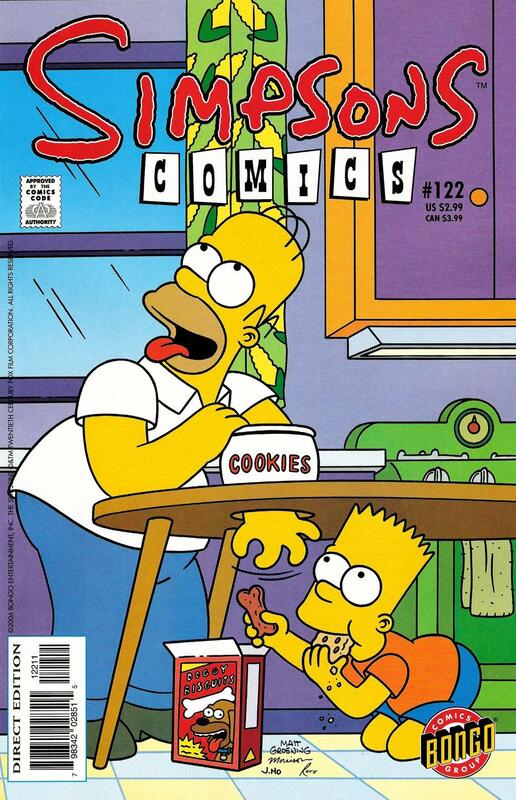 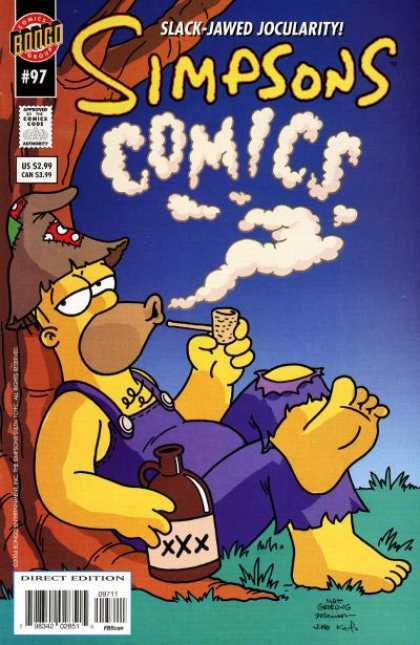 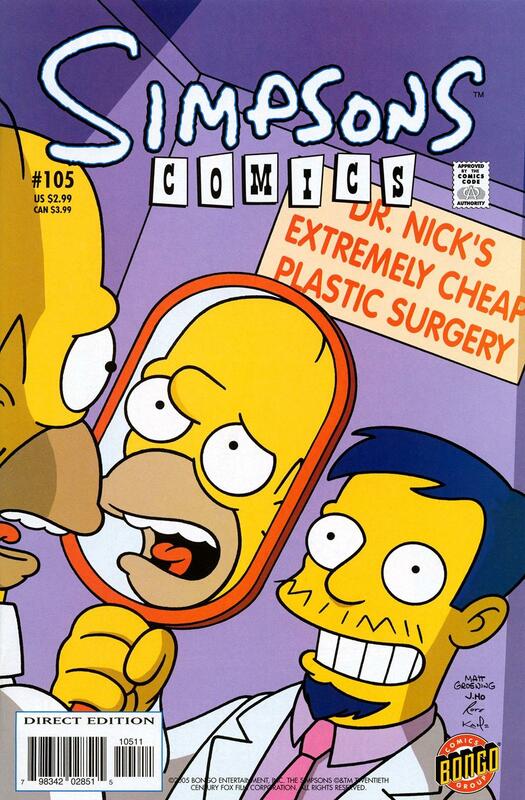 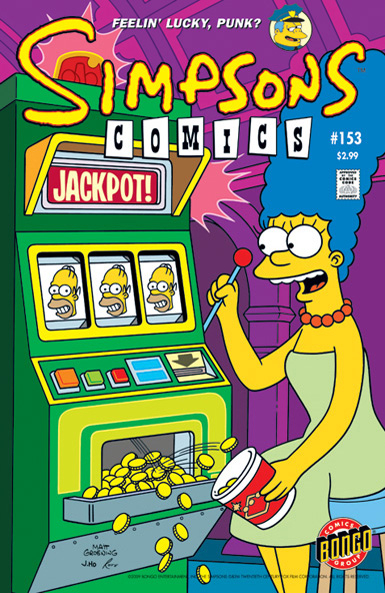 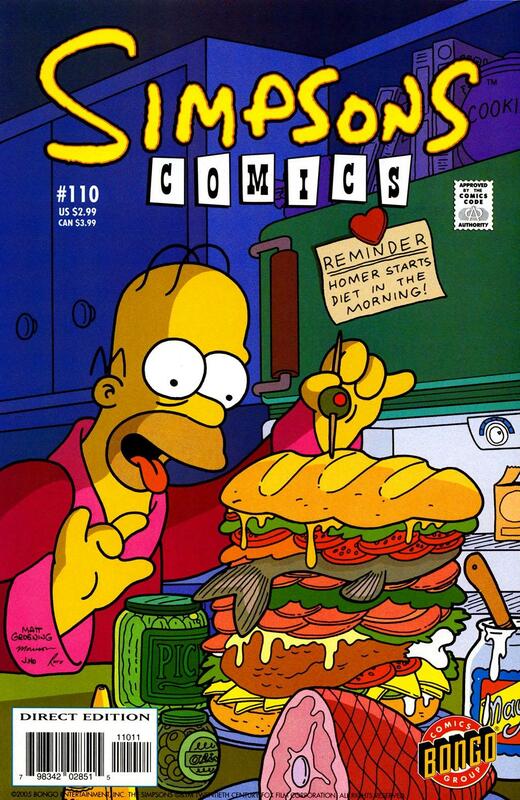 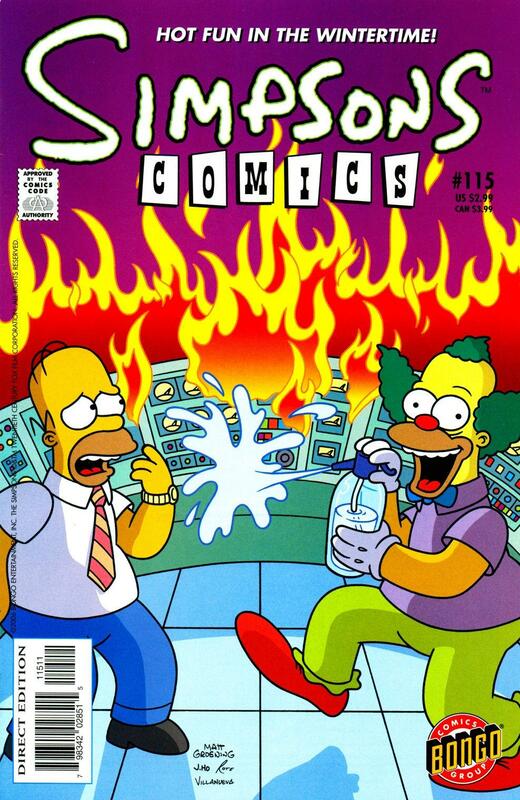 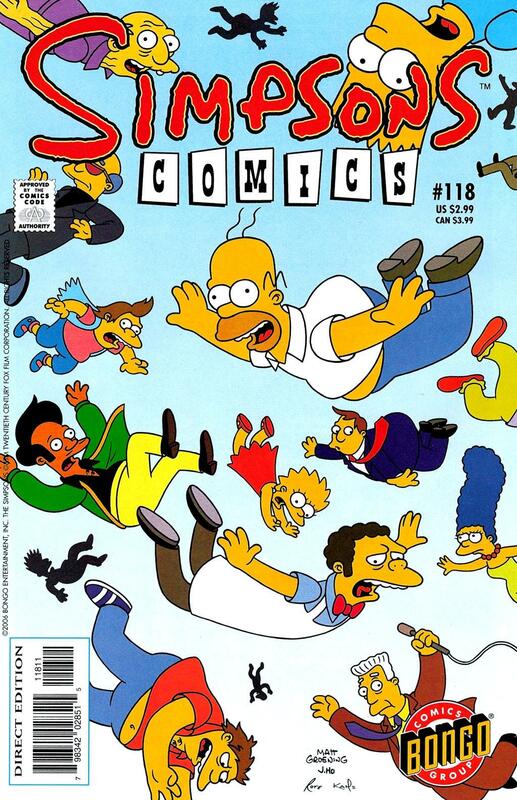 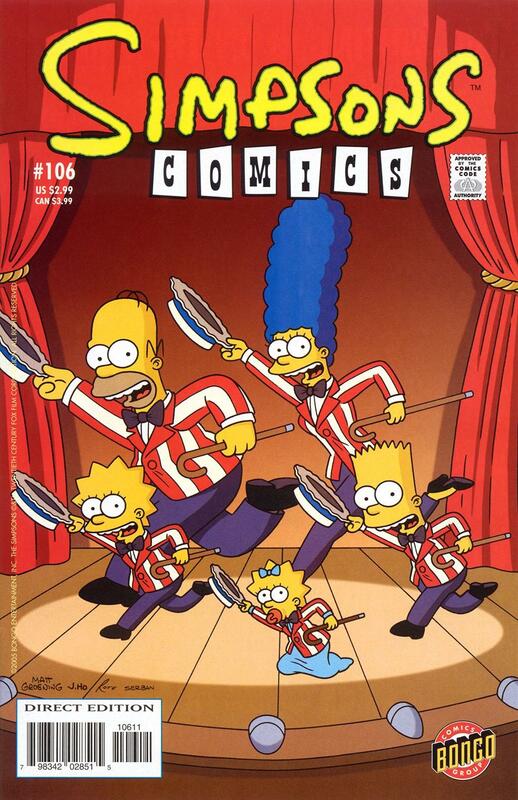 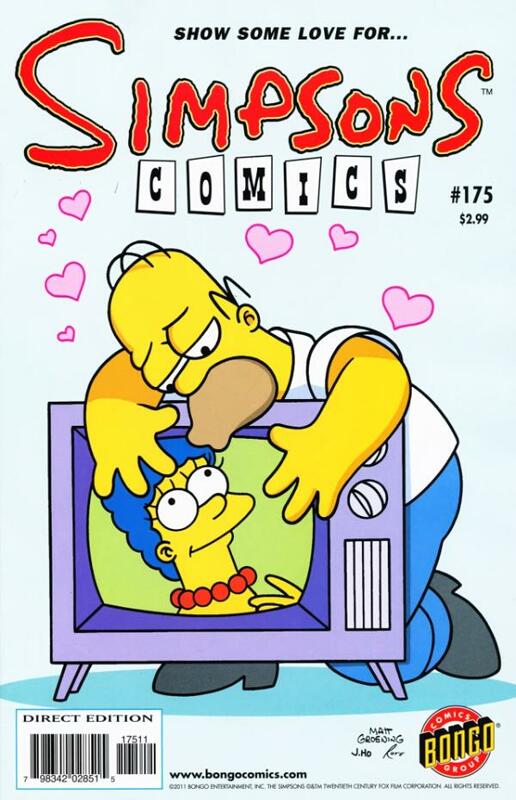 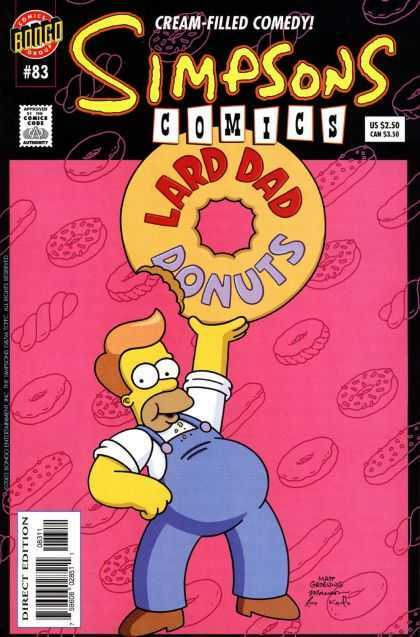 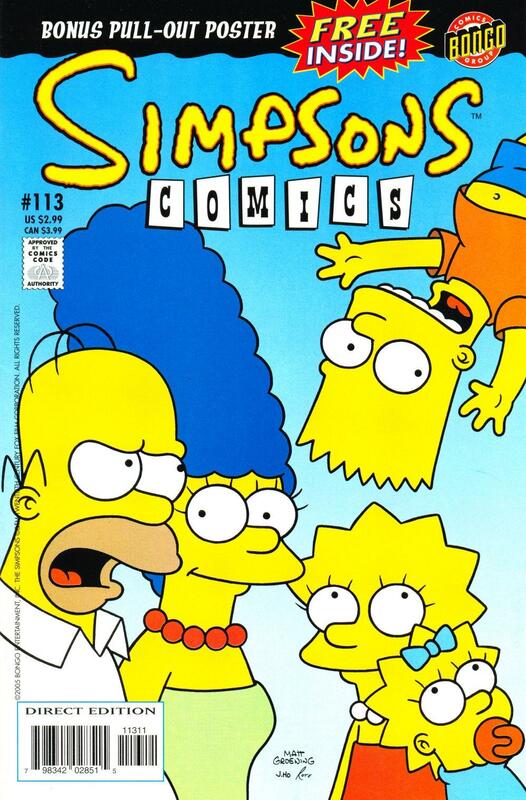 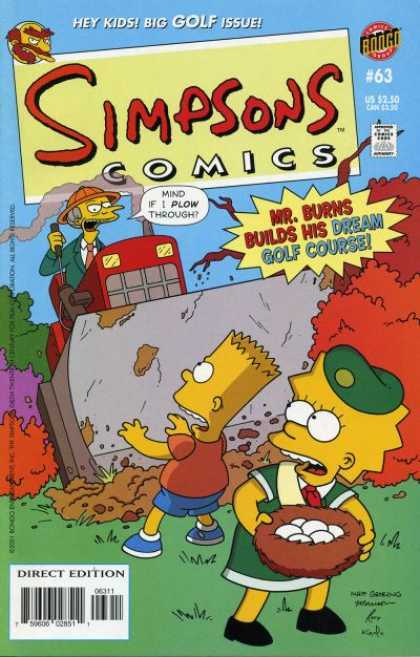 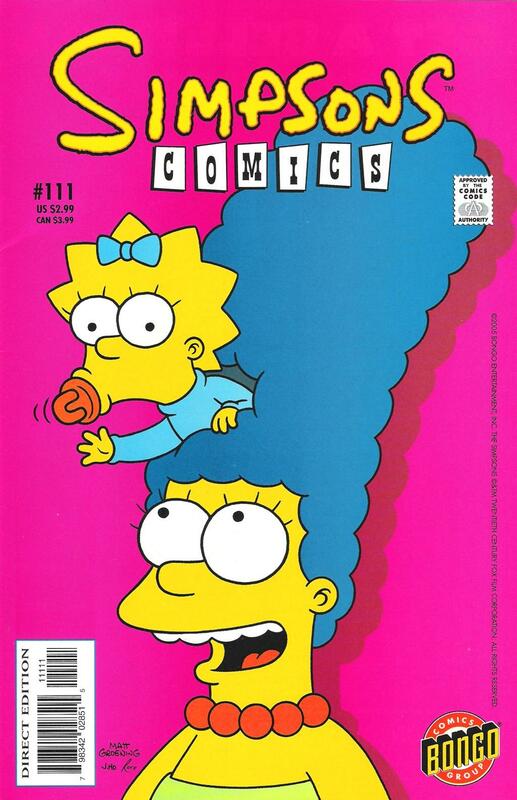 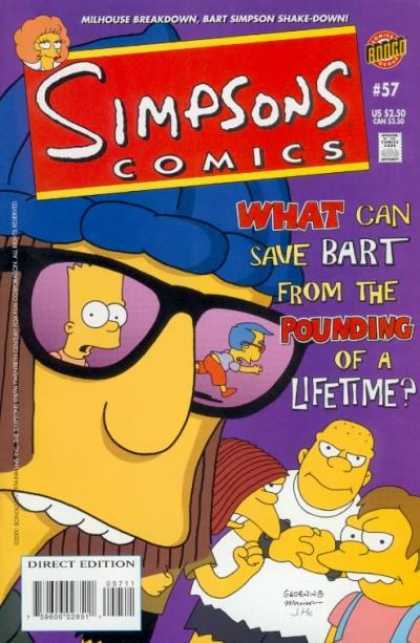 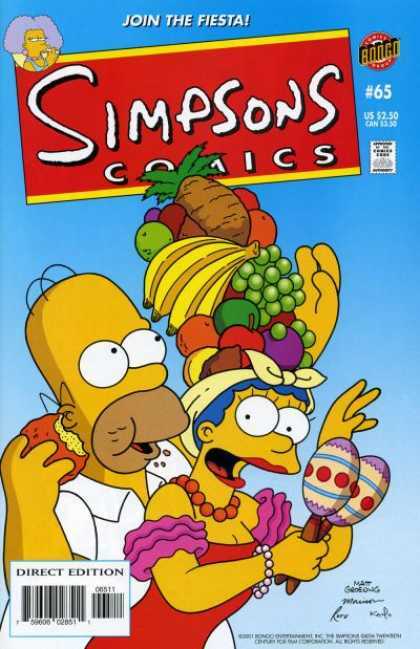 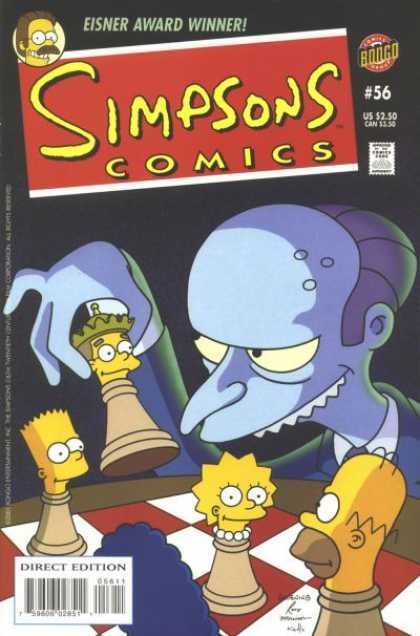 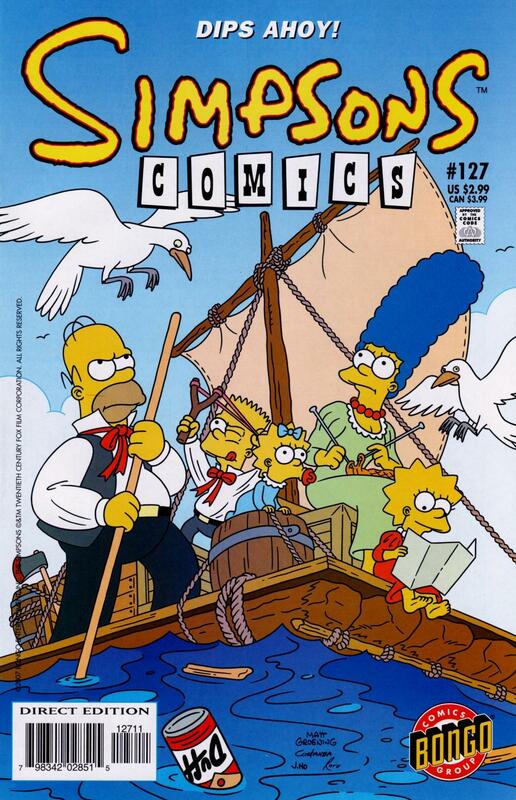 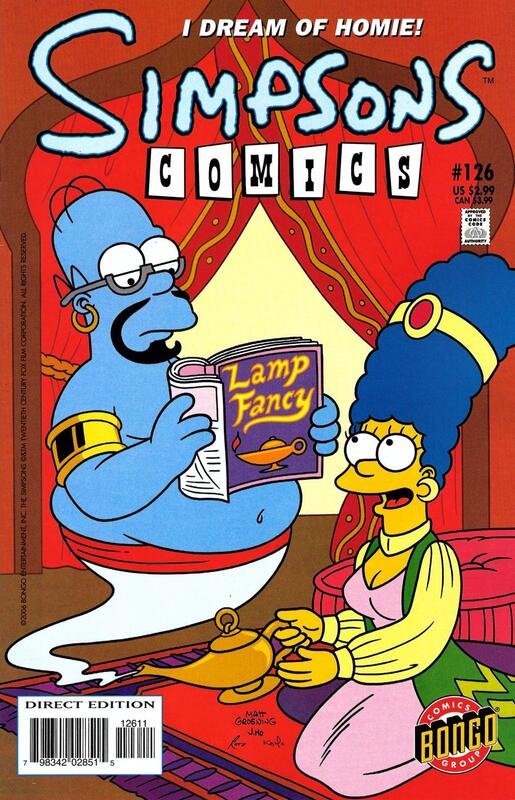 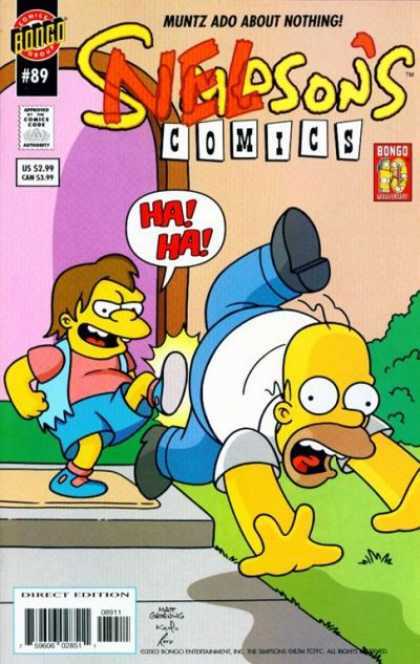 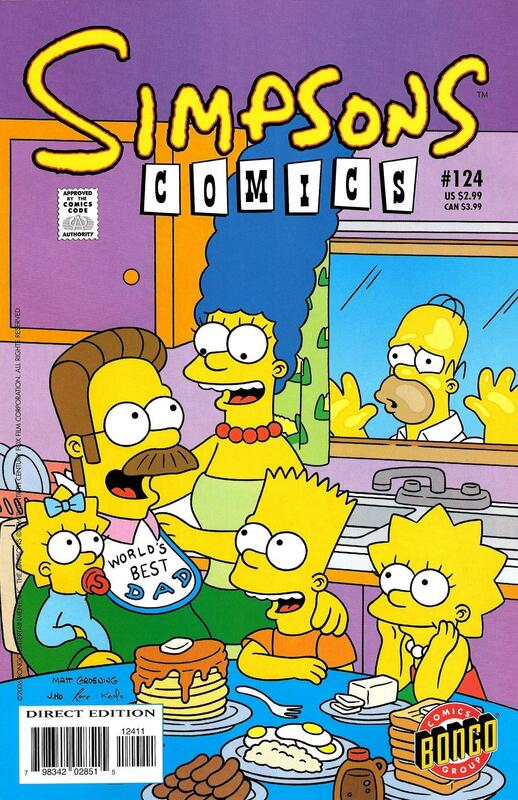 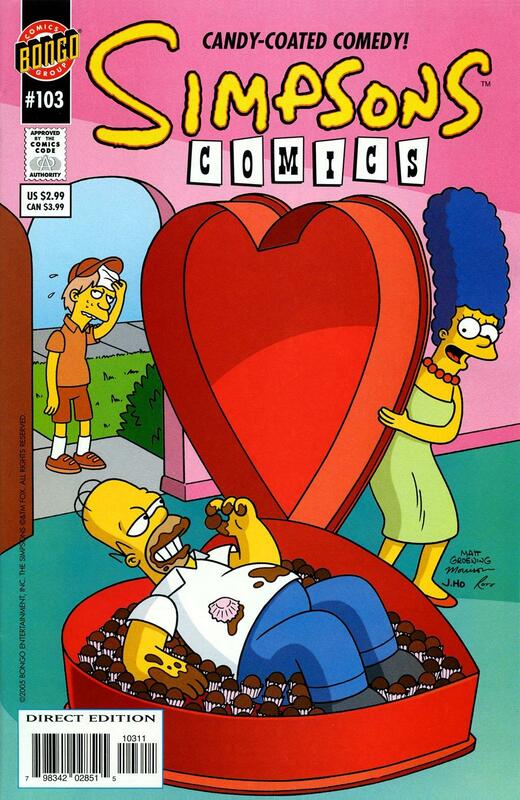 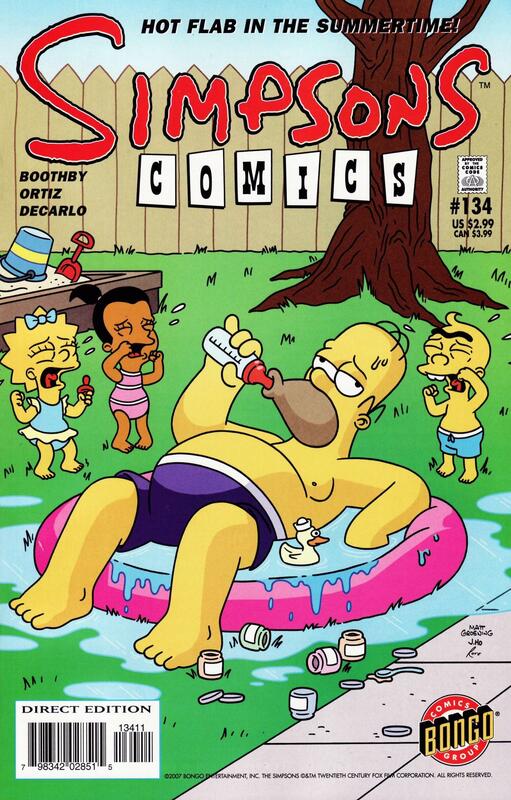 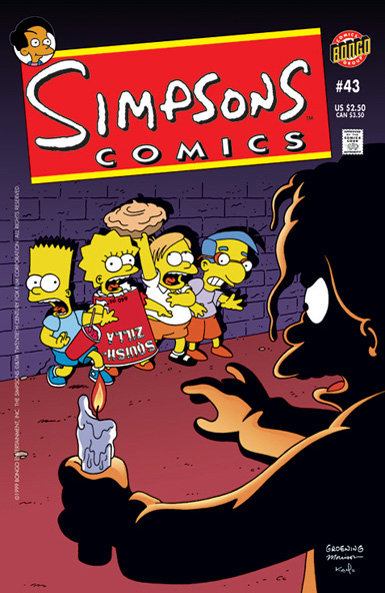 The American Simpsons Comics was originally published bimonthly, but beginning with #13, began monthly publication. 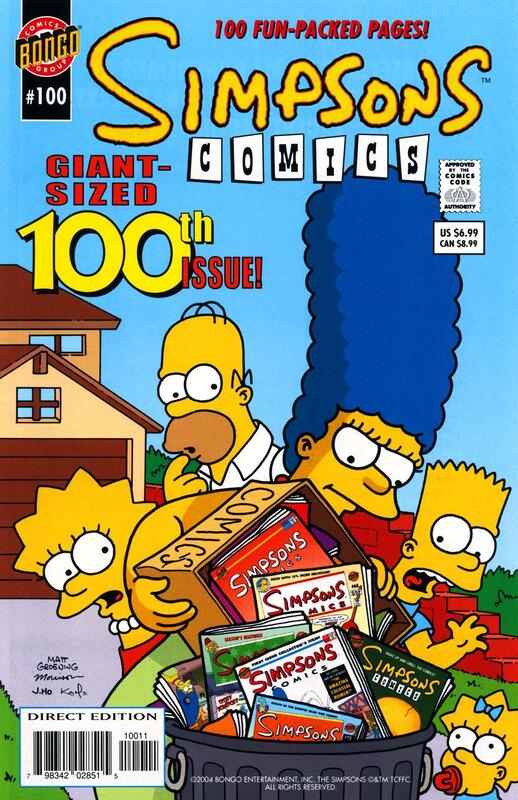 It went back to bimonthly publication at #30 before finally resuming monthly publishing at #51. 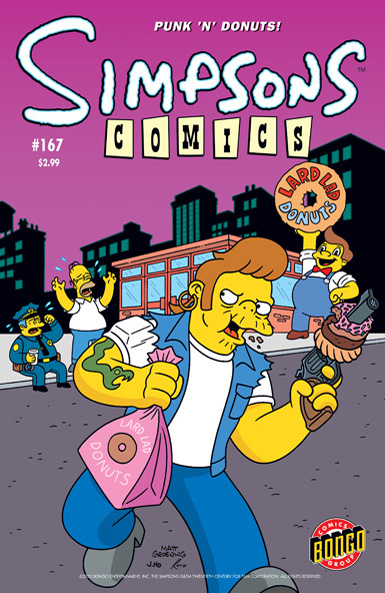 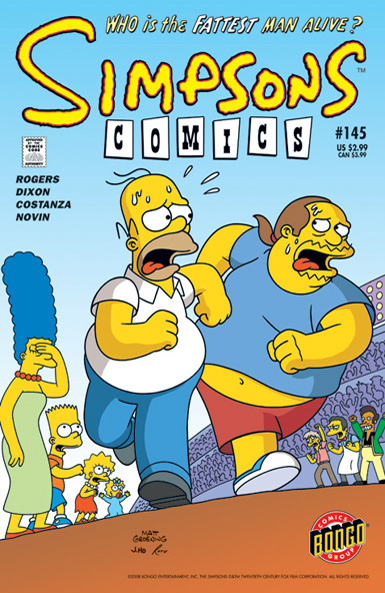 Simpsons Comics 12 Survival of the Fattest! 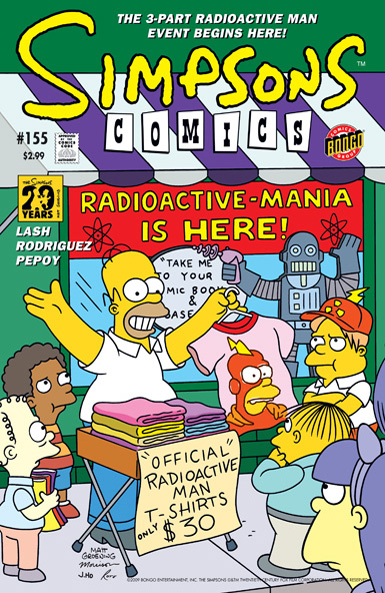 Simpsons Comics 13 Give Me Merchandising or Give Me Death! 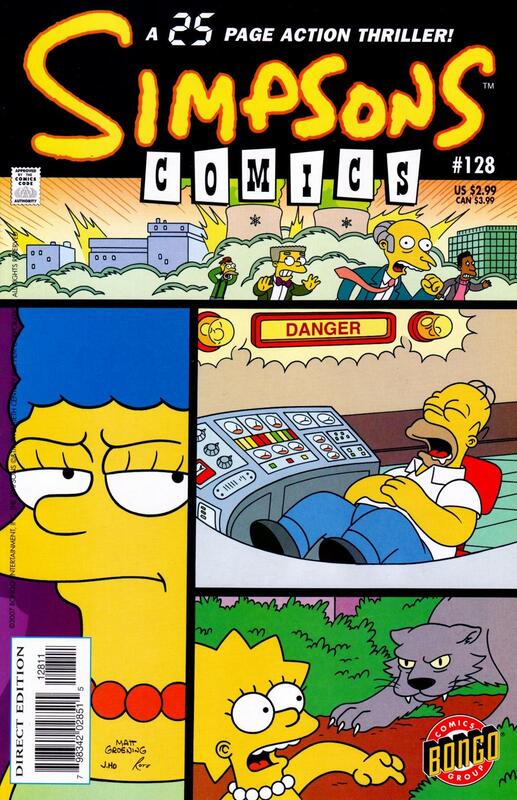 Simpsons Comics 17 What's the Frequency, Simpson? 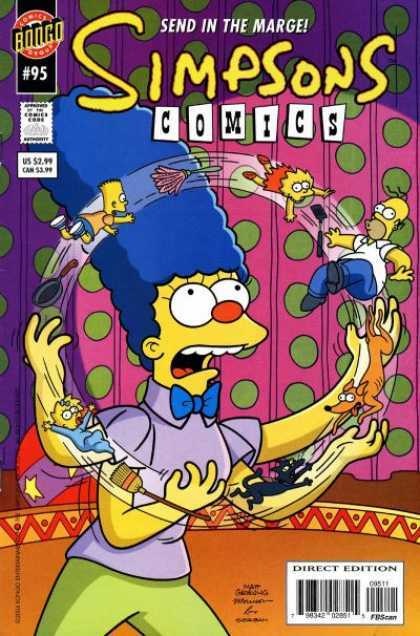 Simpsons Comics 25 Marge Attacks! 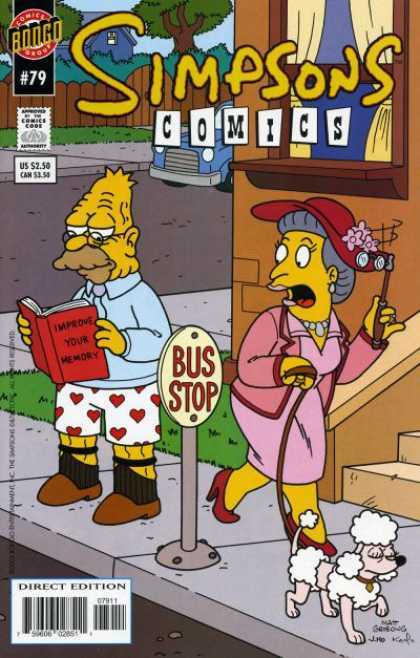 Simpsons Comics 26 Get off the Bus! 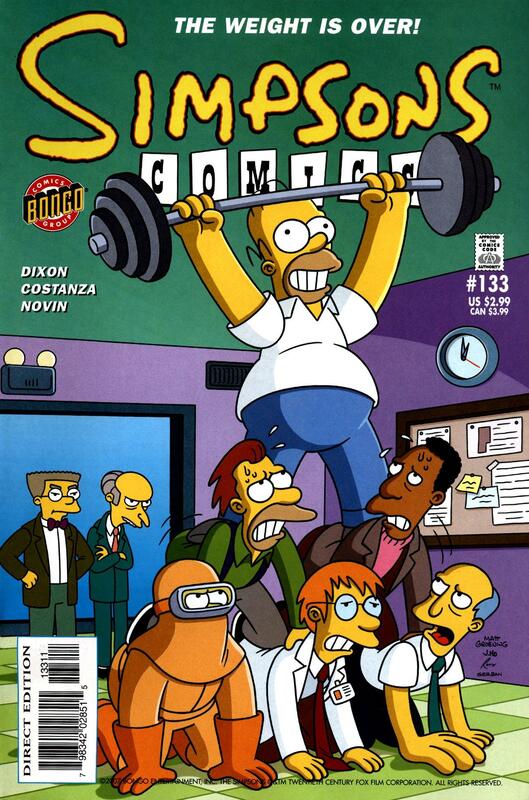 Simpsons Comics 27 They Fixed Homer's Brain! 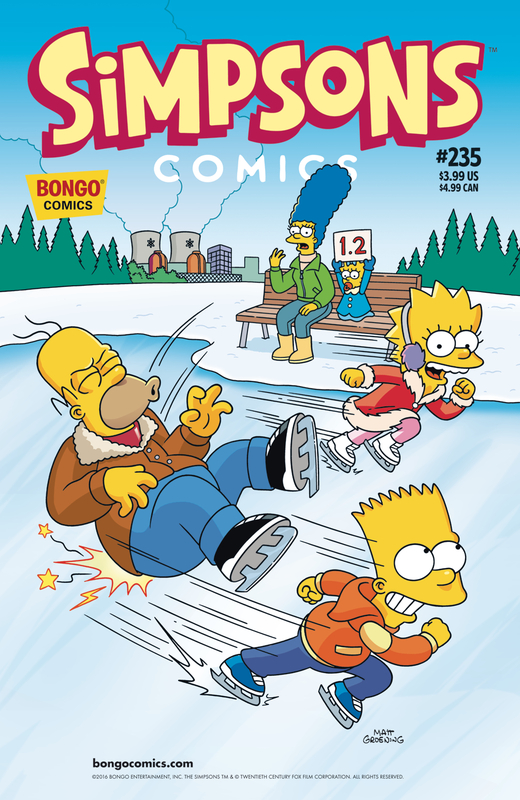 Simpsons Comics 29 Let's Get Ready to Bumble! 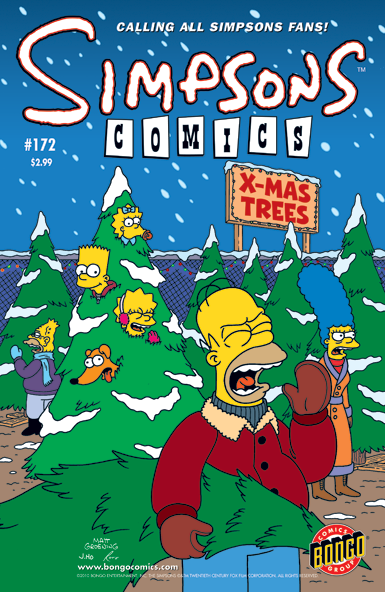 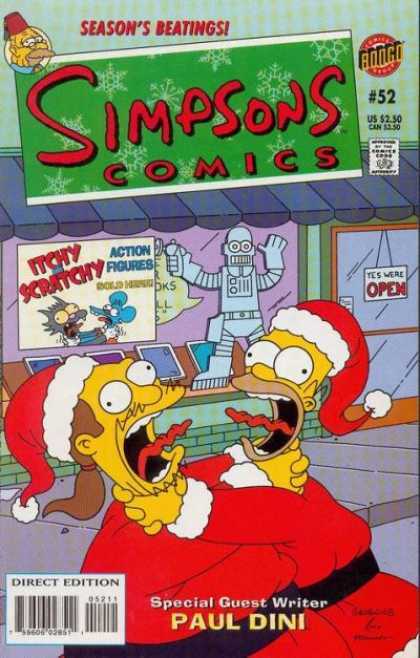 Simpsons Comics 52 Worst Christmas Ever! 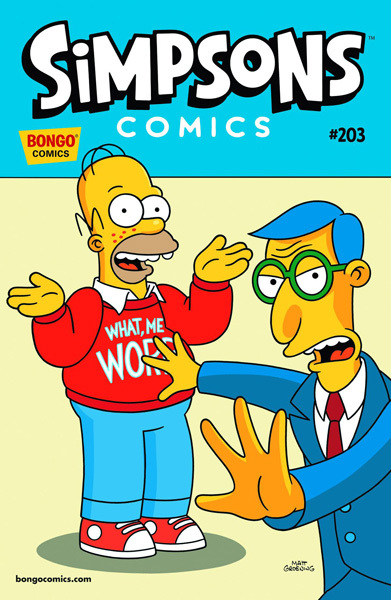 Simpsons Comics 57 How the Vest Was Won! 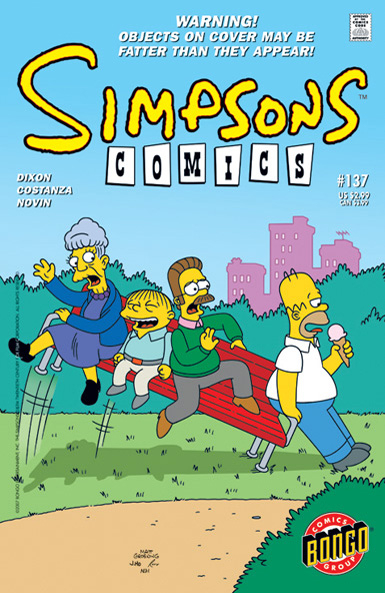 Simpsons Comics 67 Growing Pains! 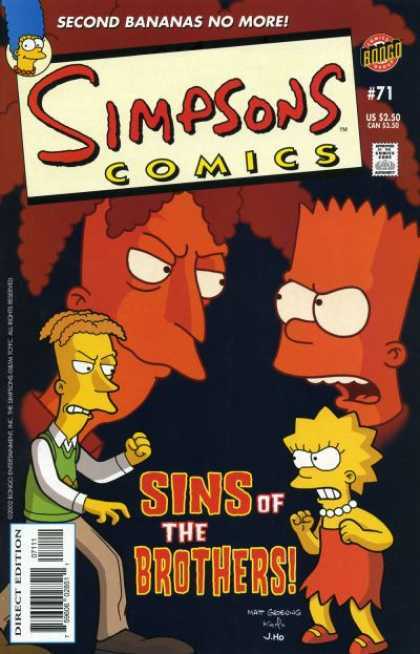 Simpsons Comics 68 Merchants of Vengeance! 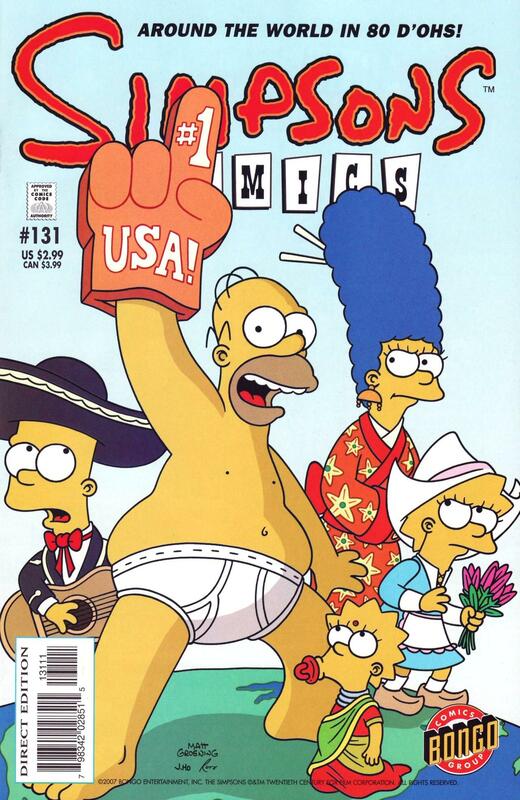 Simpsons Comics 131 The Simpsons Comics Internationale! 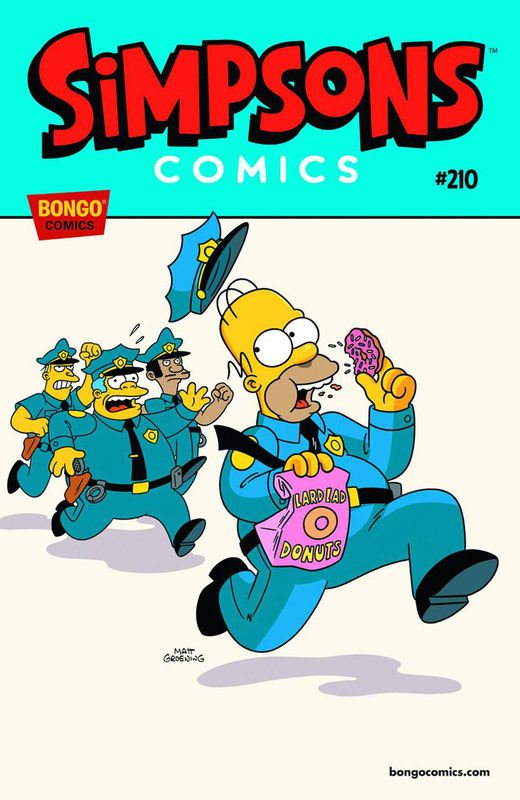 Too Crazy Juvenile Prankster: Bartomu! 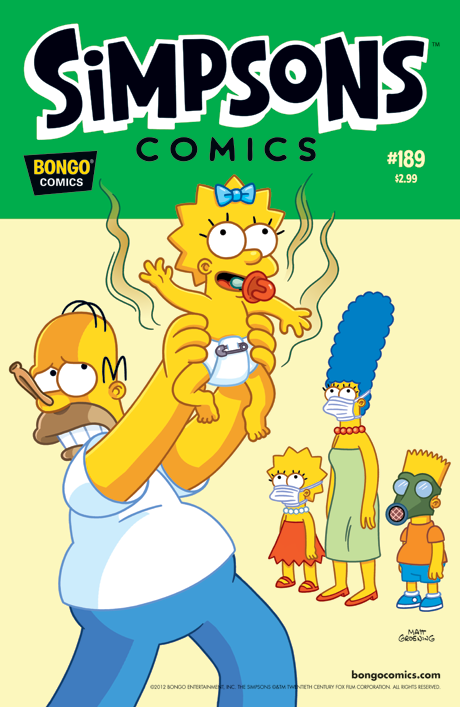 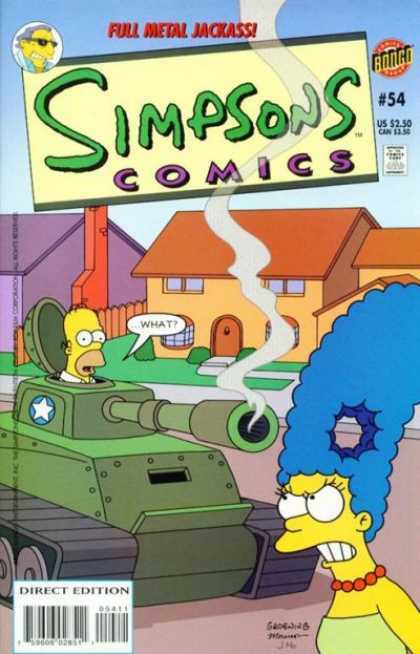 Simpsons Comics 144 War Is Smelly! 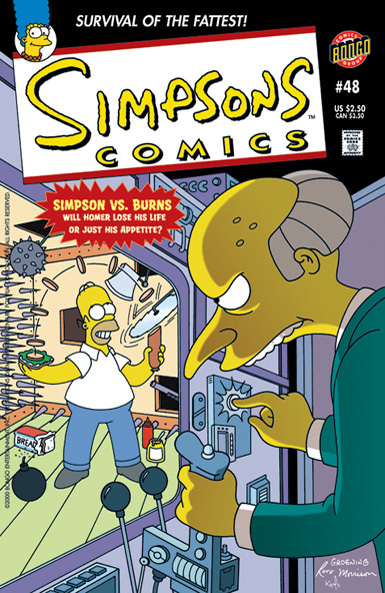 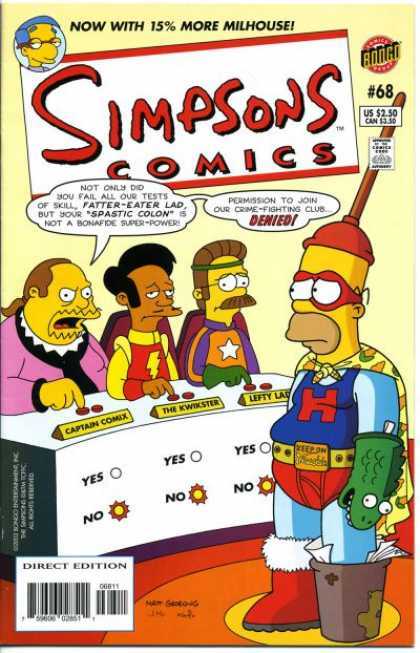 Simpsons Comics 145 Worst Competition Ever! 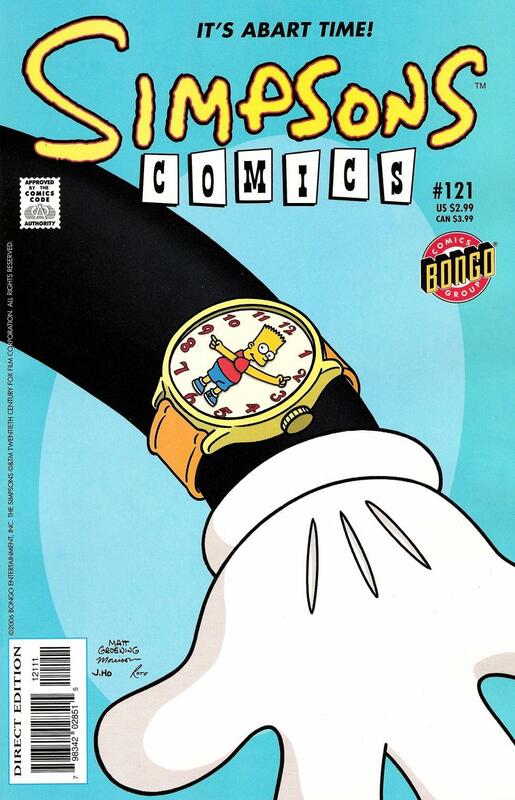 Simpsons Comics 179 Scam Wow! 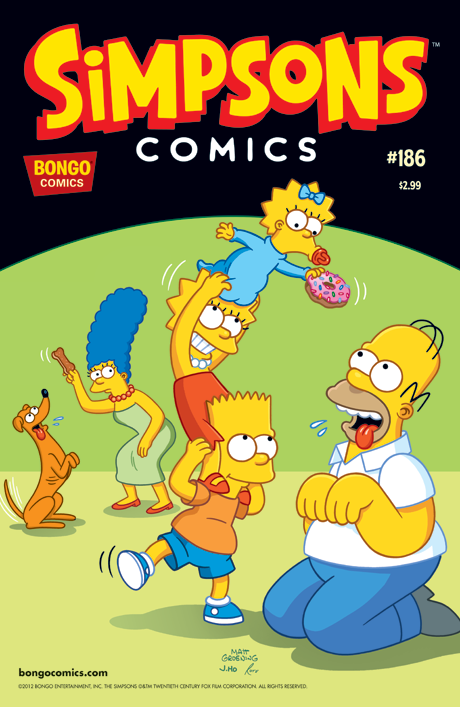 Simpsons Comics 183 Everything's Bartchie! 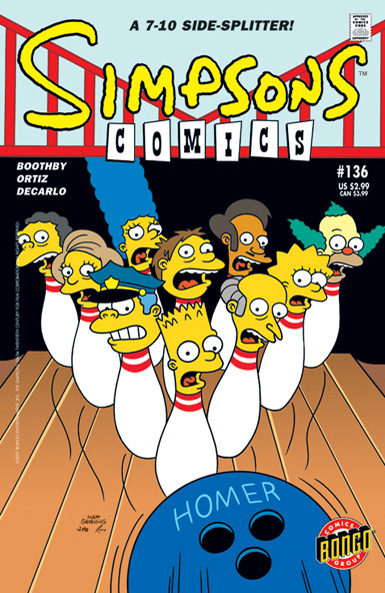 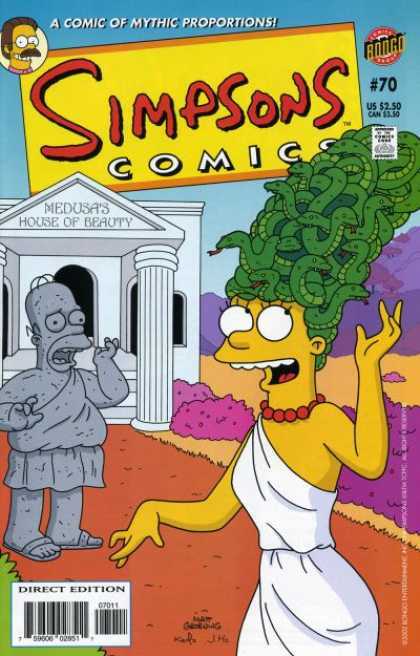 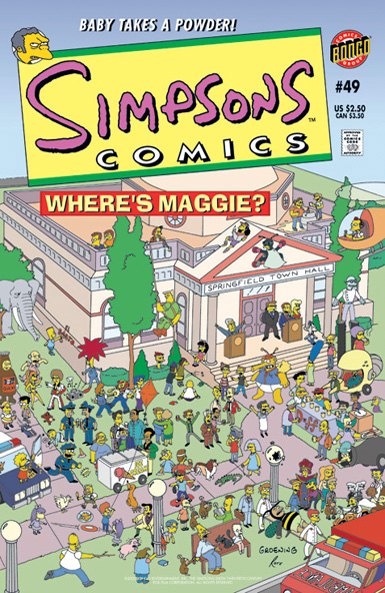 Simpsons Comics 200 Mass Historia! 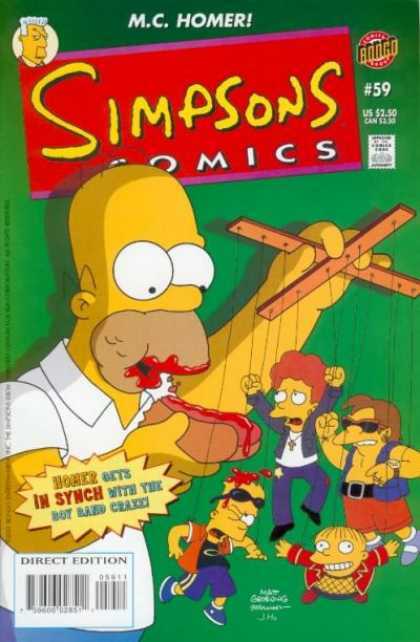 Be Aware, Play with Care! 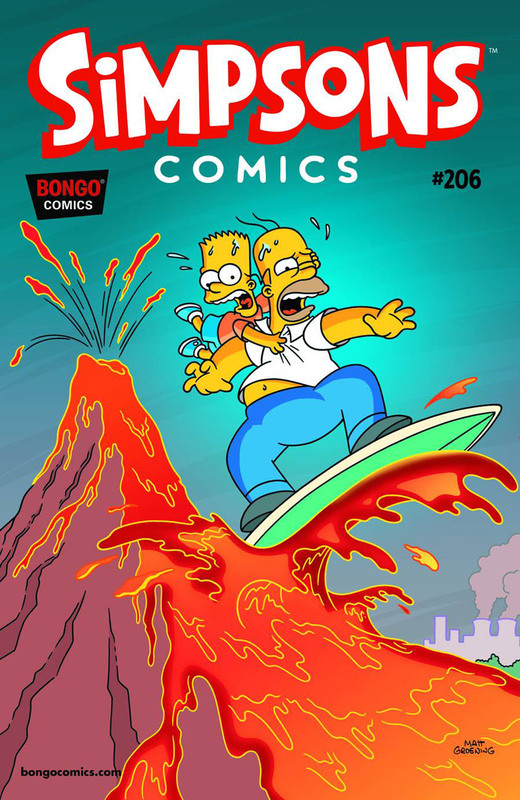 Simpsons Comics 203 The Rise and Fall of D'oh! 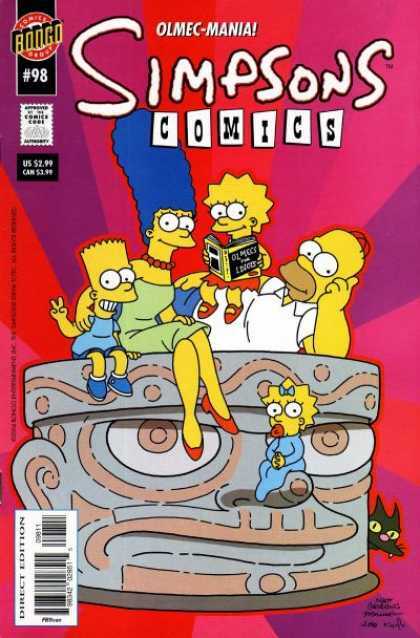 Simpsons Comics 211 Lo, There Shall Come a Bookend Sequence! 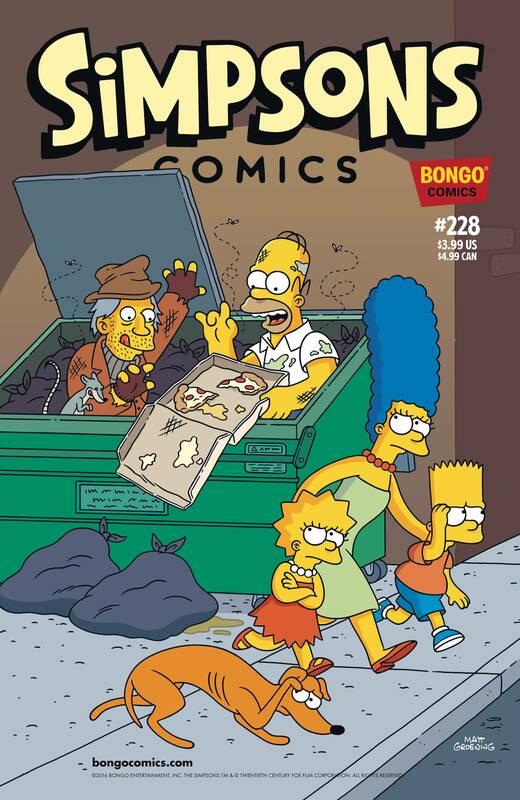 Simpsons Comics 228 Dumpster Divers! 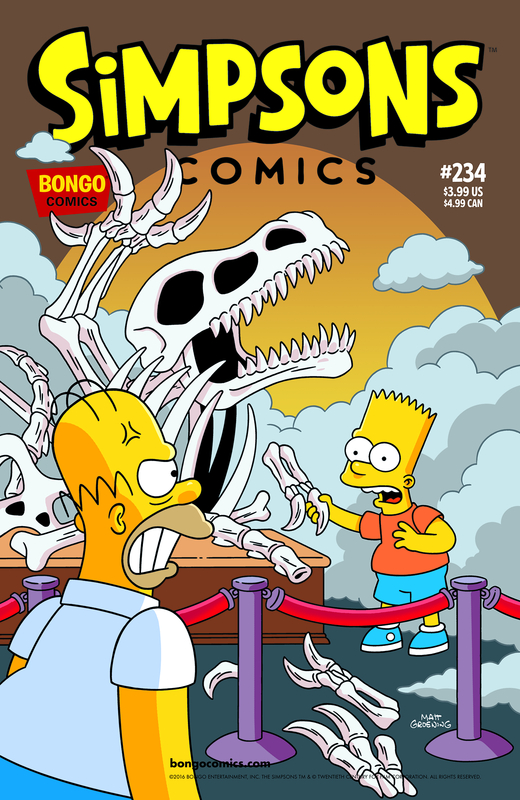 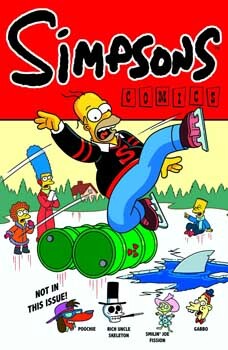 Simpsons Comics 230 Game On! 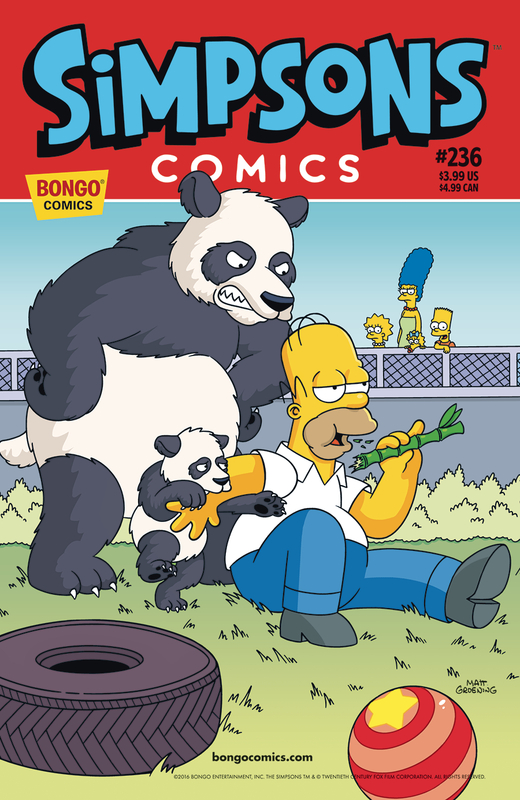 Simpsons Comics 236 Bear Patrol III: Panda-monium! 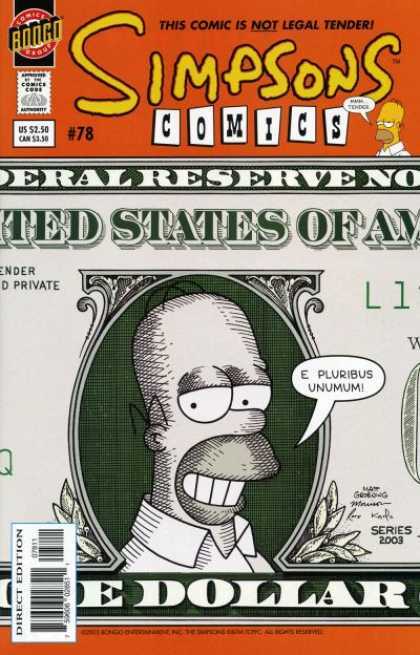 Modified on April 17, 2019, at 10:19.